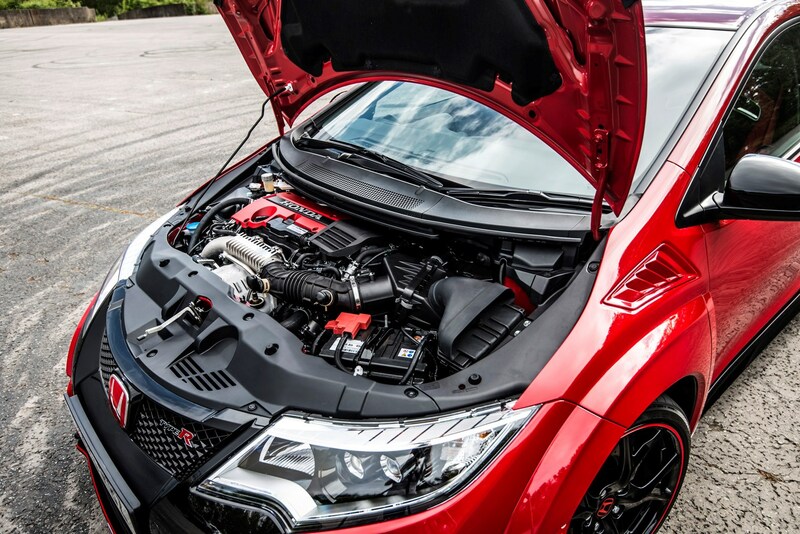 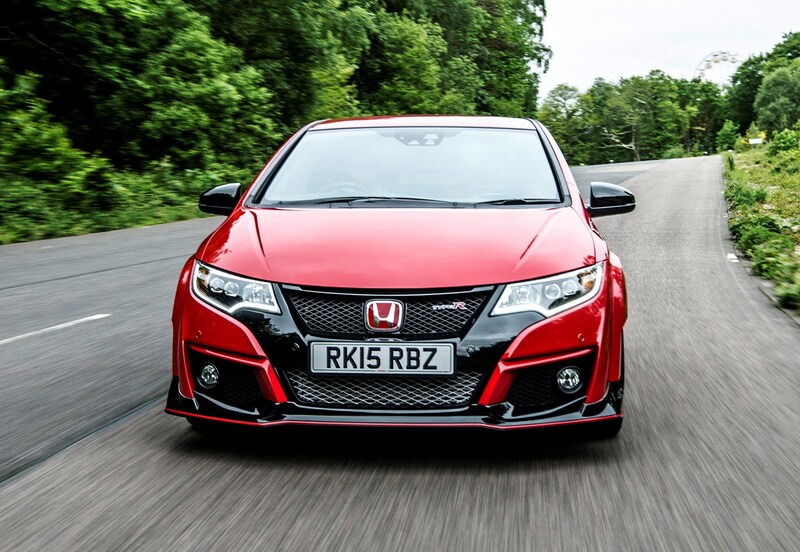 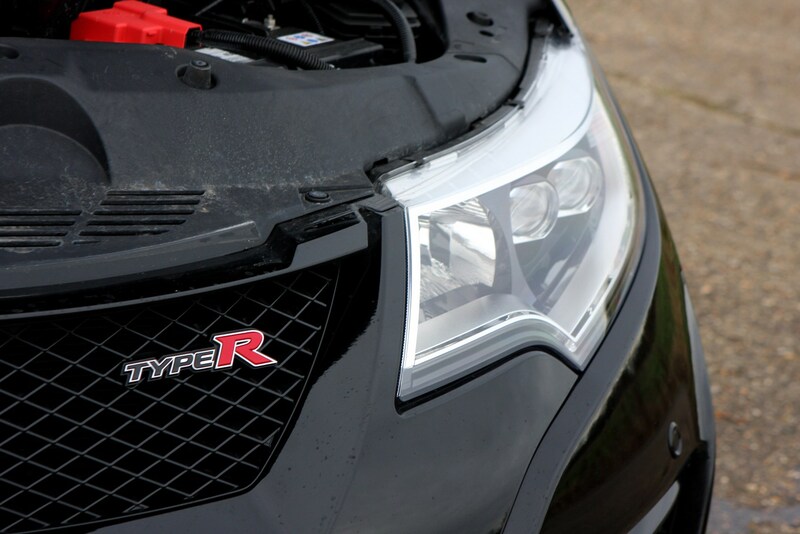 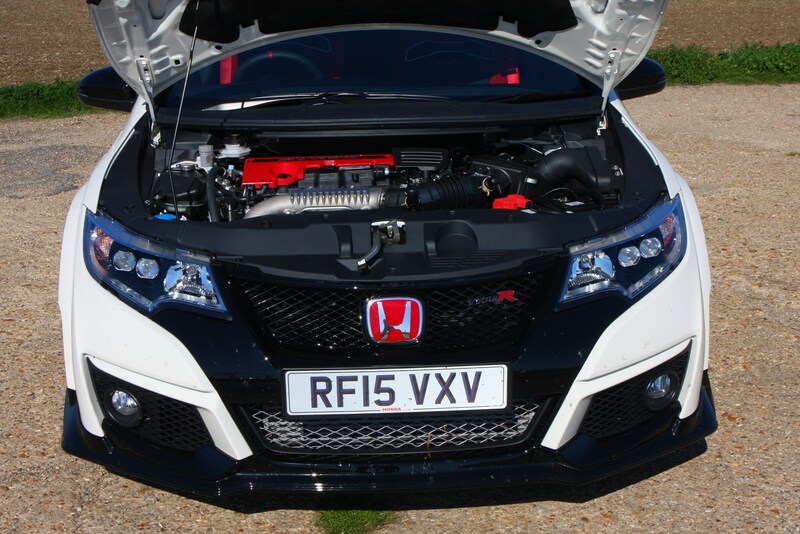 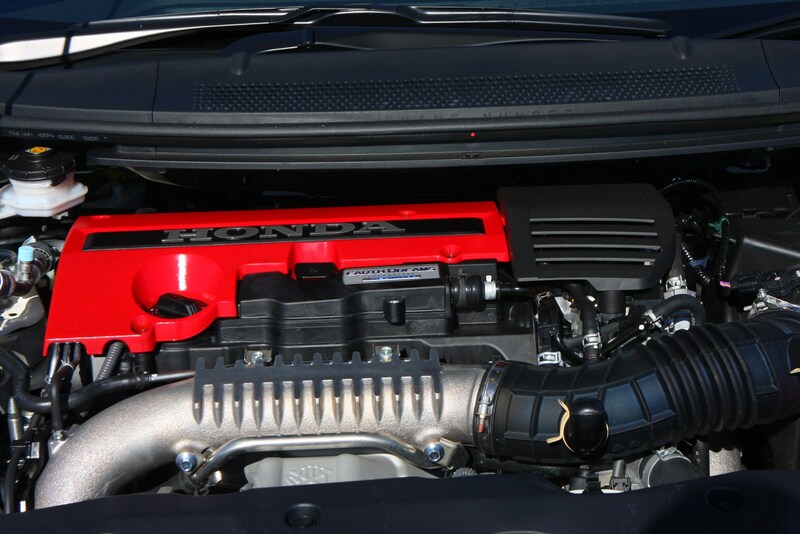 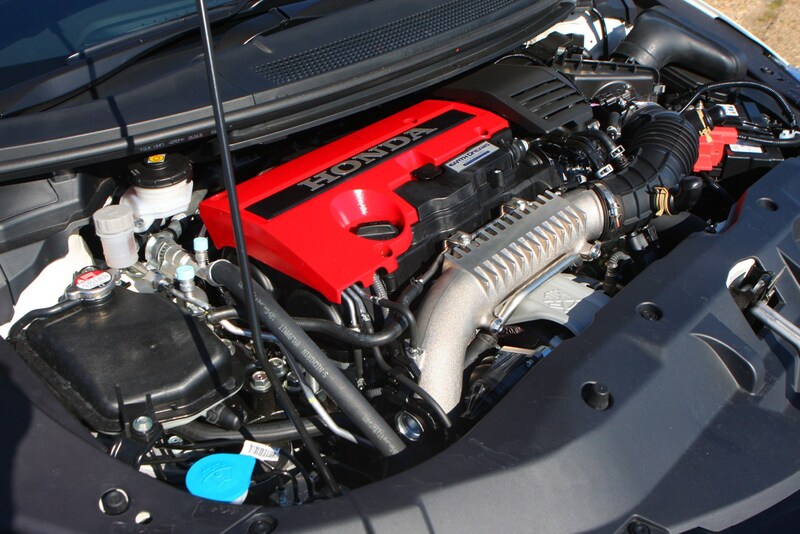 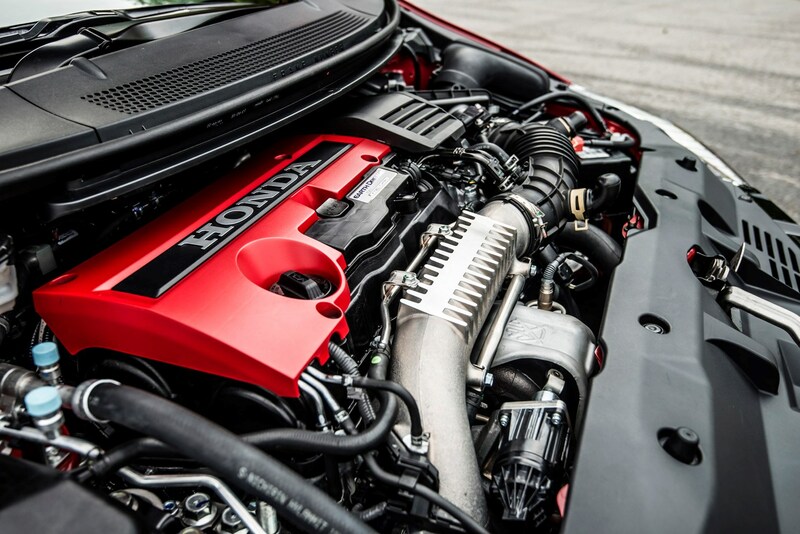 Previously Honda Civic Type R performance was all delivered at the very top-end of the engine’s rev-range, with the VTEC system starting to do its best work north of 6,000rpm. 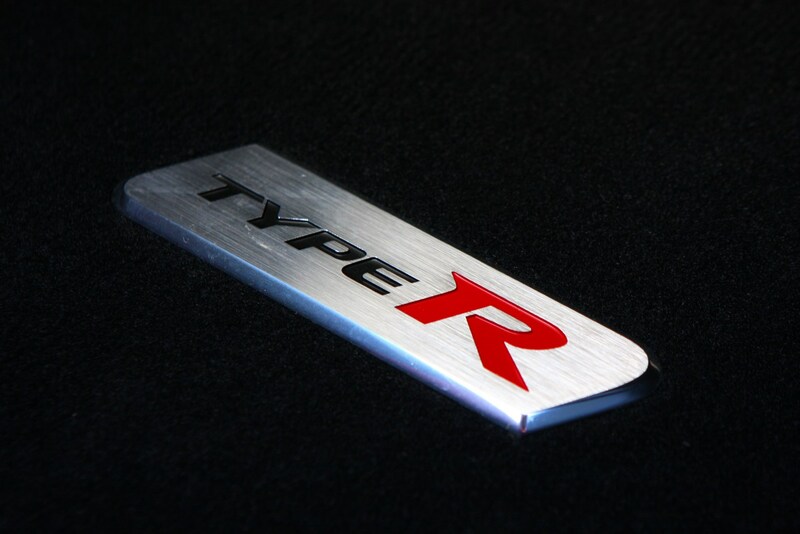 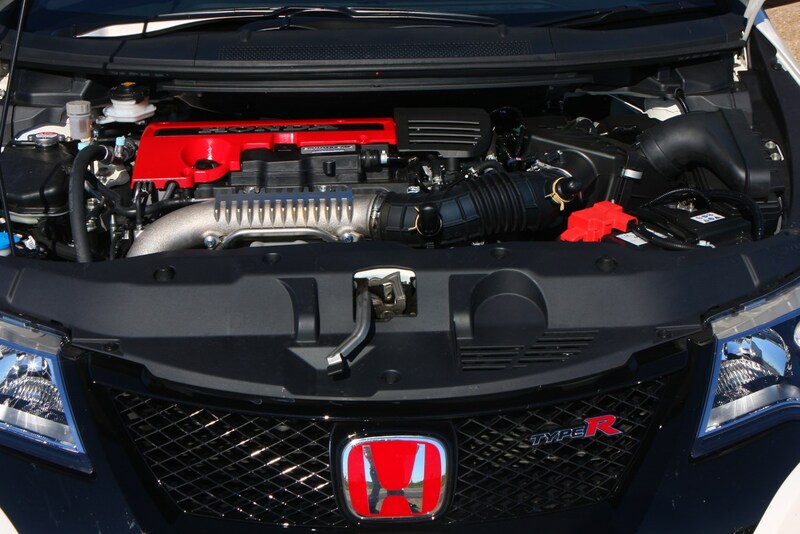 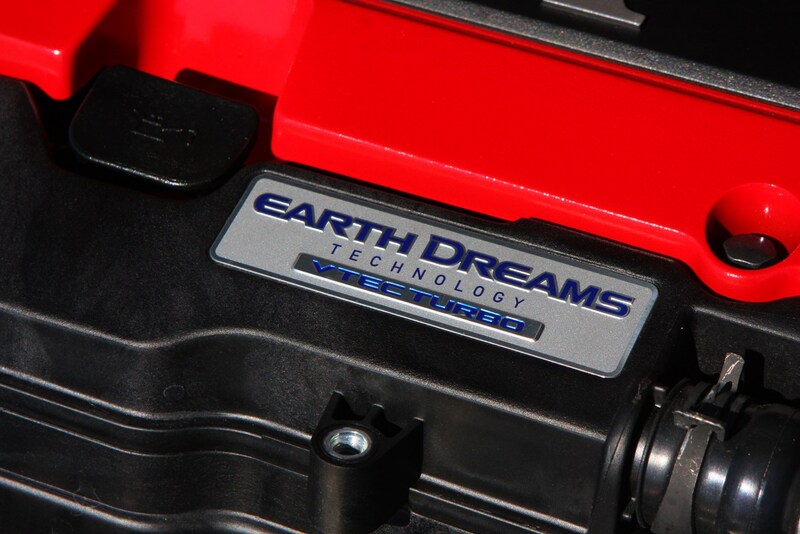 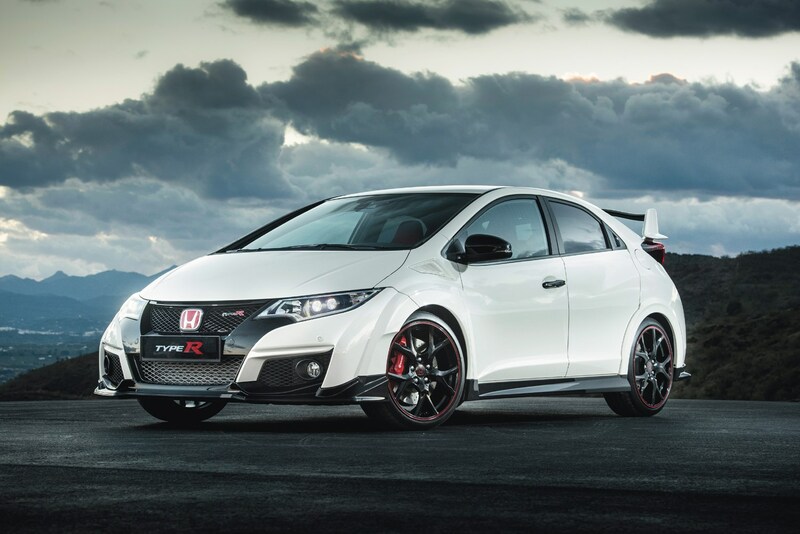 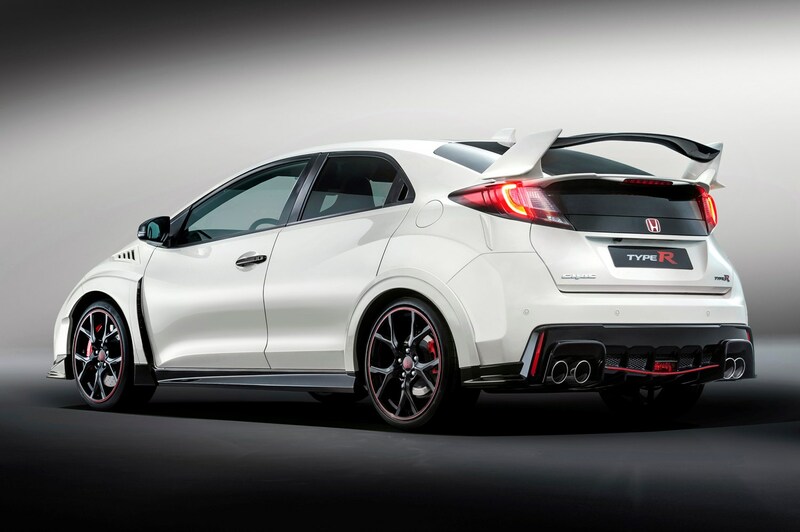 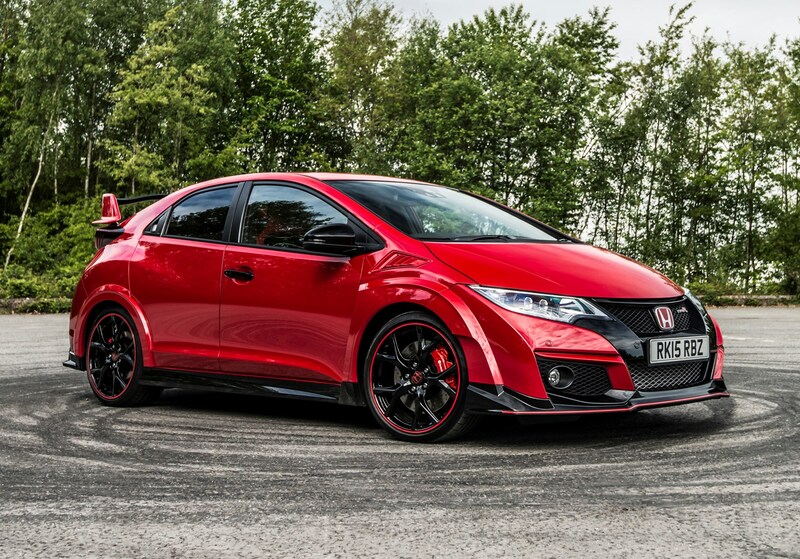 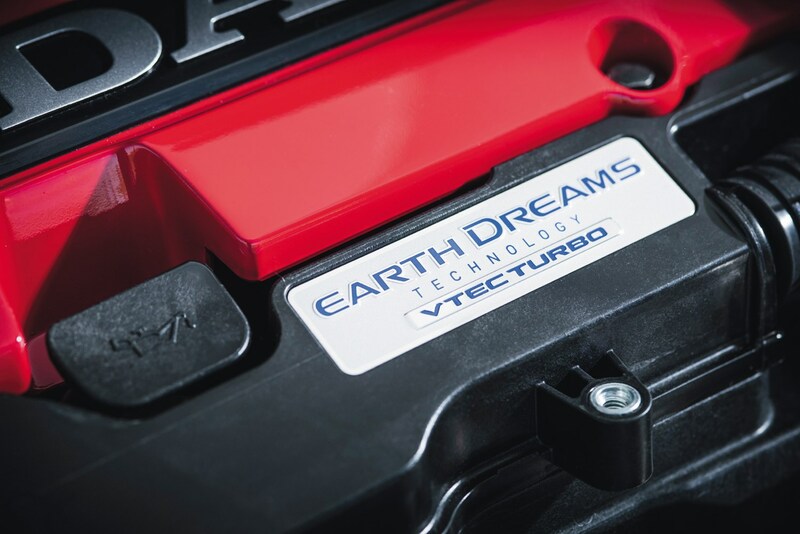 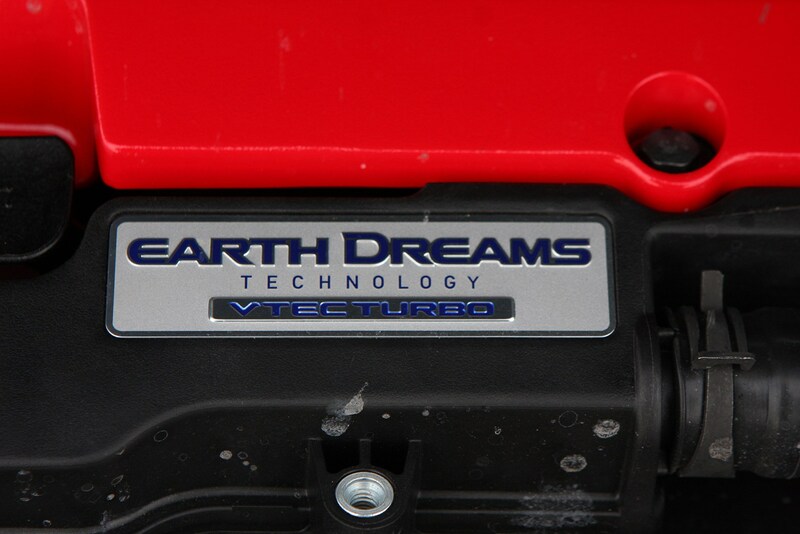 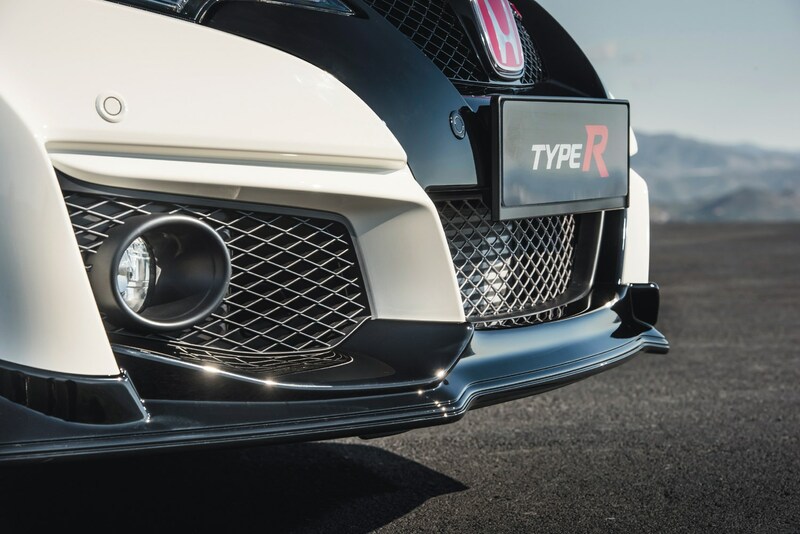 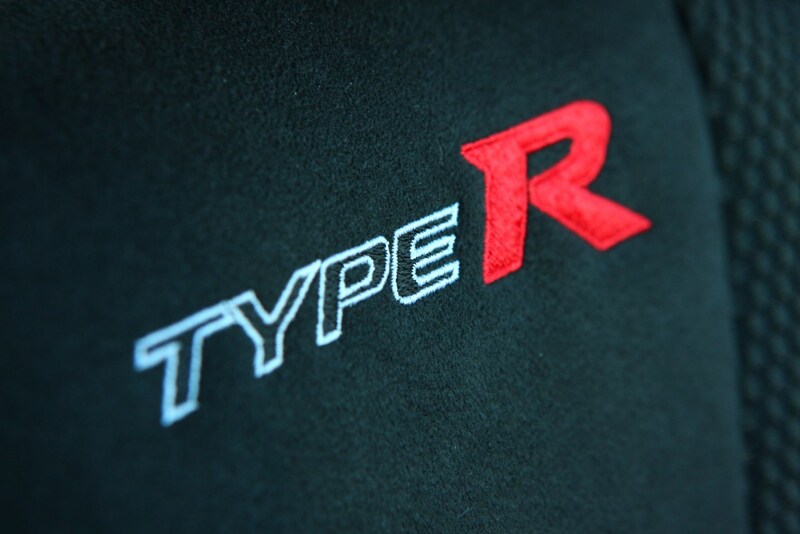 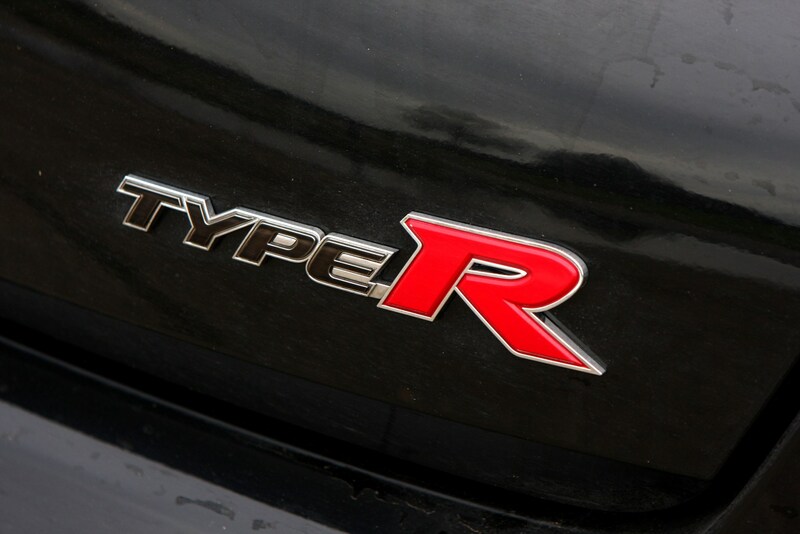 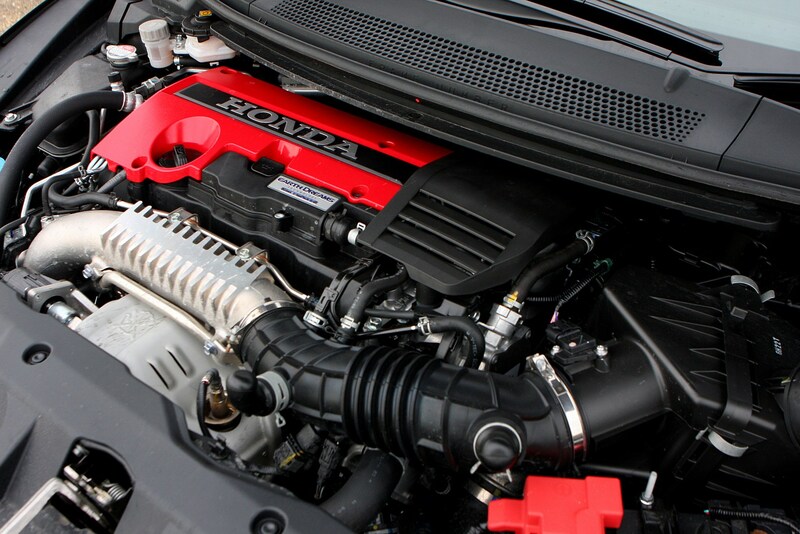 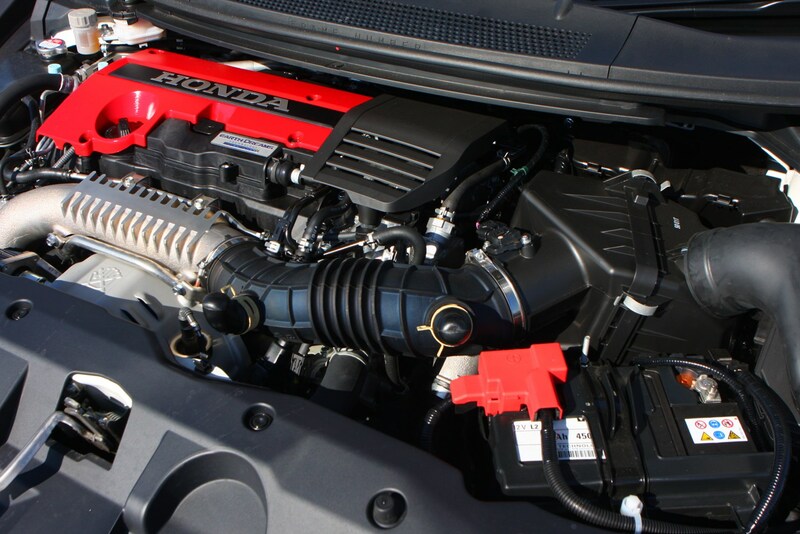 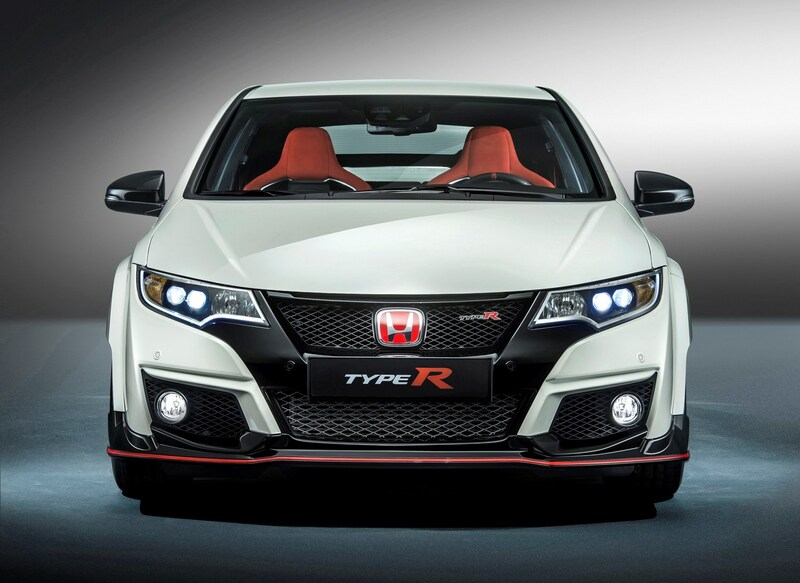 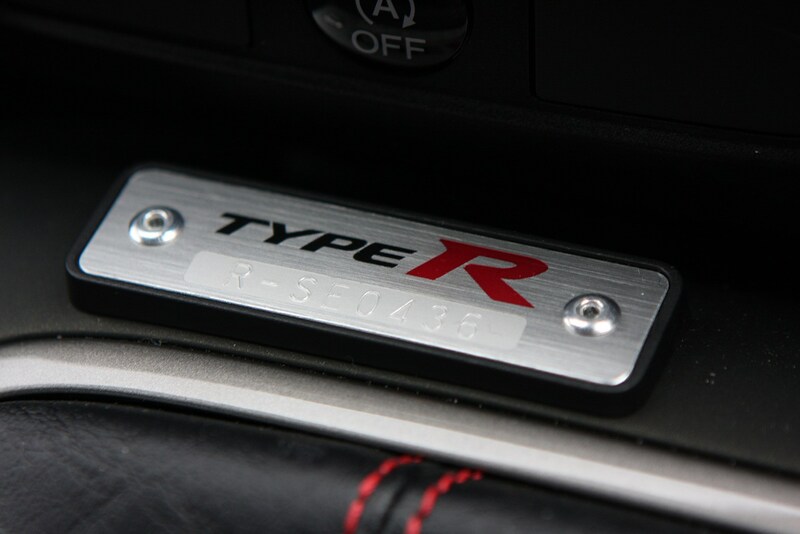 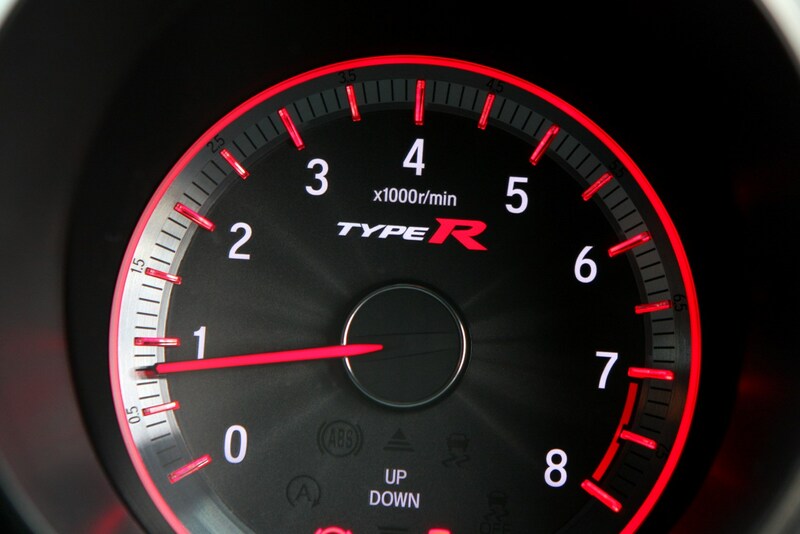 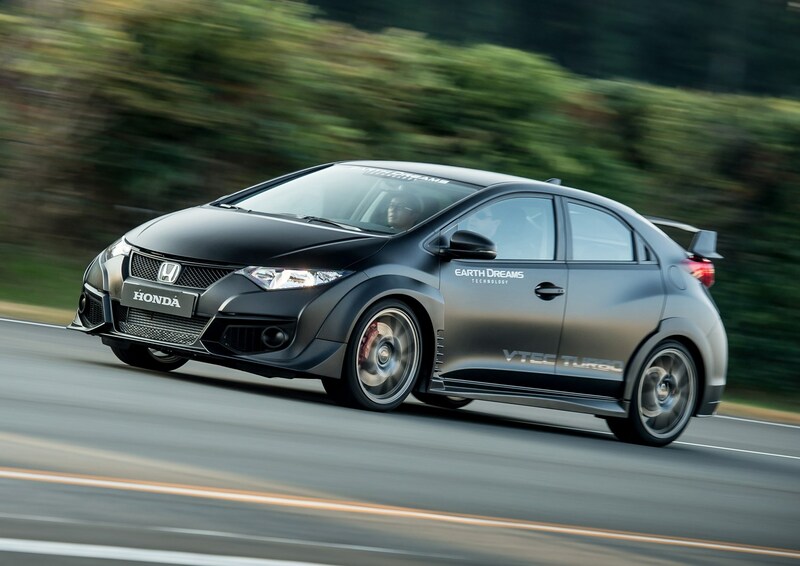 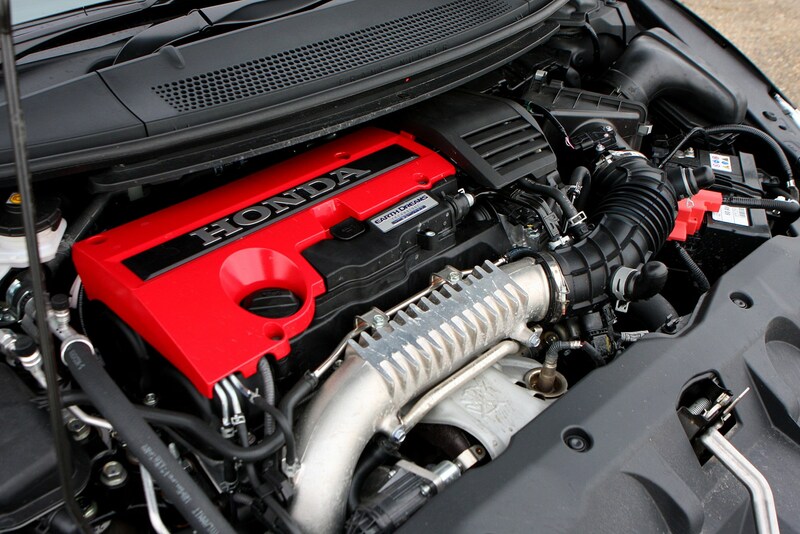 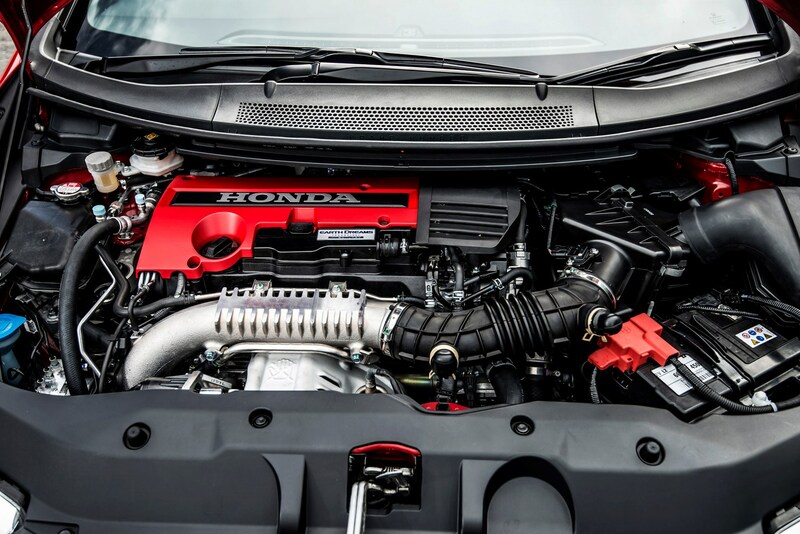 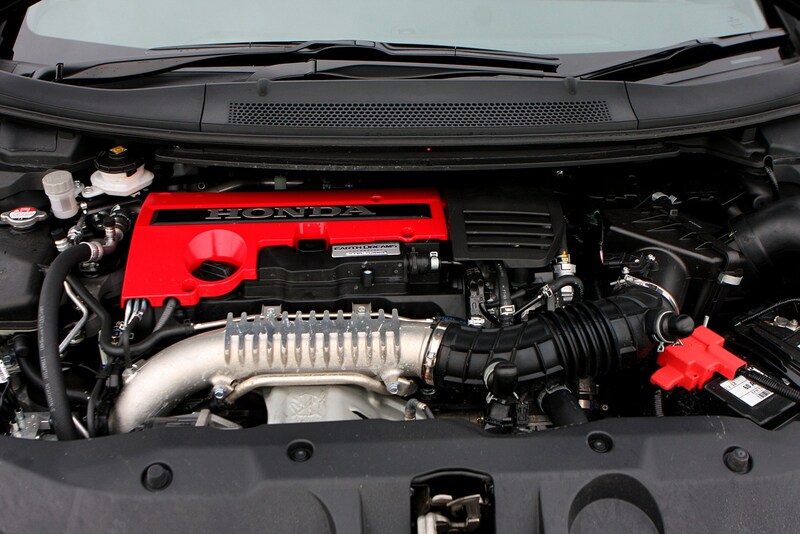 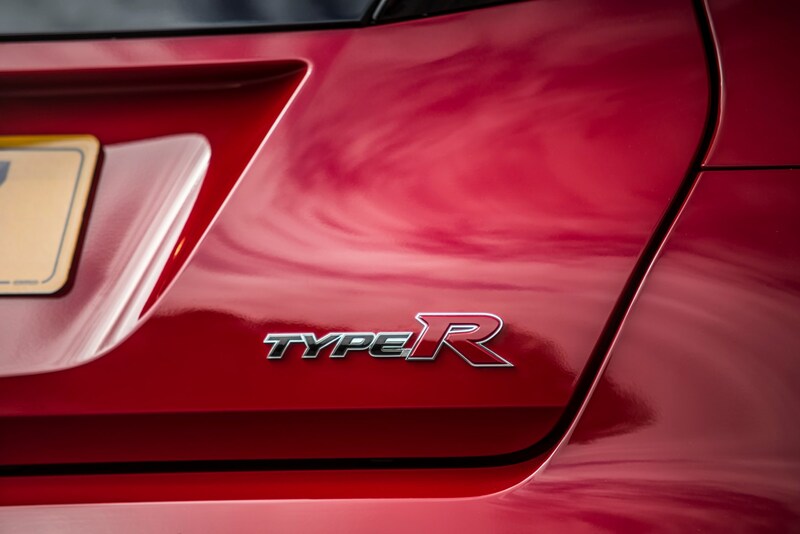 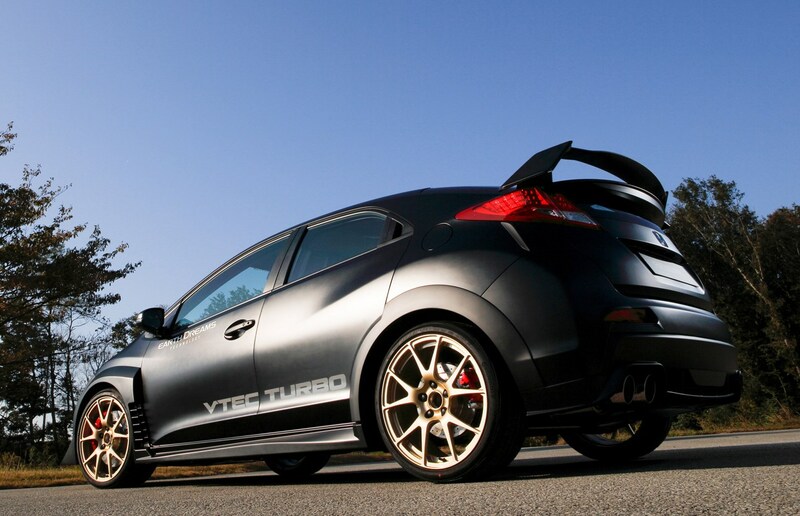 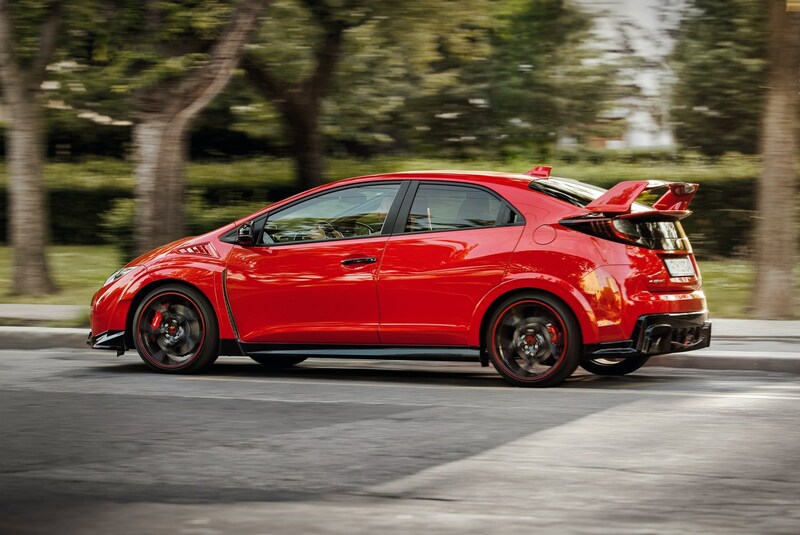 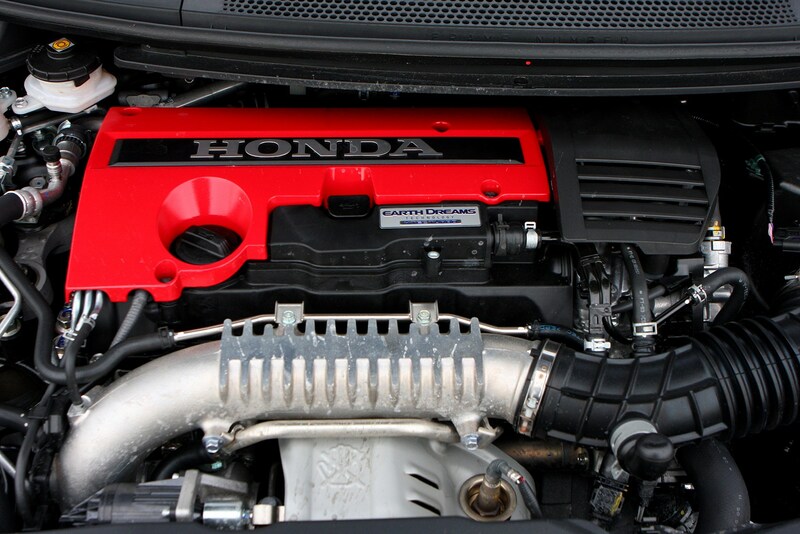 But this is the first time that clever VTEC technology has been married to a turbocharger, and the result is this generation of Type R makes its peak power at 6,500rpm and, more tellingly, its 400Nm of torque from just 2,500rpm. 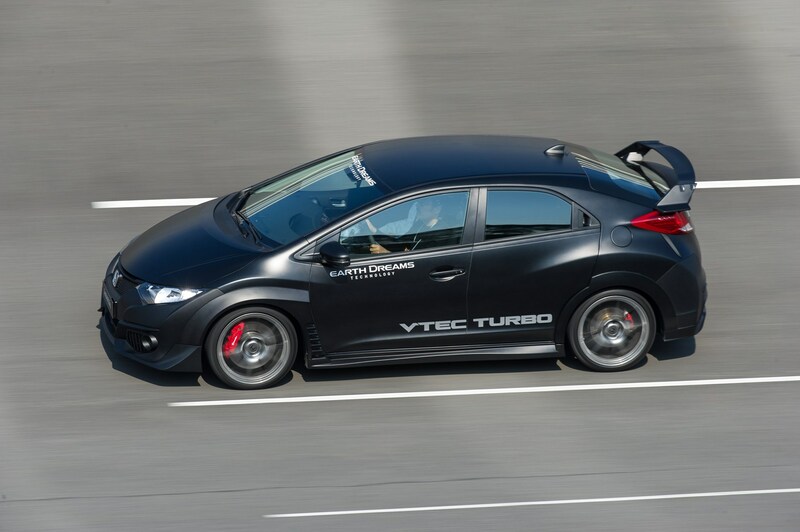 It’s a single-scroll turbocharger, and by using the VTEC and variable timing systems, the car fills in the power lower down the rev range. 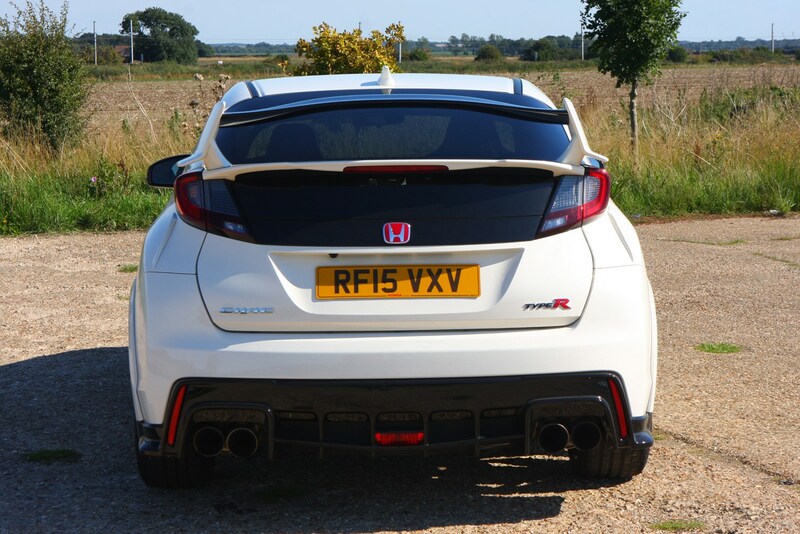 Certainly, compared to the rather frenetic delivery of previous models this car is like night and day, and where previously you’d have been reaching for a lower gear to bounce the revs off the limiter, making the most of the performance on offer, it’s simply not necessary on this car. 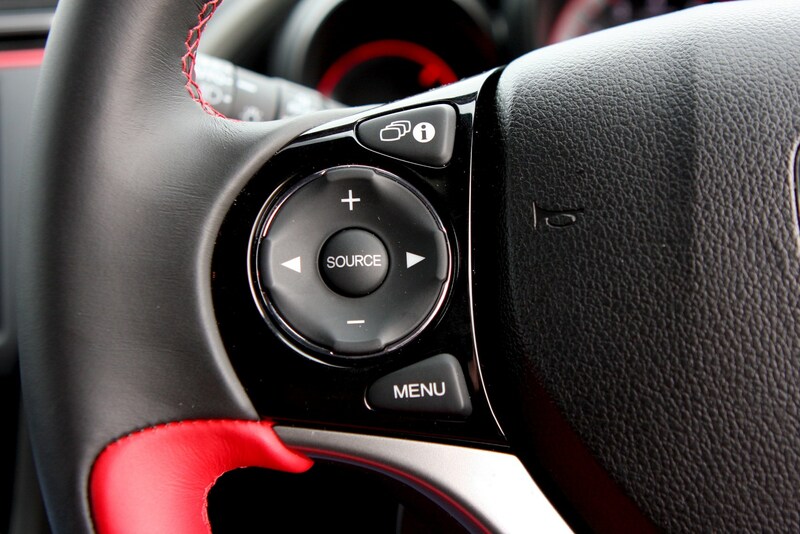 In fact, it’s a much lazier car to pedal. 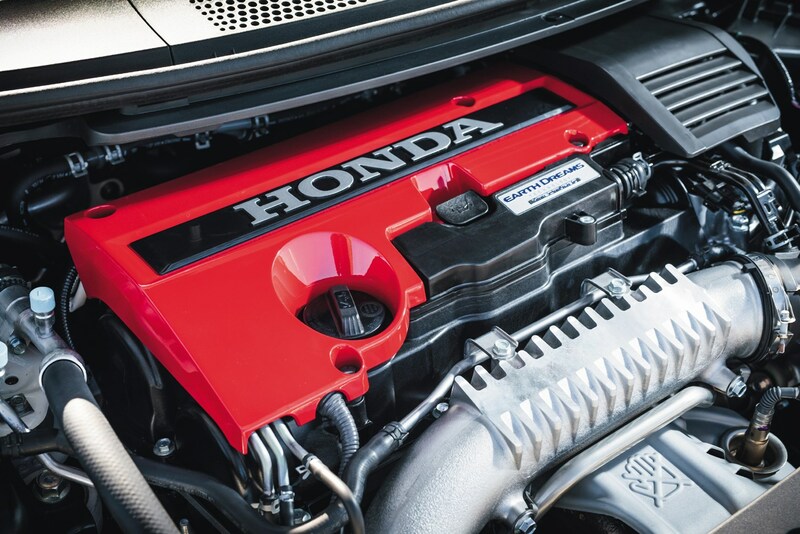 But with this added mid-range punch, there is a compromise to be made, and this 2-litre turbocharged engine misses out on the previous car’s character. 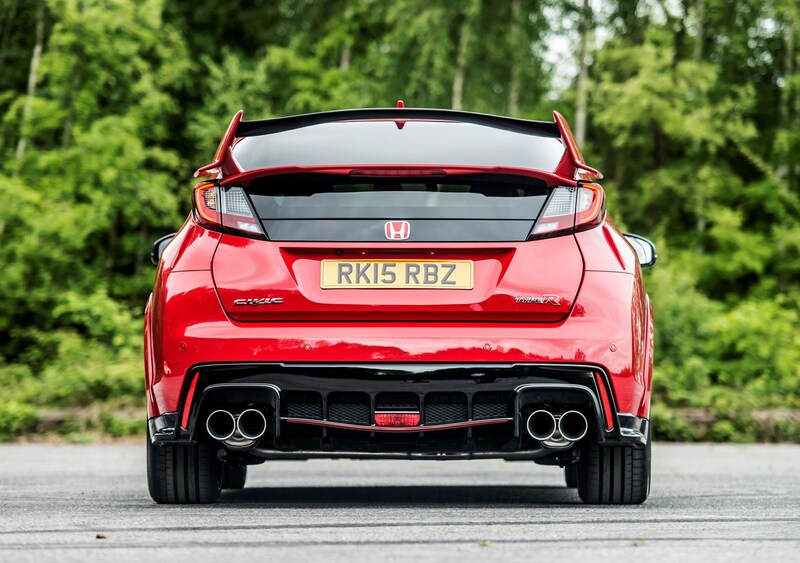 There’s no noticeable change in the delivery of the power as the revs climb, no dramatic change to the induction or exhaust note, and none of the racing to the redline. 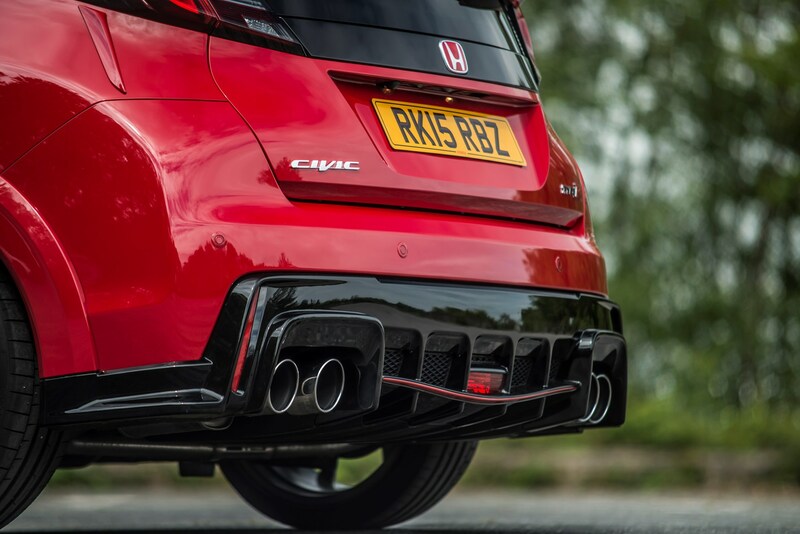 Disappointingly it sounds strained rather than delighted to be north of 5,500rpm and the meaty exhaust note soon degenerates to a booming background at a cruising speeds. 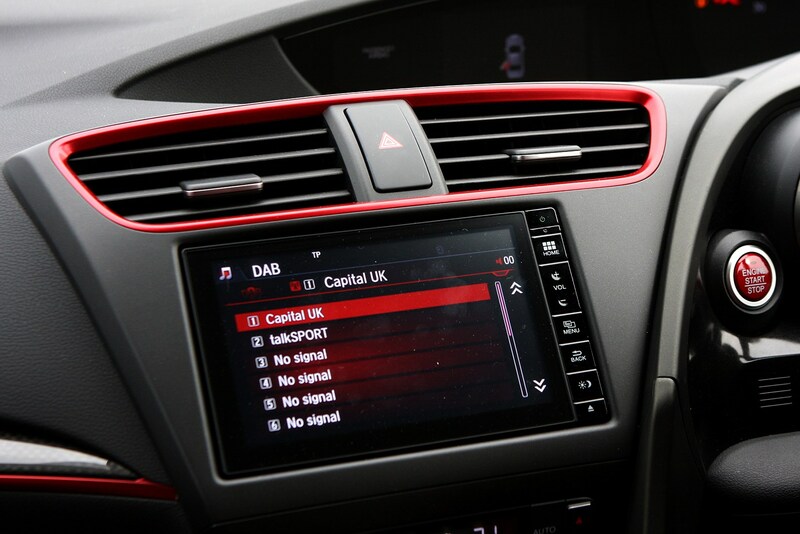 There’s some fizz and resonance to be felt through the controls too, though this may have been more indicative of our car’s pre-production specification than anything else. 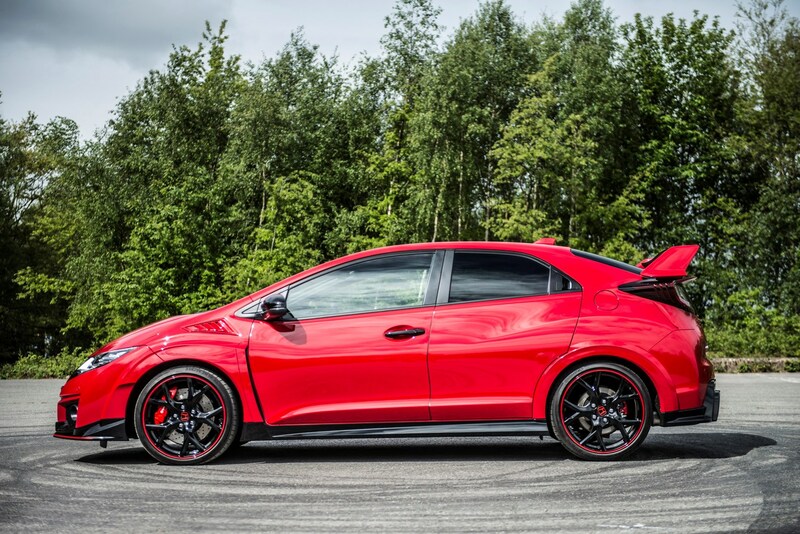 Honda has always been famed for its superb gearboxes though, and this car is no different. 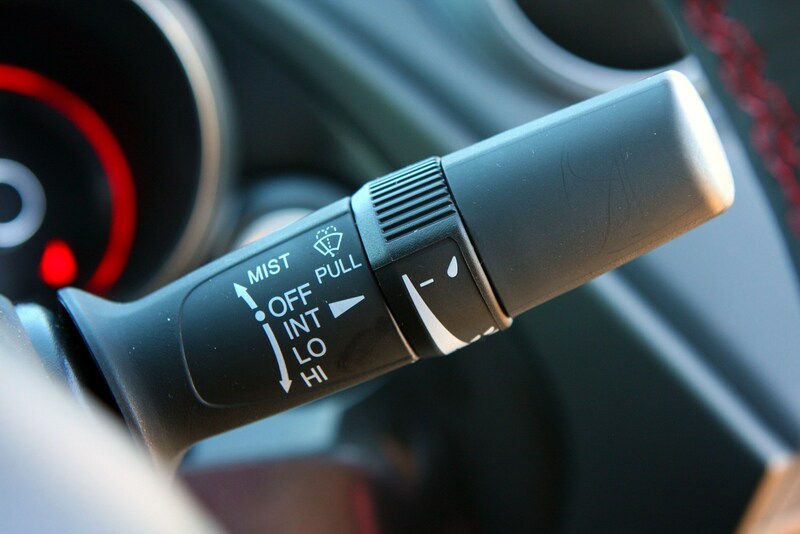 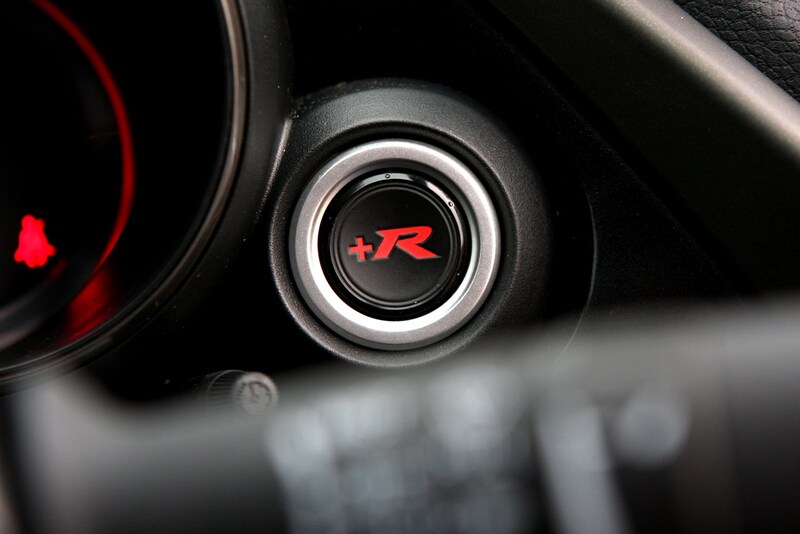 The shift stroke is only 40mm, said to be the shortest in its class, and it certainly feels it on the road. 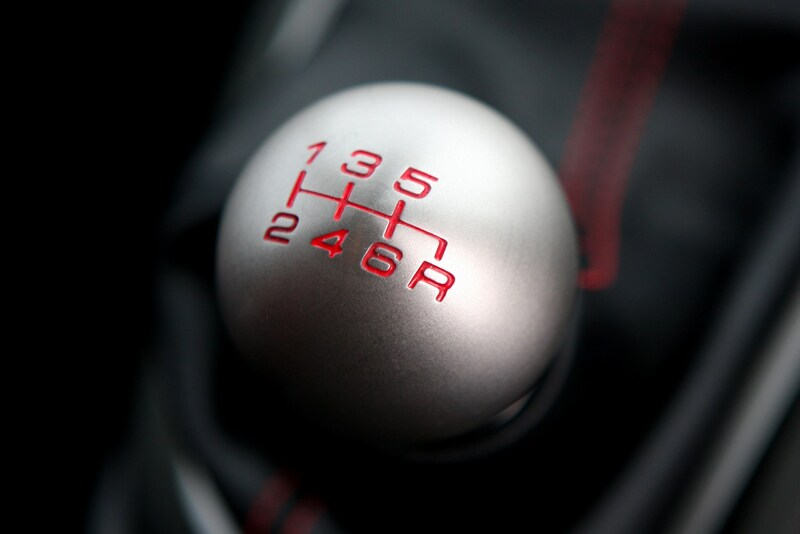 Swapping between cogs is delightfully precise, with a mechanical feel to the shift missing from many rivals. 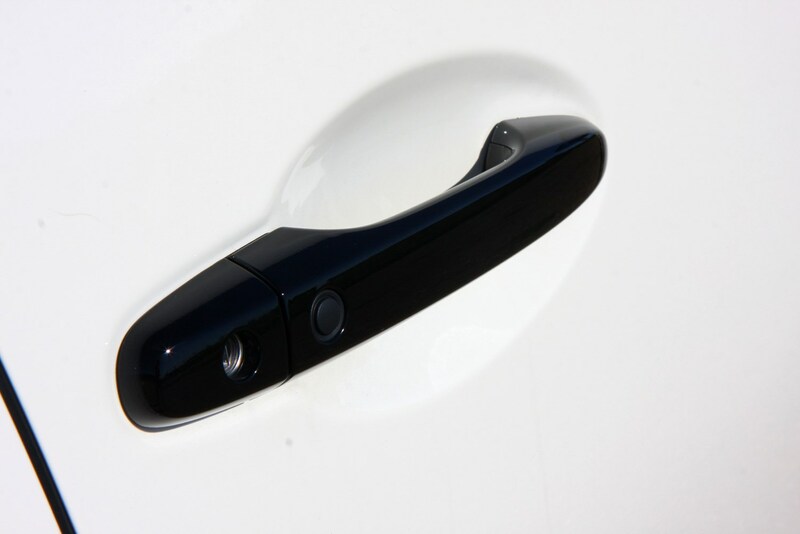 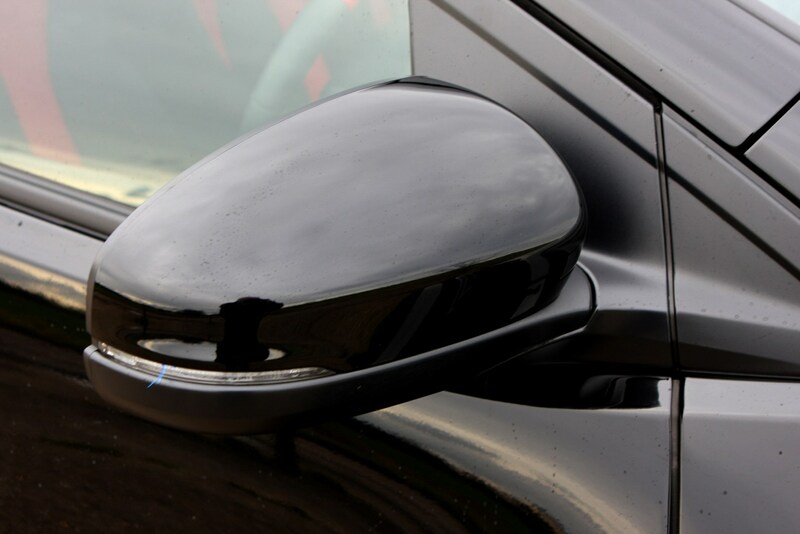 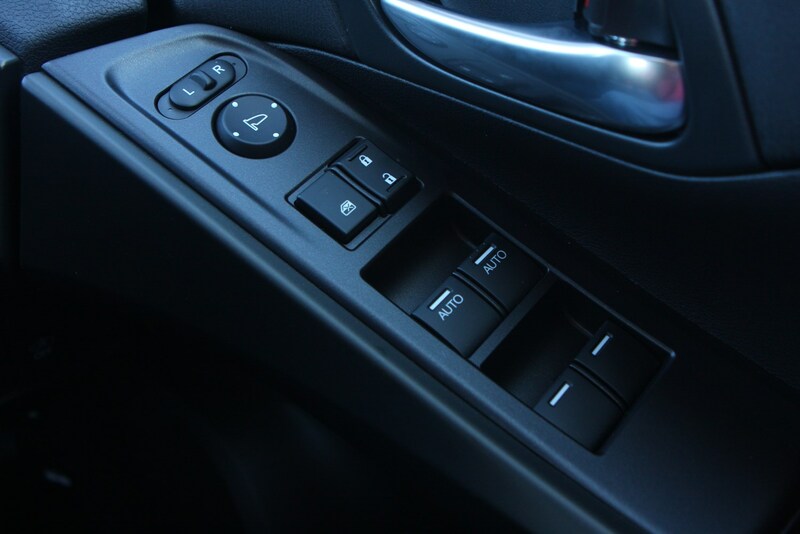 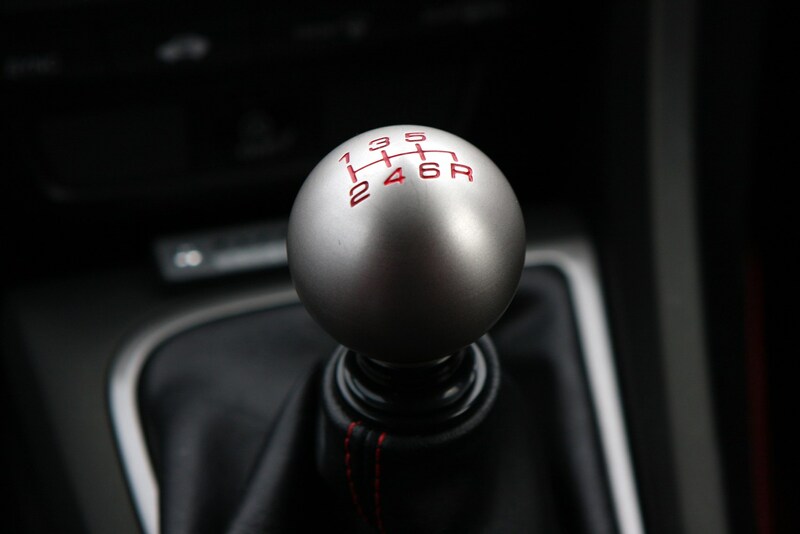 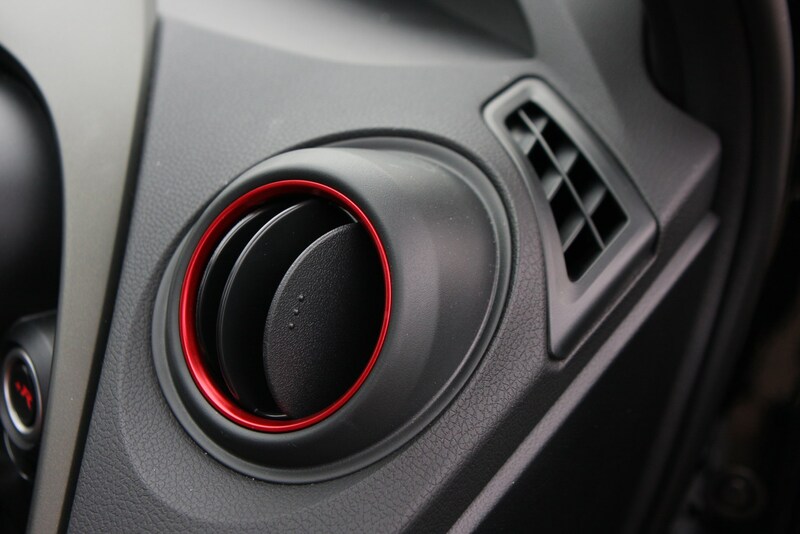 Its simple, rounded, brushed metal gear knob looks and feels great too, though we know from experience that in extreme temperatures (depth of winter and height of summer) it can become uncomfortable to hold for very long. 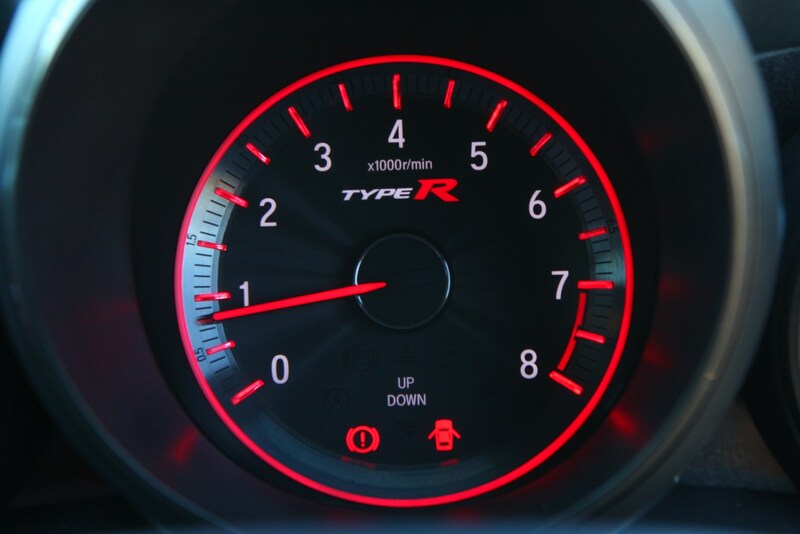 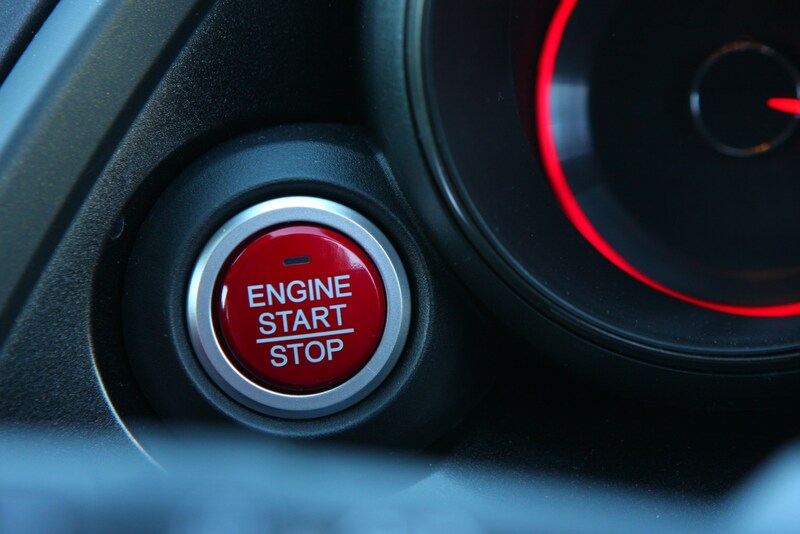 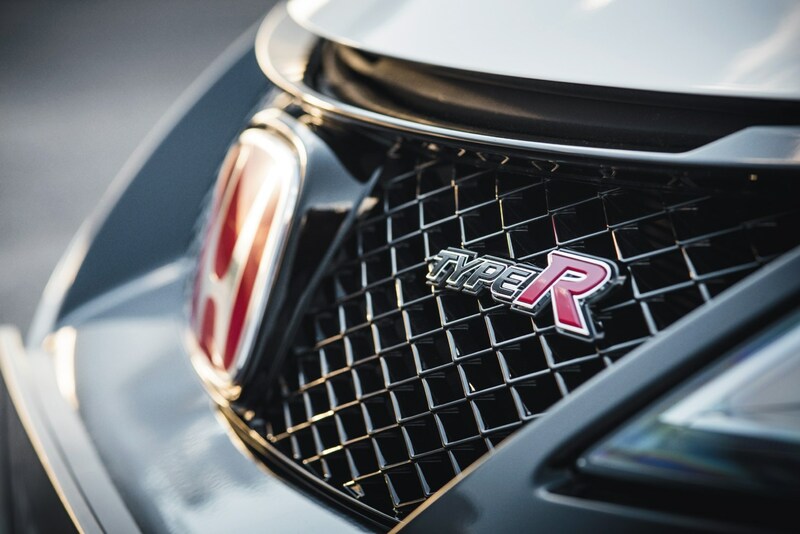 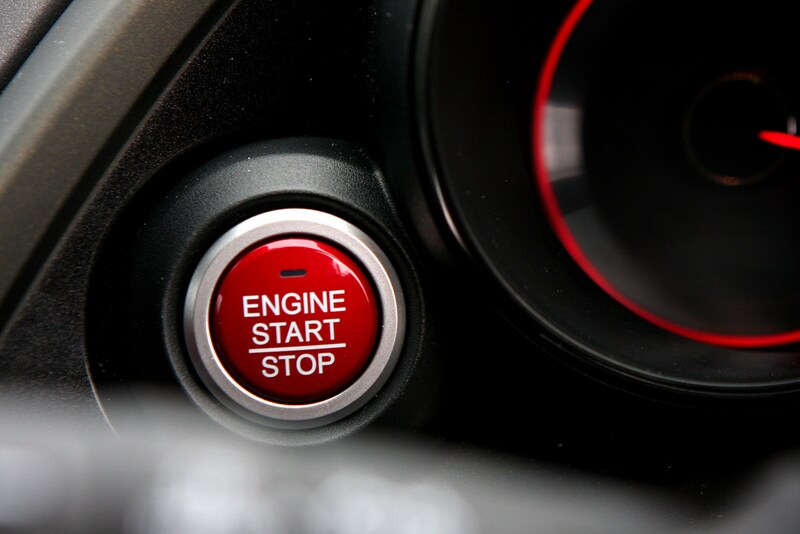 There’s no automatic option available on the Type R.
Driven hard the Honda Civic Type R will sprint from 0-62mph in 5.7 seconds and won’t stop accelerating until you nudge 167mph – making it one of the fastest hot hatches in the segment. 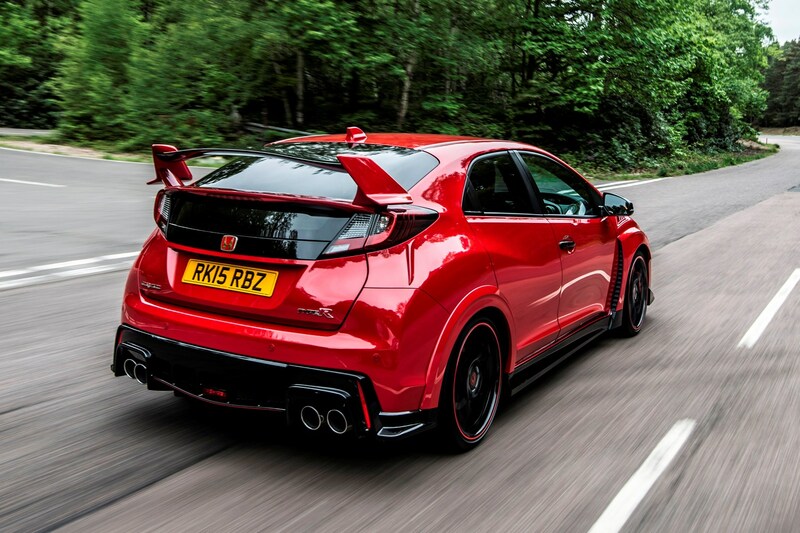 One of the first things you’ll notice about the Honda Civic Type R when you actually start driving it in anger is just how composed the chassis is, with little in the way of body roll even at ludicrous corner entry speeds. 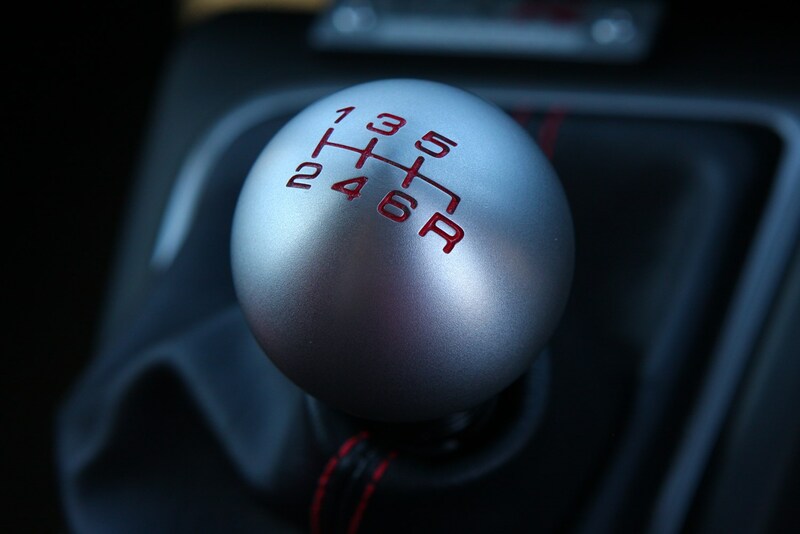 In fact, even quick-succession direction changes fail to really unsettle the car. 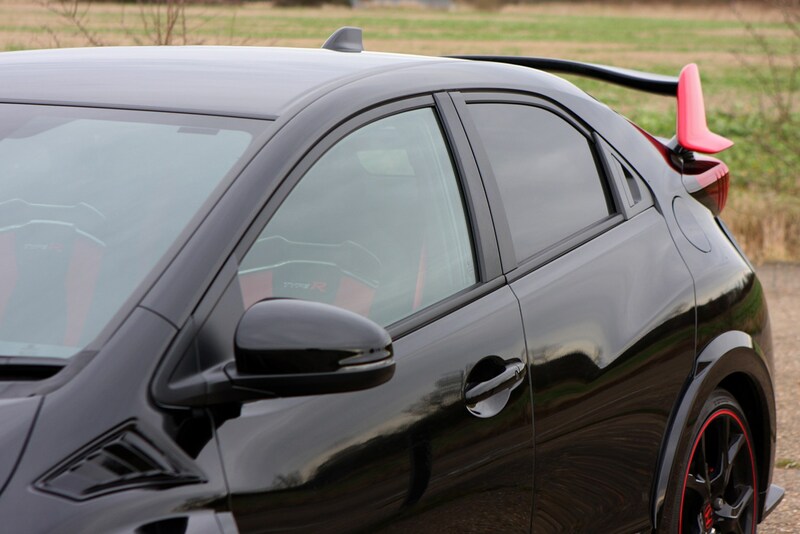 We can thank the adaptive dampers for that. 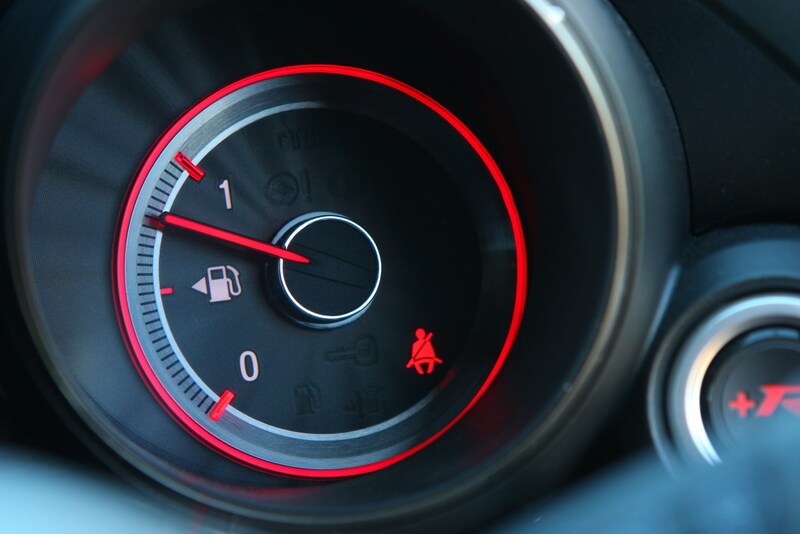 They constantly monitor the car’s attitude through whatever action is being asked of it and use valves to alter the oil flow to change their reactions on the move. 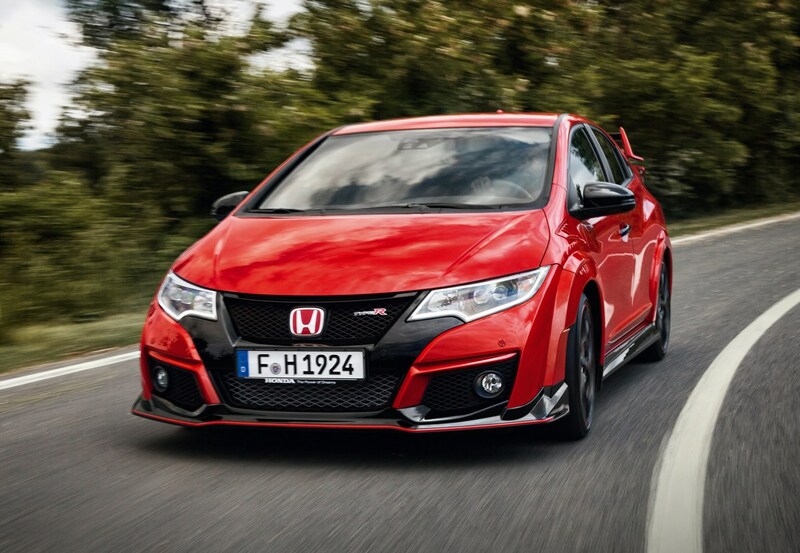 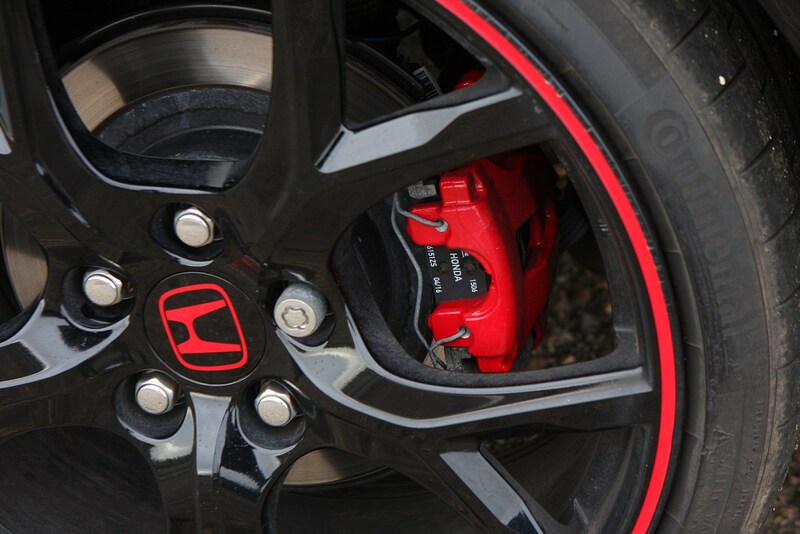 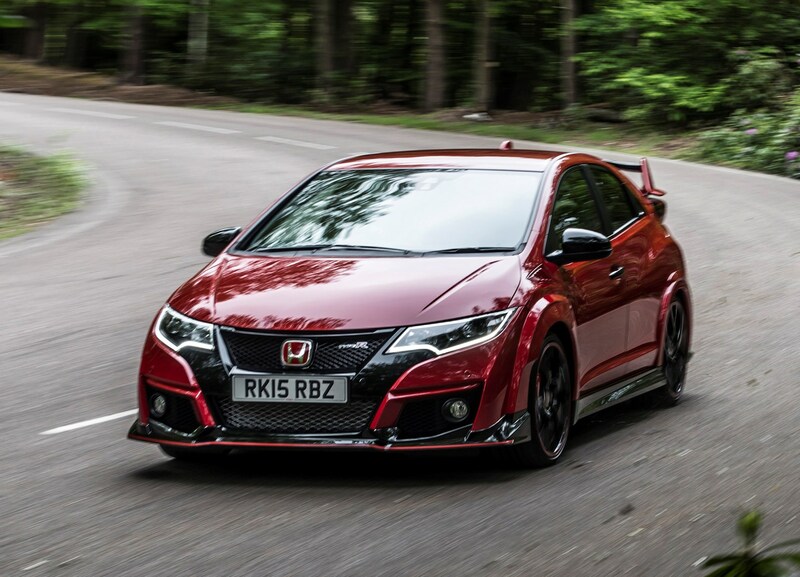 And thanks to the standard-fit mechanical LSD, which apportions power to the outside front wheel (rather than simply braking the inside rim as found in a torque-vectoring system) pushing the nose closer to the apex, the front-end of the Civic has masses of grip. 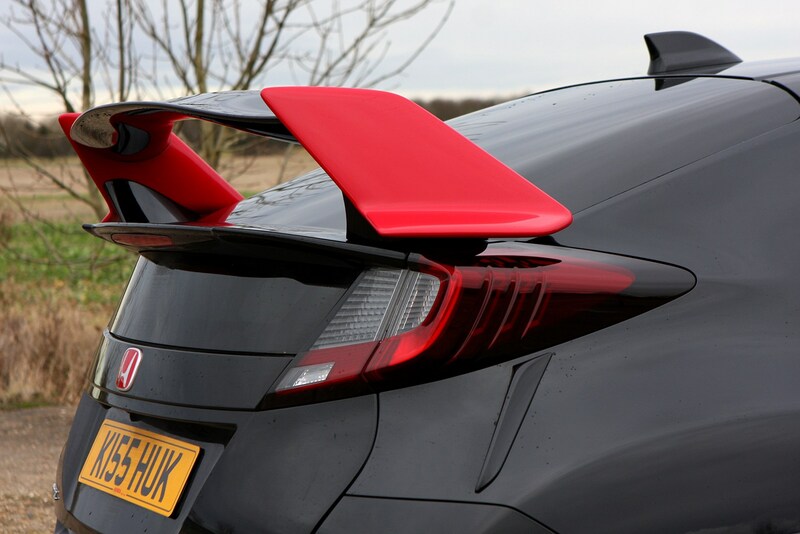 It’s incredibly confidence-inspiring, and you’ll often find yourself under-egging the car’s capabilities as you tip it into a corner. 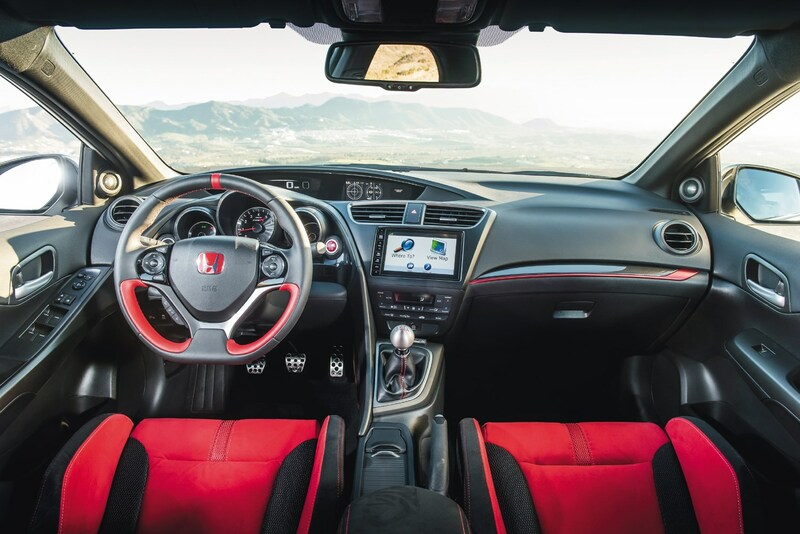 What could be more confidence-inspiring is the steering. 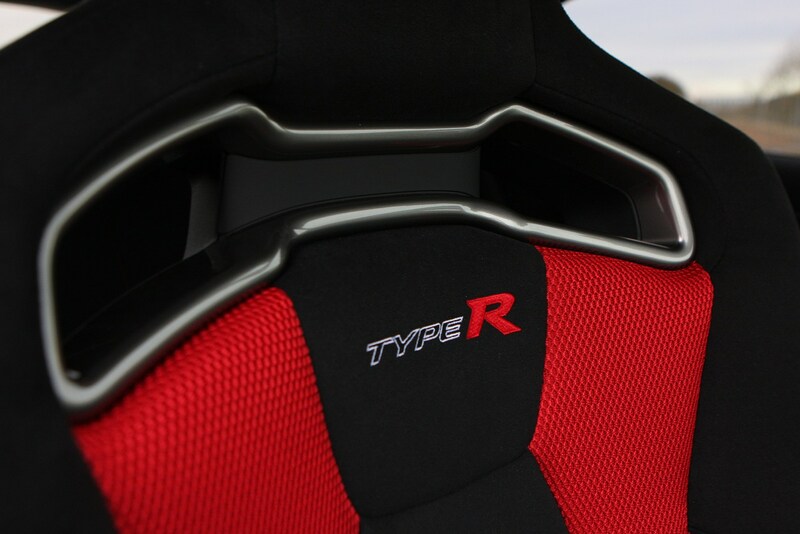 It’s finely weighted, with a relatively linear response, but sometimes you just wish for an inkling more feedback through the leather-wrapped helm. 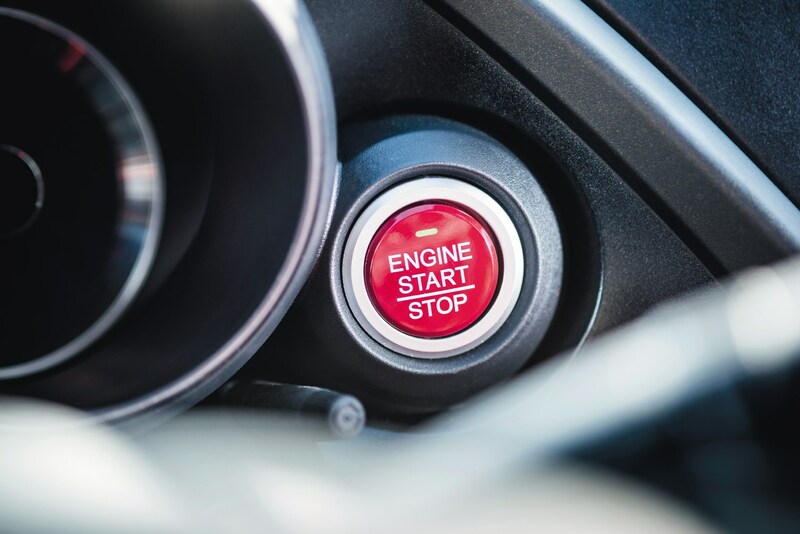 Occasionally you’ll notice tiny nuggets of information being transmitted through to your fingertips, but it doesn’t happen enough. 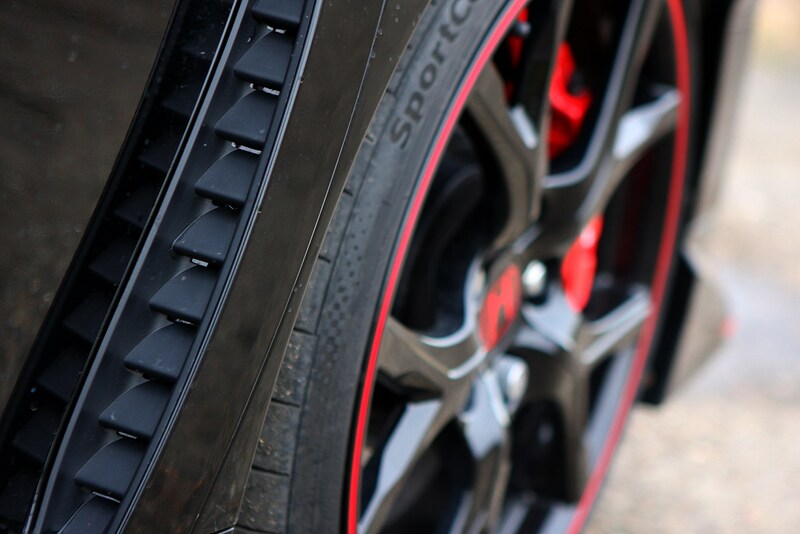 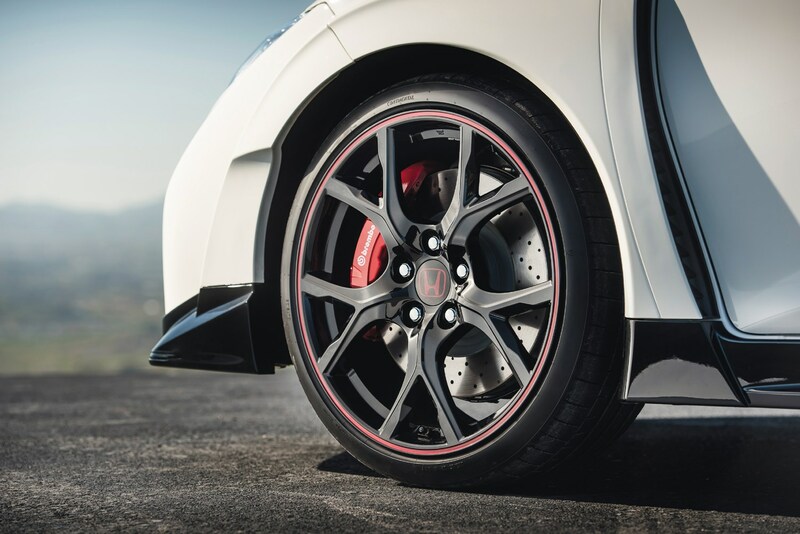 With specially designed suspension struts, that are formed of two distinct components allowing the strut to act independently of the axle’s torque transmission to the wheel hub, torque steer is minimised. 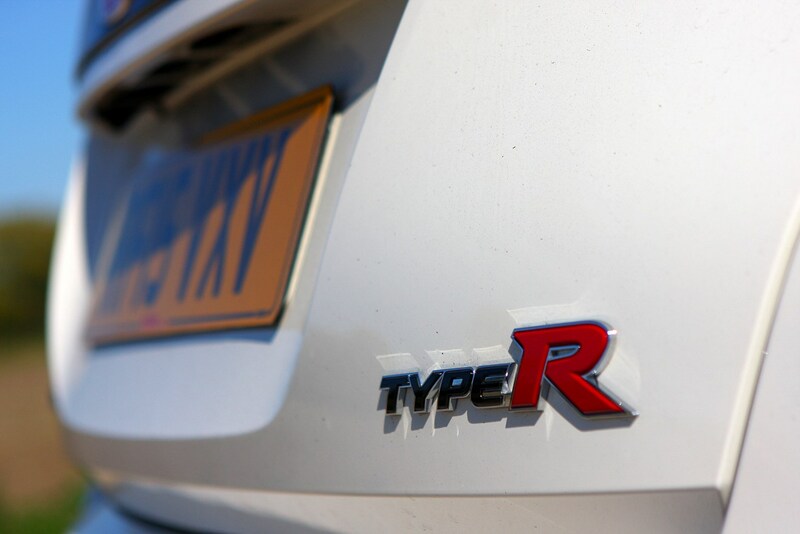 And considering there’s 400Nm being fed through that front axle, the Type R’s steering is remarkably free from corruption under power – it’s certainly less busy than the already improved Ford Focus ST, even if it’s not quite as communicative on the move. 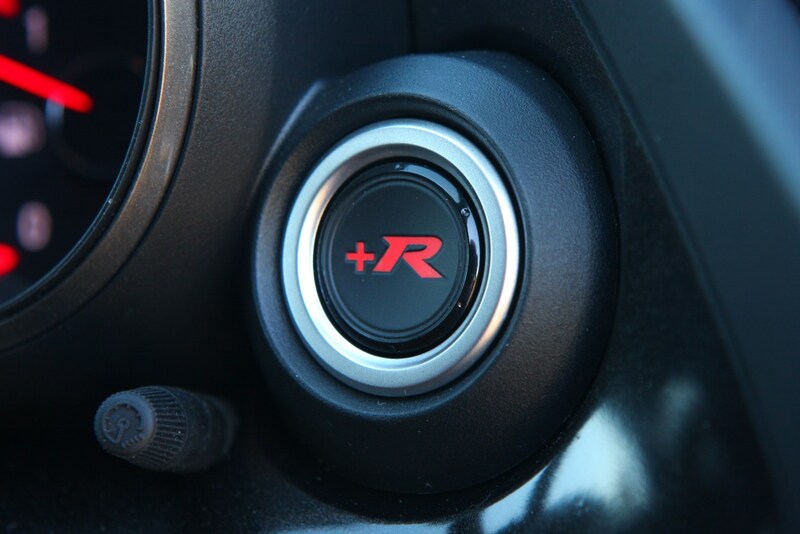 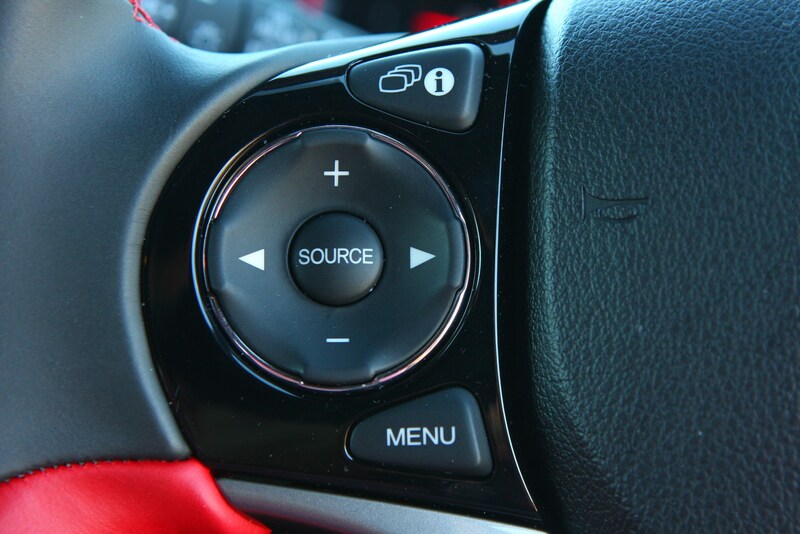 Pressing the +R button doesn’t really help, as though its said to add sportiness to the drive, for the steering it simply makes the weighting more extreme. 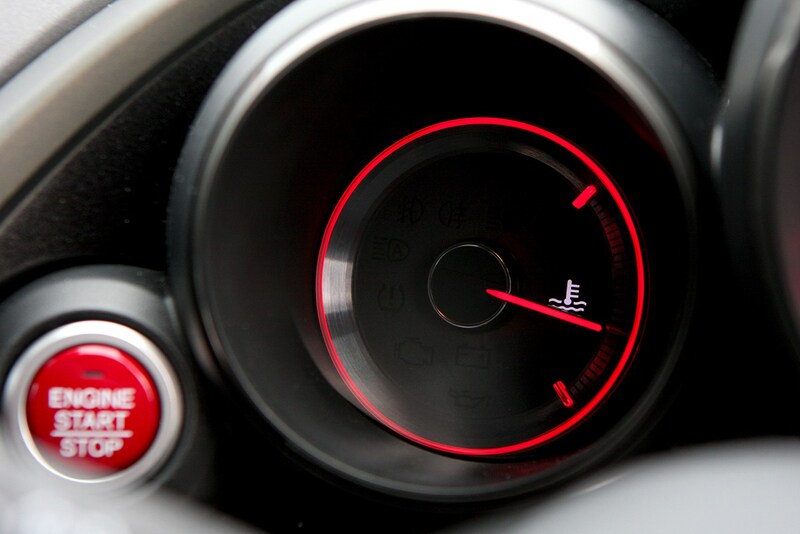 It’ll also change the throttle map, along with making the instruments glow red, and crucially make the dampers 30 percent stiffer. 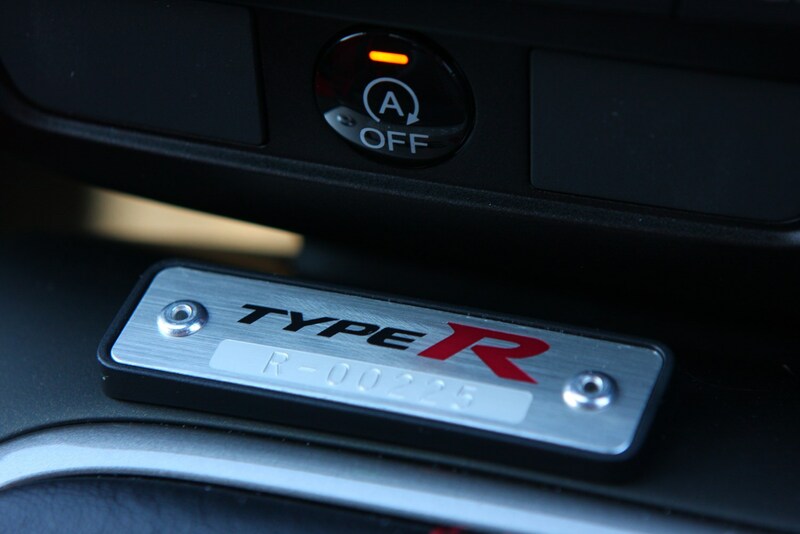 But it’s really not needed; there’s no more power from that throttle map (it simply provides more torque for less of a press of the pedal) and the Type R is already borderline unbearably stiff. 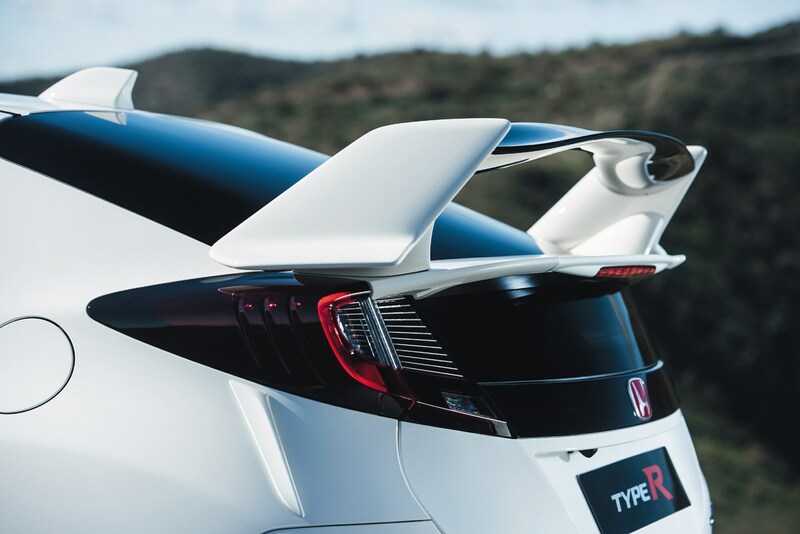 The engineers concede that it’s actually set up with one place in mind - the Nurburgring – and our experience would suggest there will be no situation on a UK road where its performance will be preferable to the standard set up. 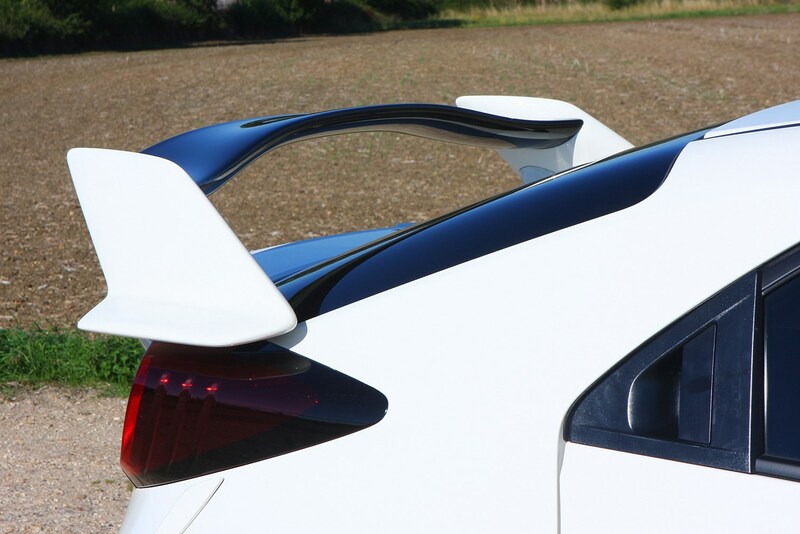 We’d even question its use on a smoothly-surfaced racing circuit. 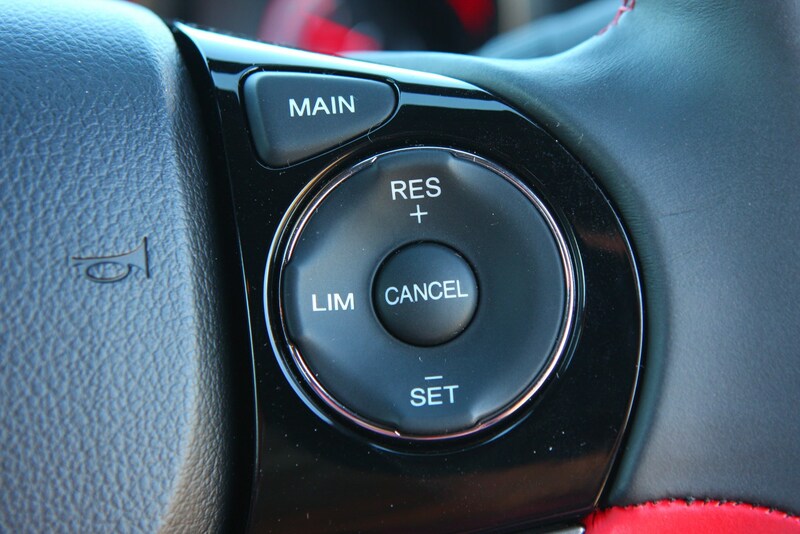 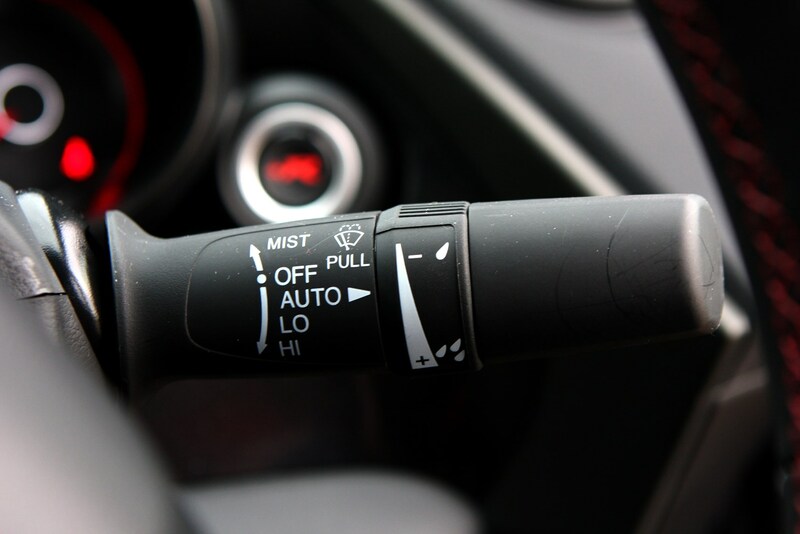 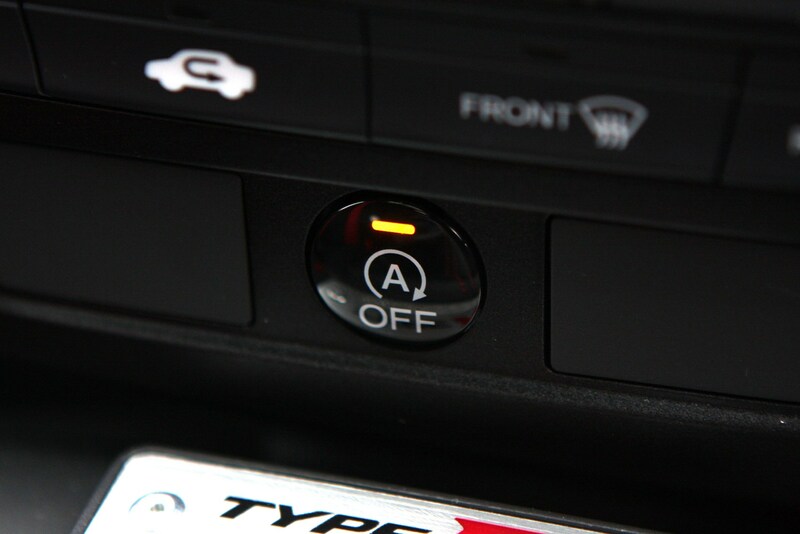 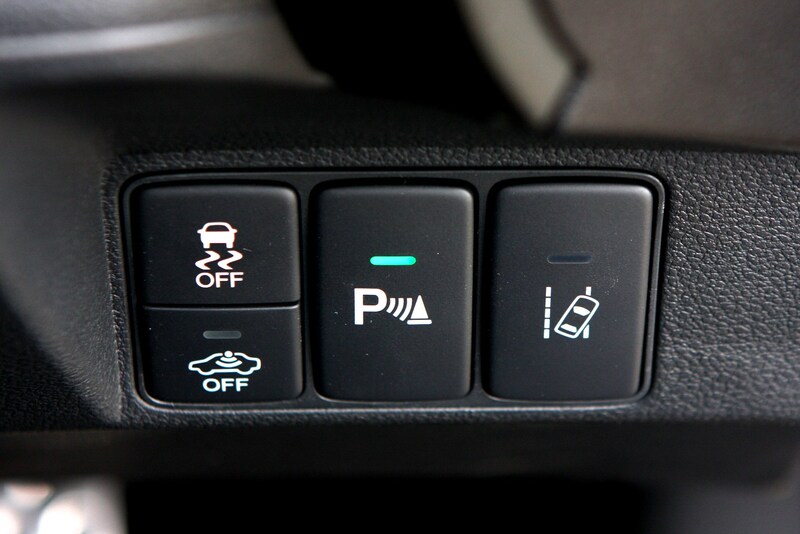 That said, it does lessen the grip from the Vehicle Stability Assist (VSA) for a more playful attitude at extremes. 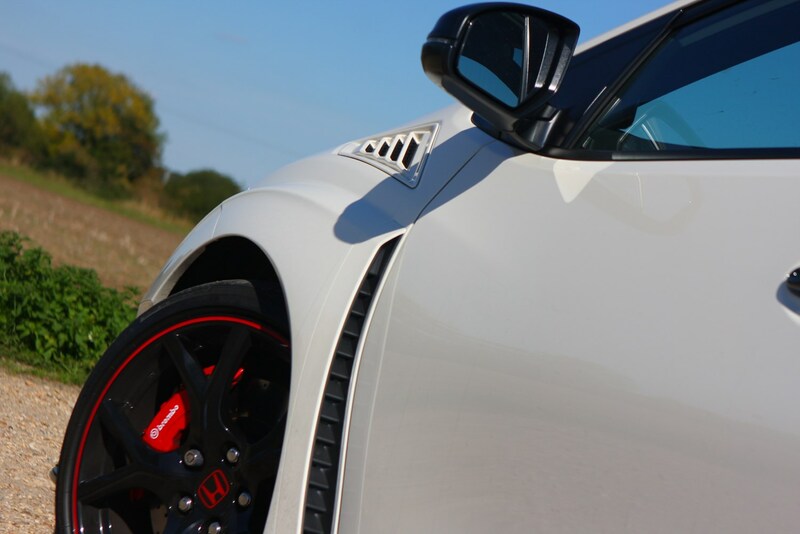 Unfortunately our limited time with the car didn’t allow us to fully explore the chassis’ limits under such provocation, but it certainly doesn’t feel as playful as a RenaultSport Megane Trophy. 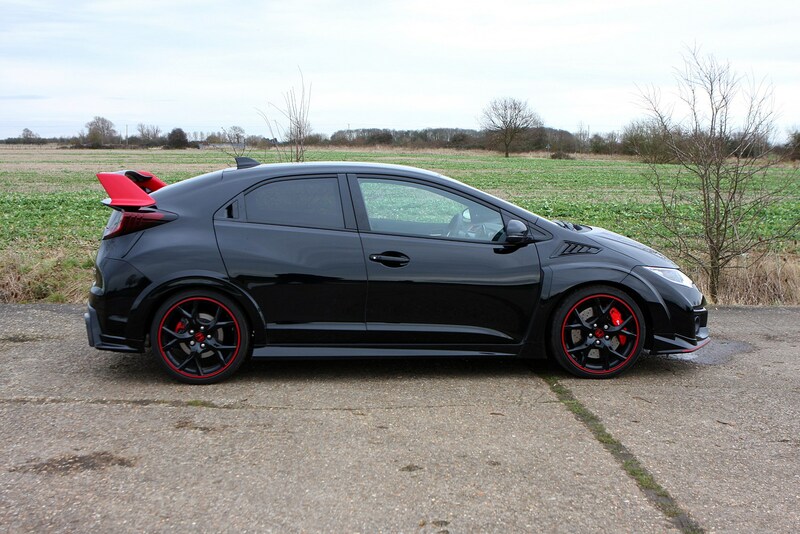 Familiar with the standard Honda Civic? 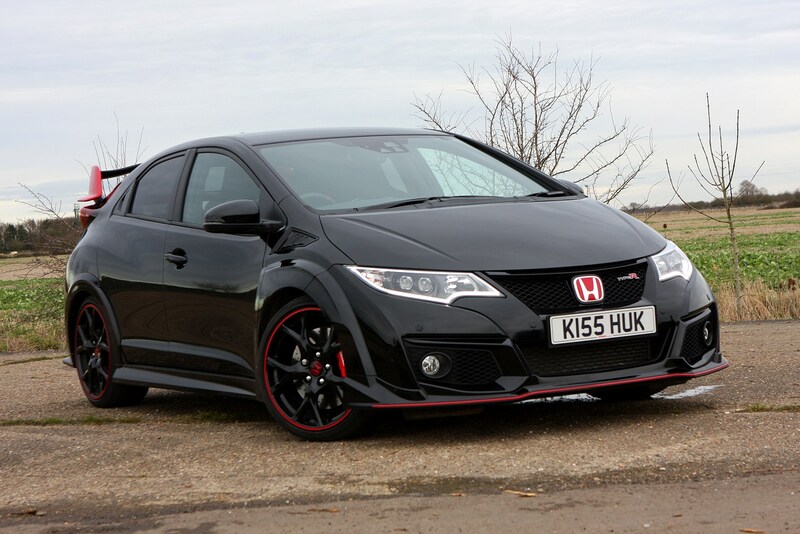 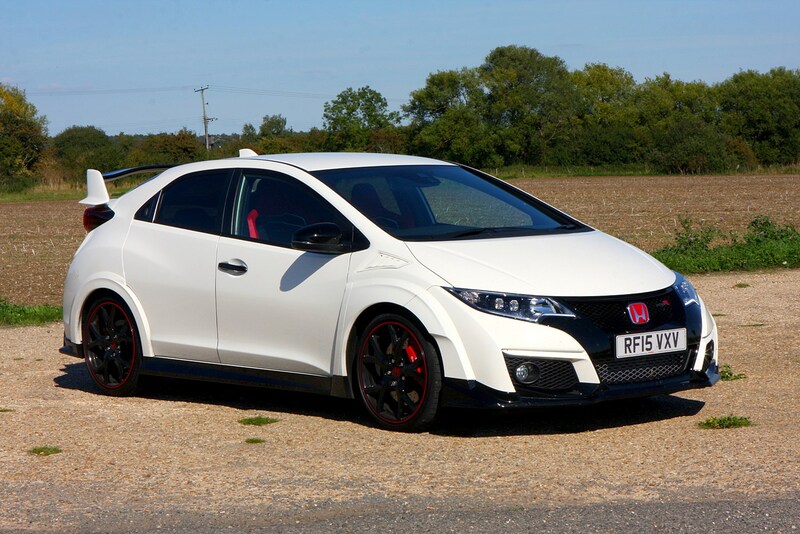 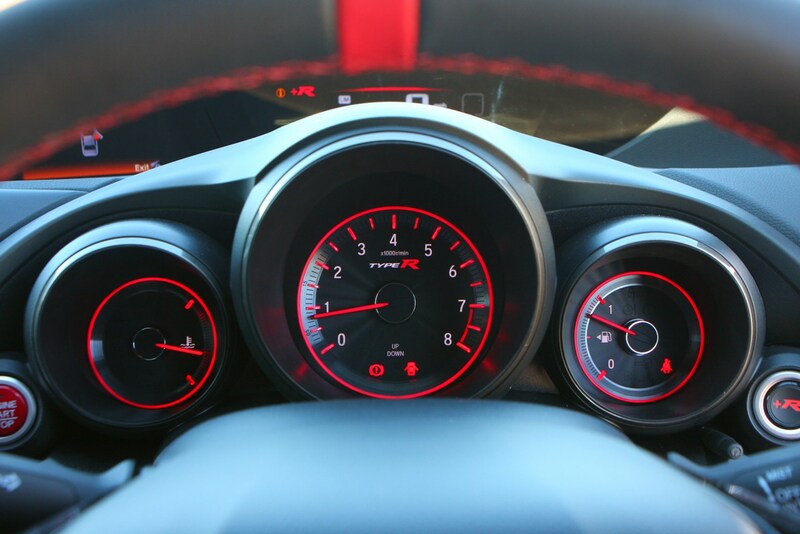 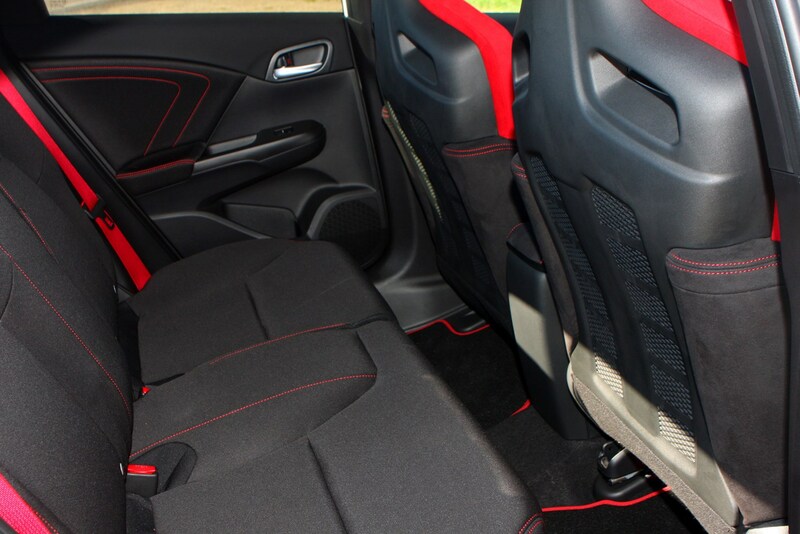 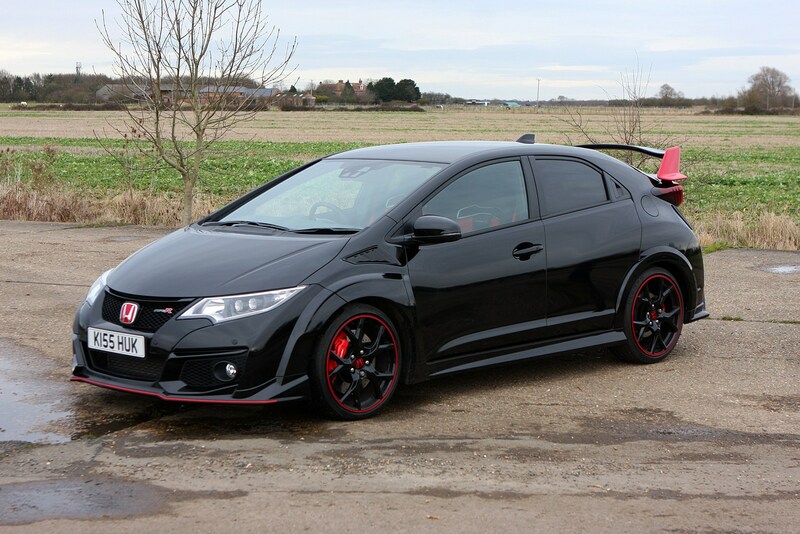 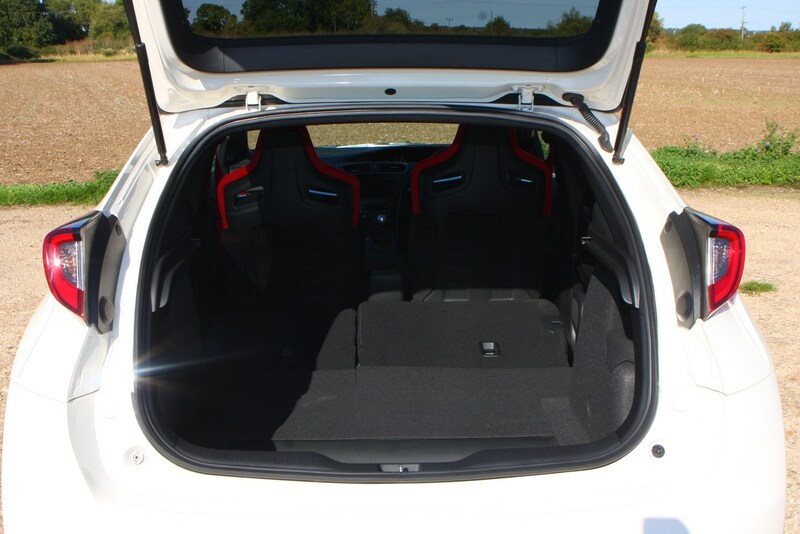 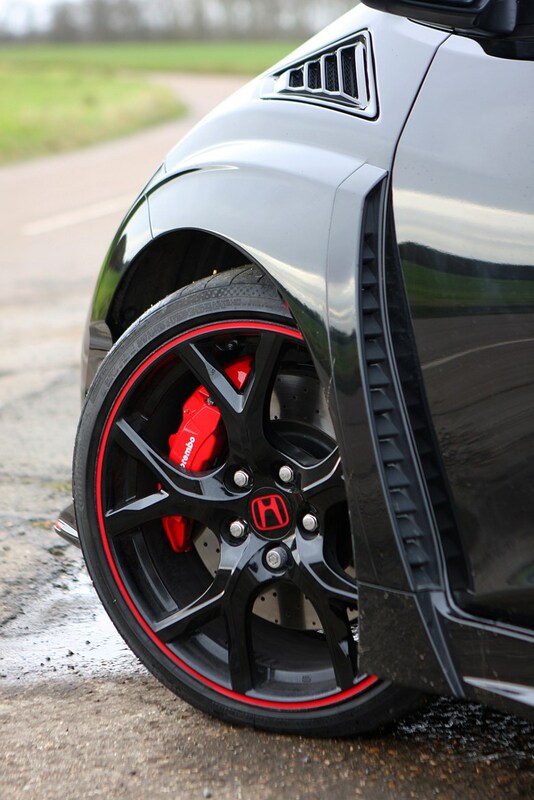 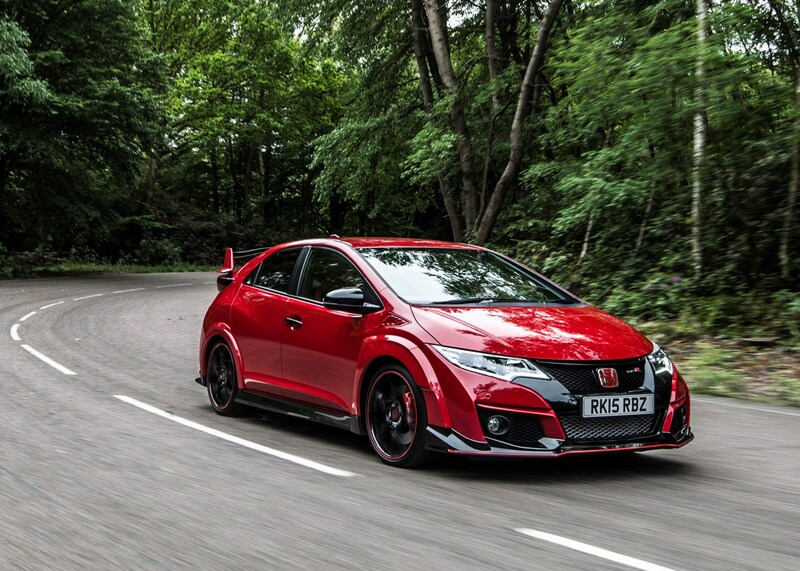 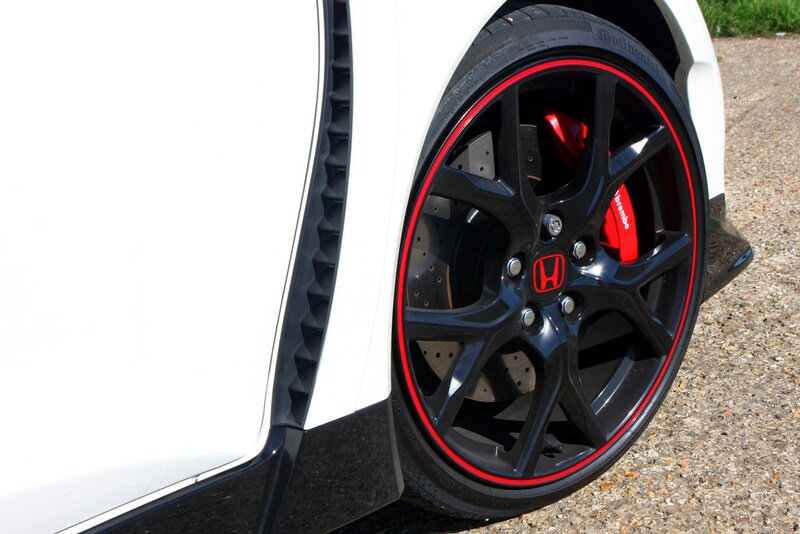 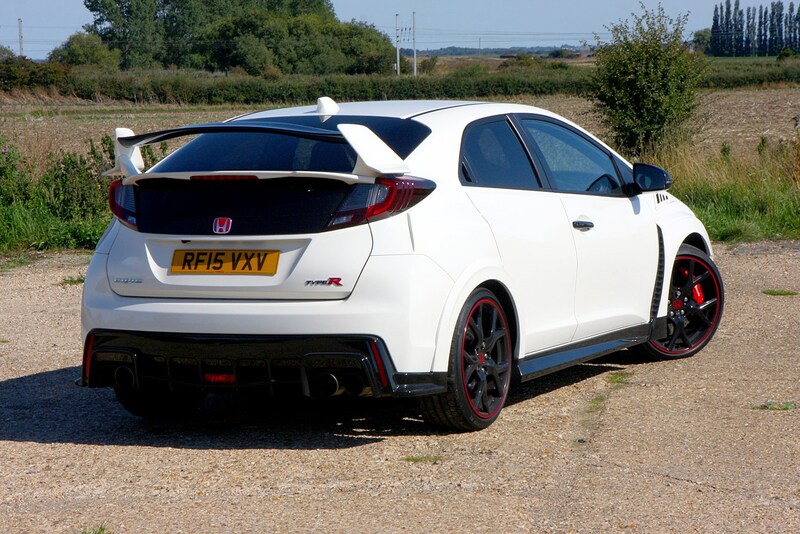 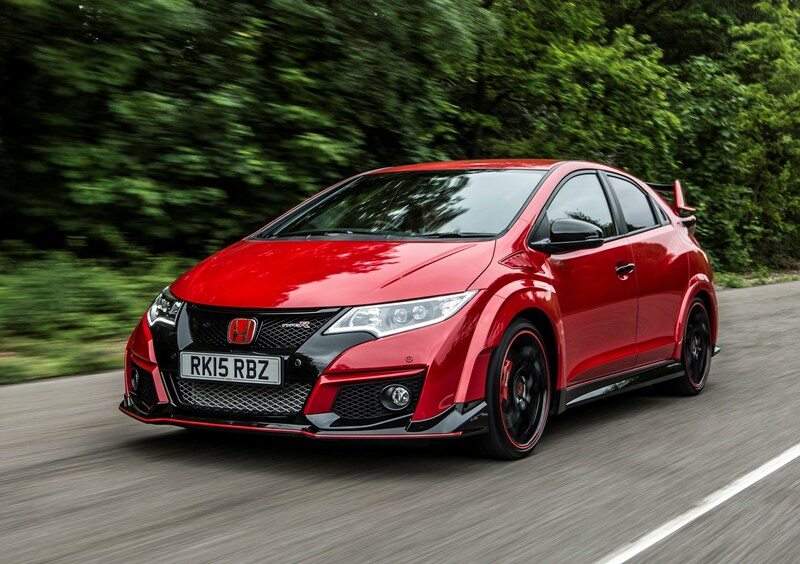 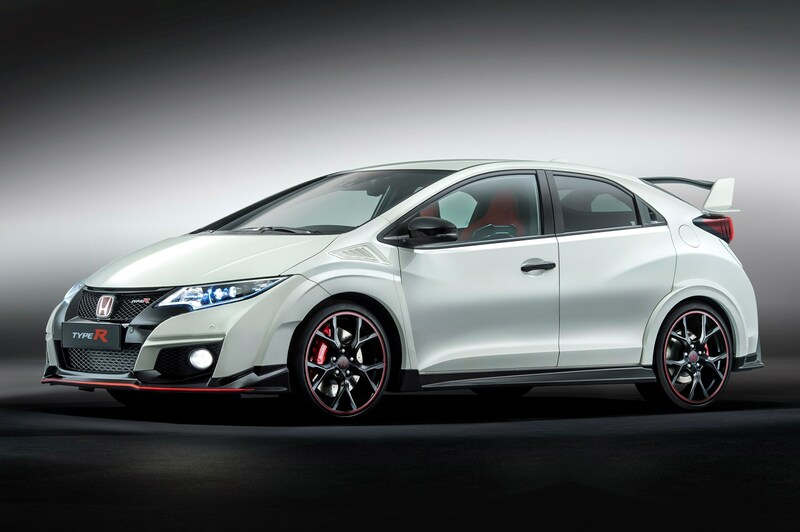 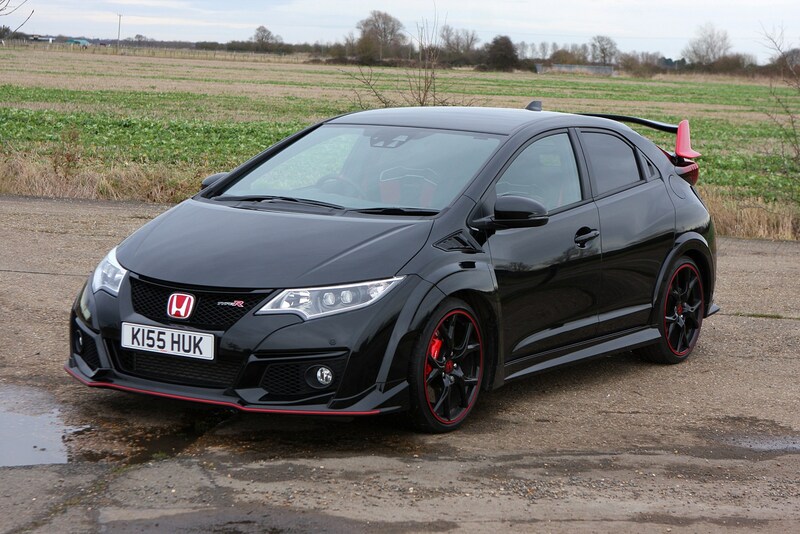 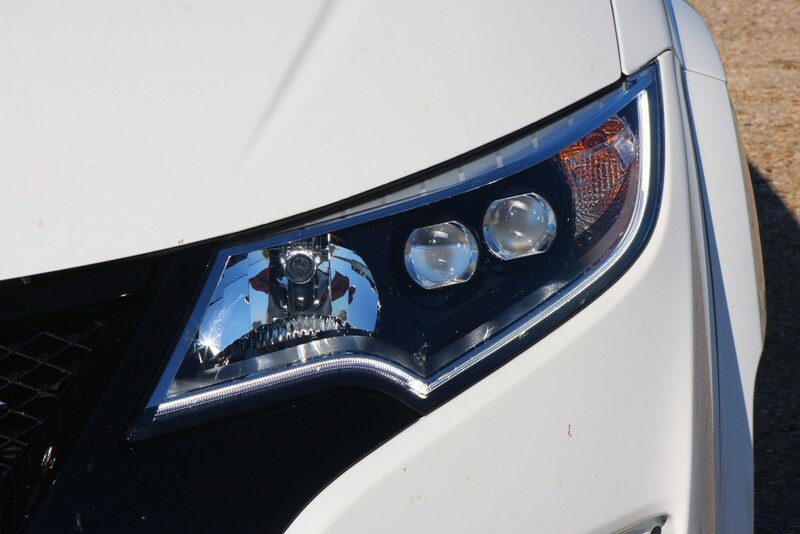 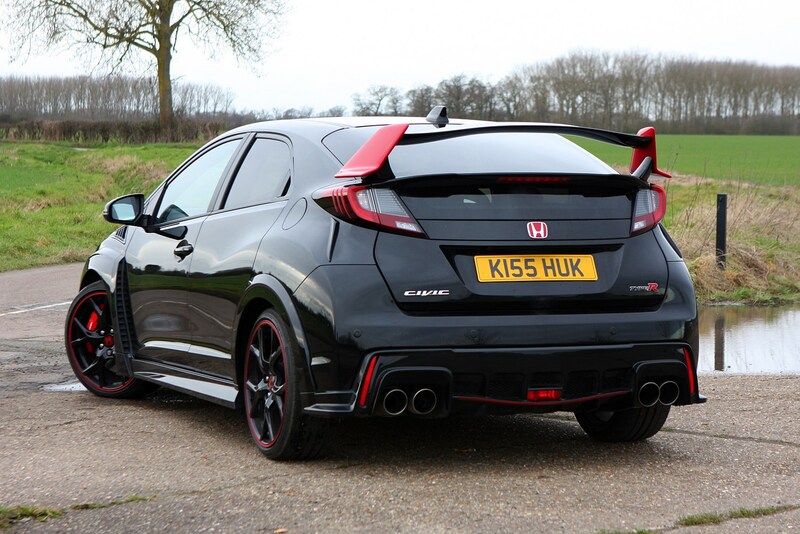 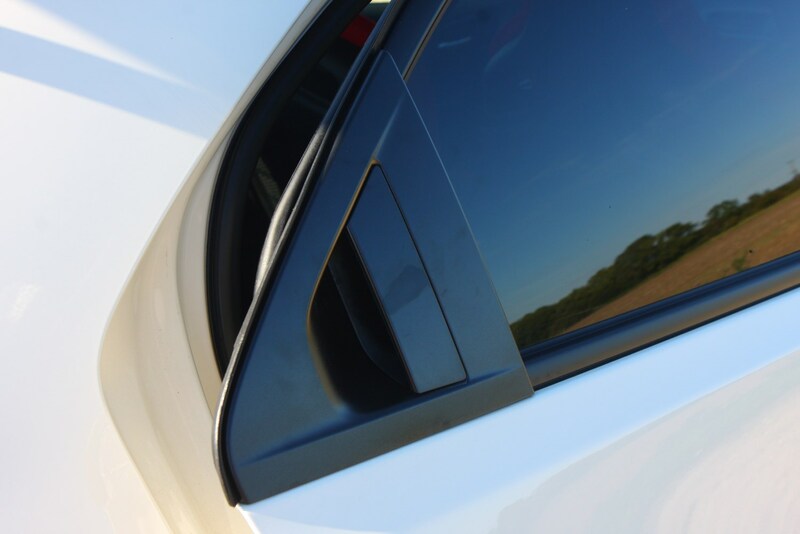 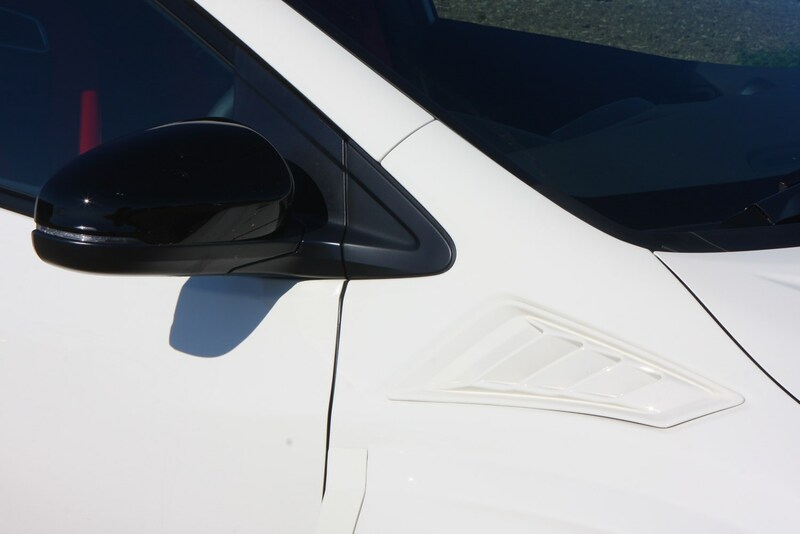 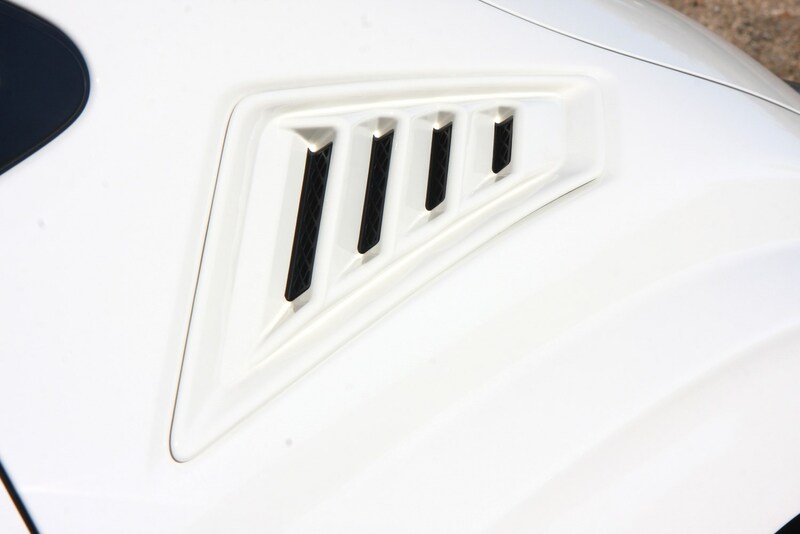 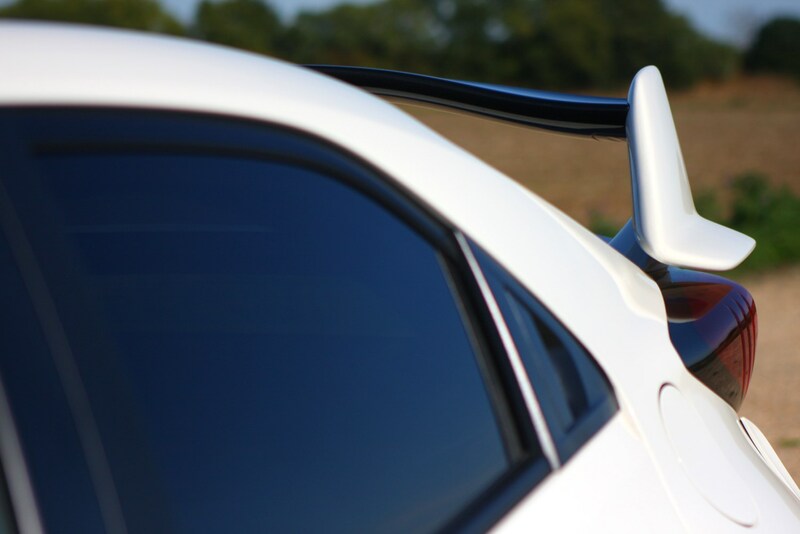 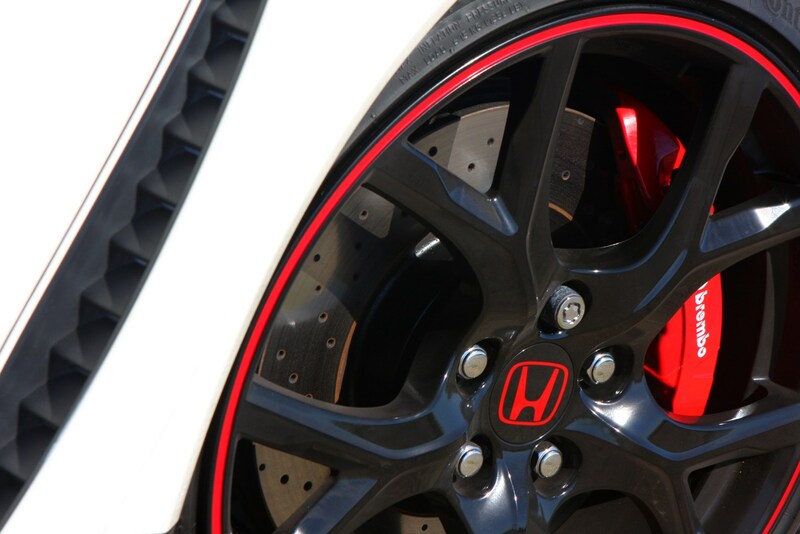 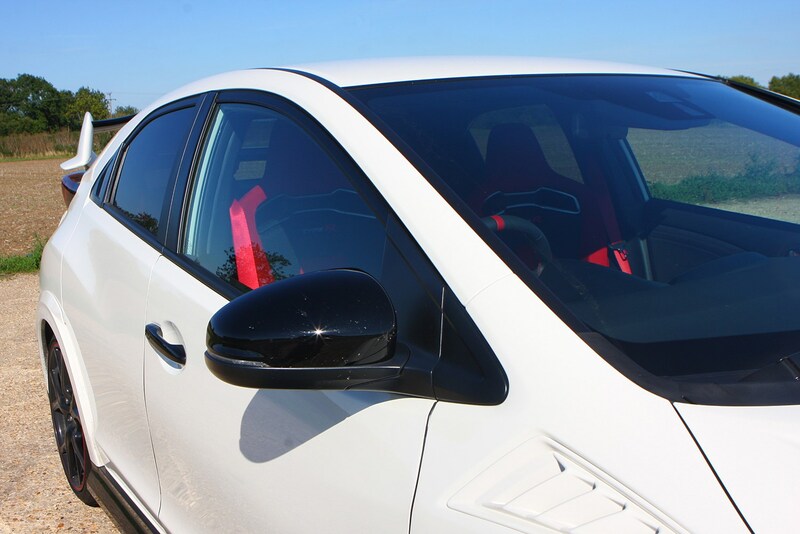 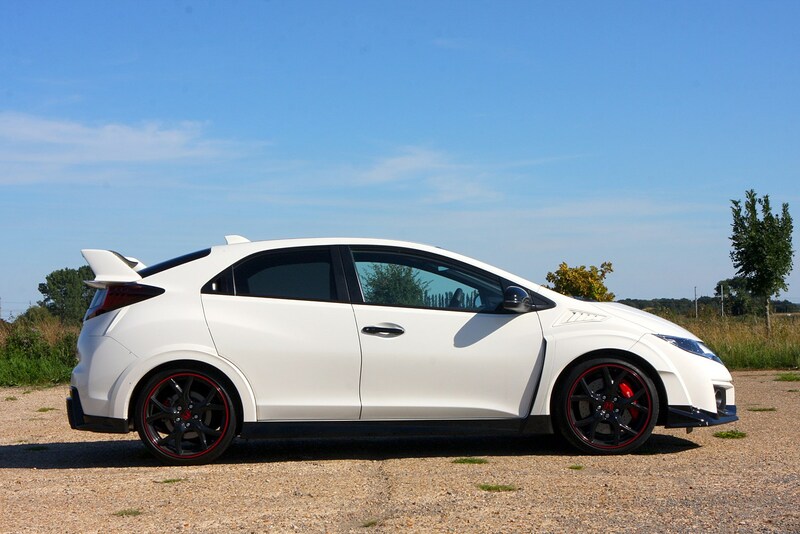 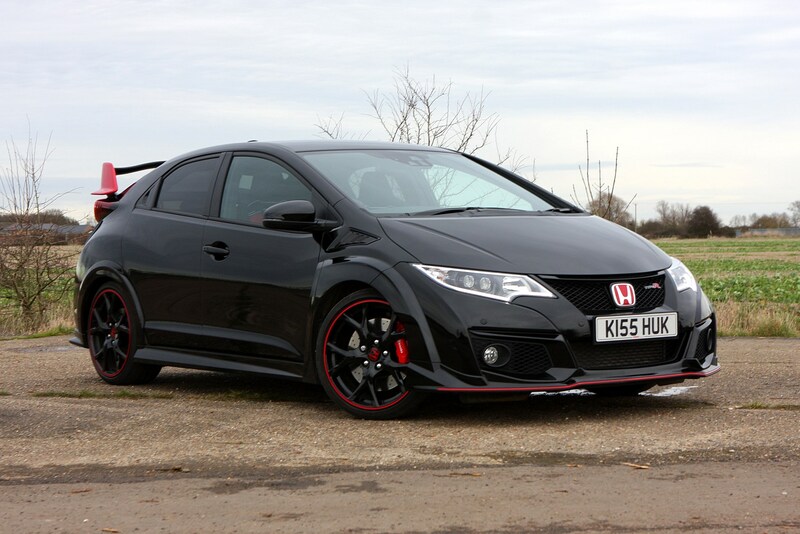 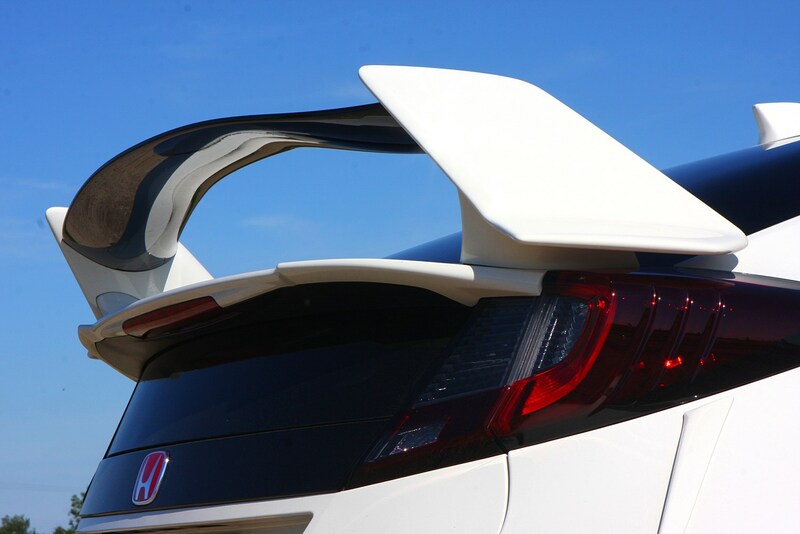 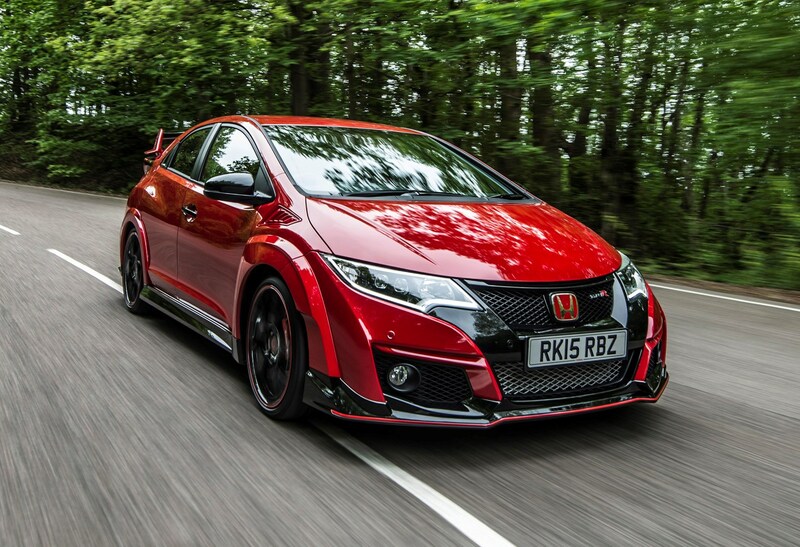 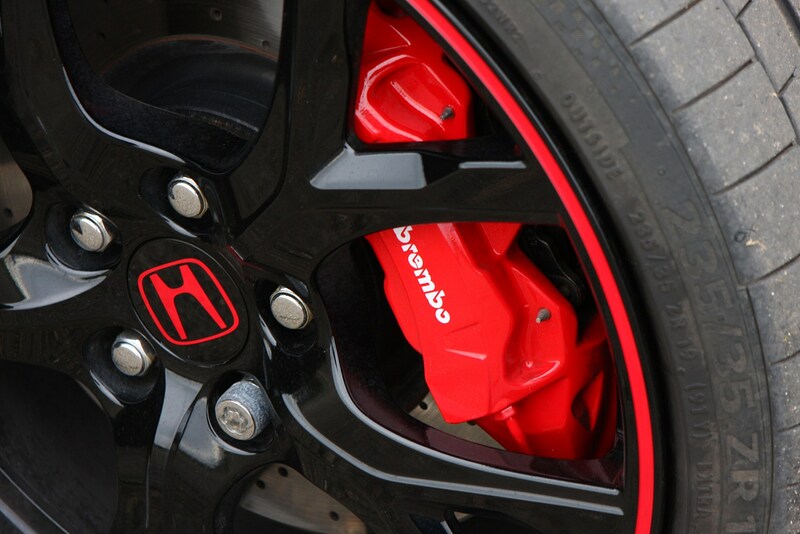 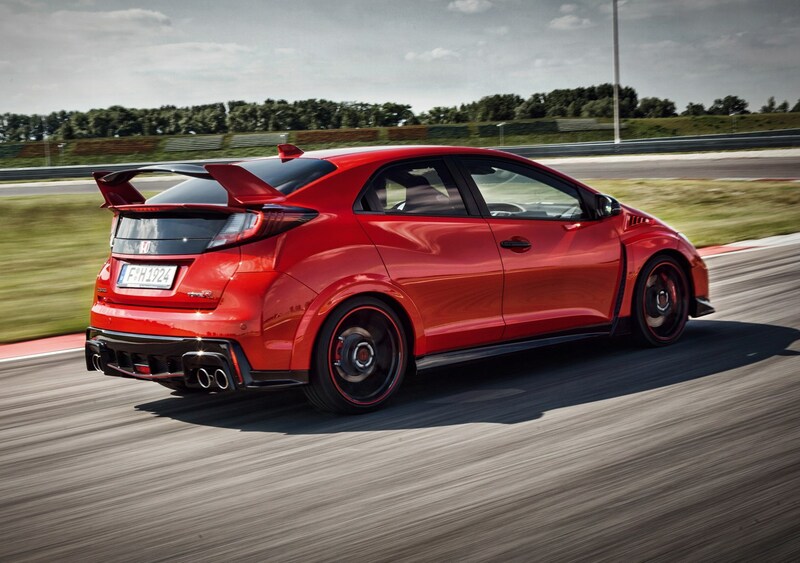 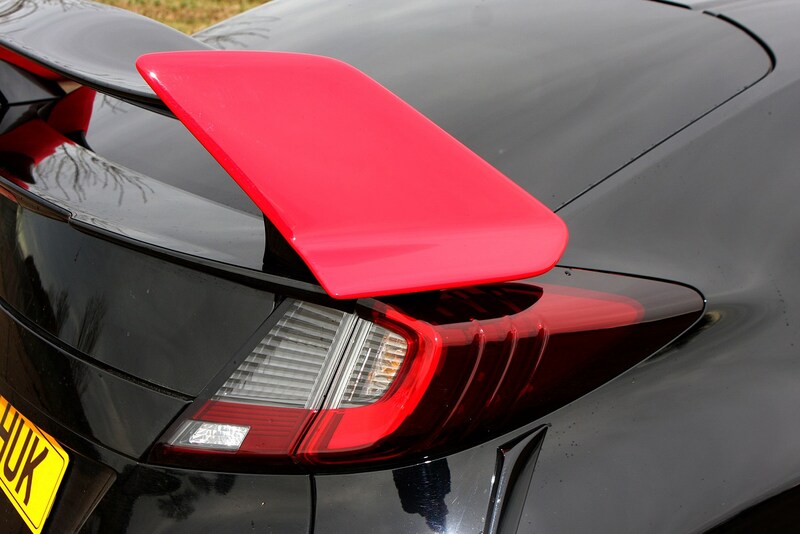 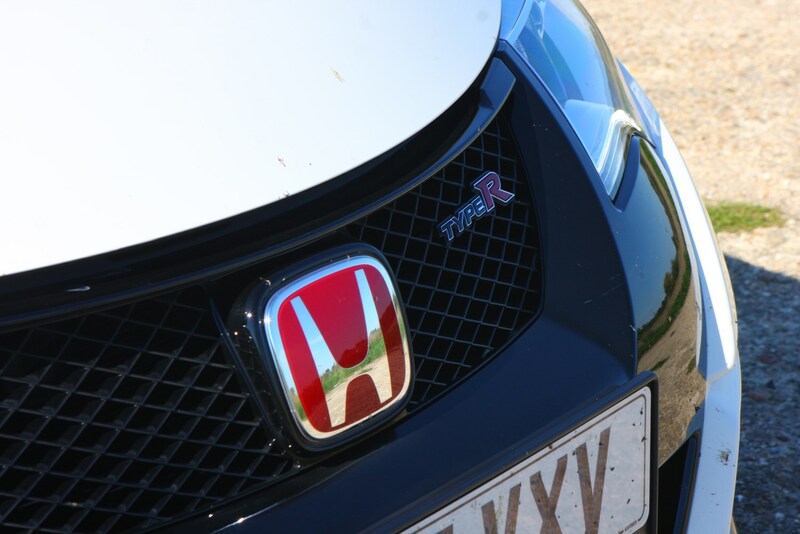 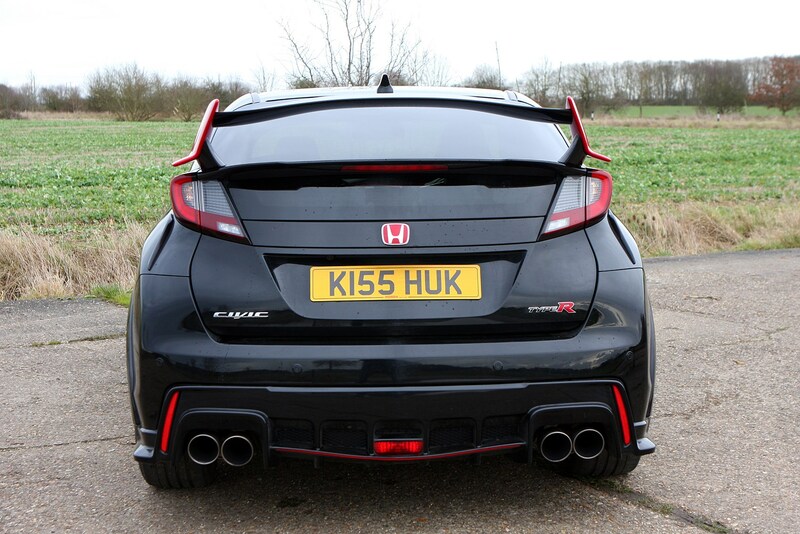 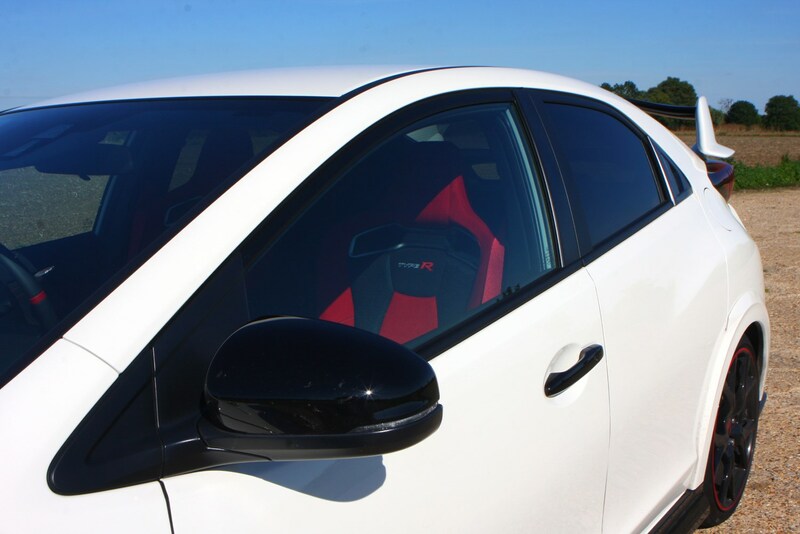 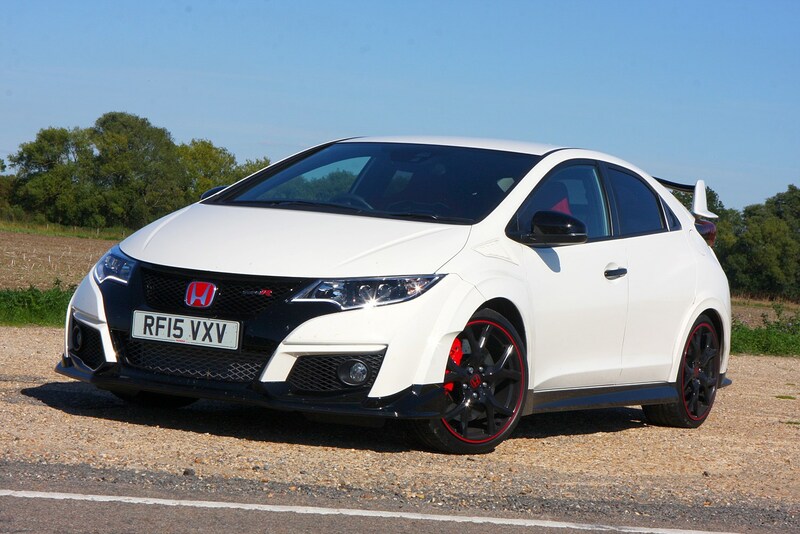 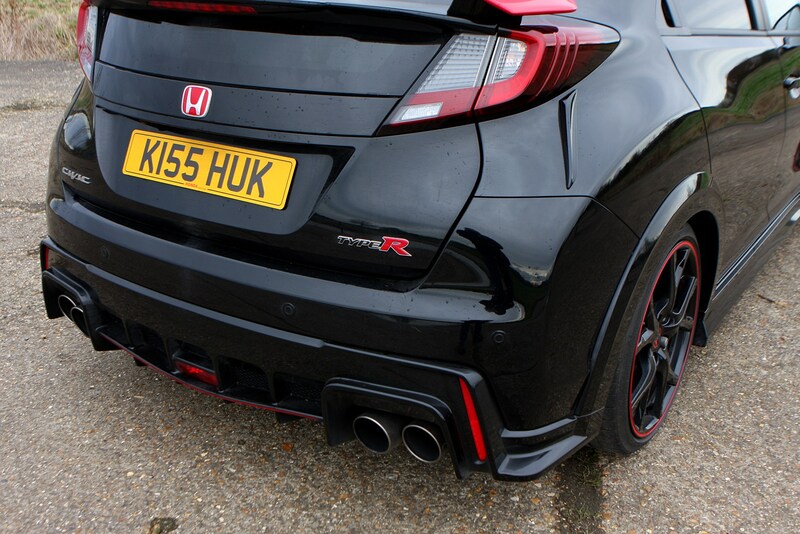 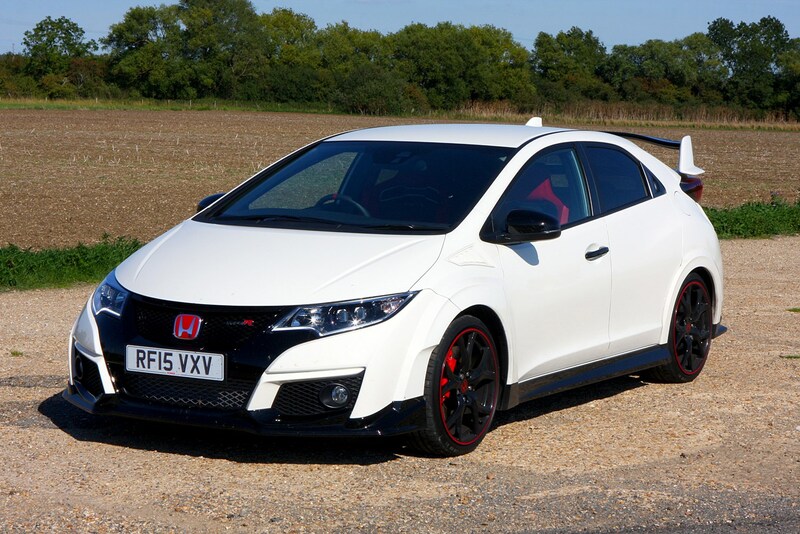 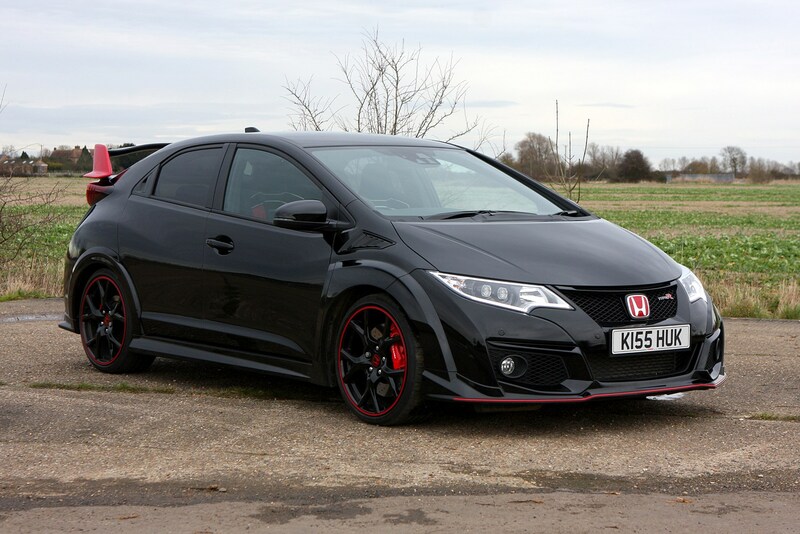 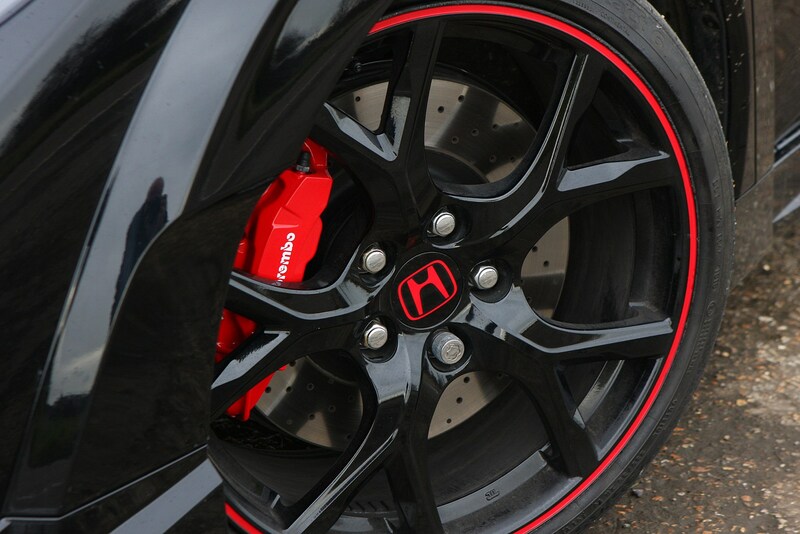 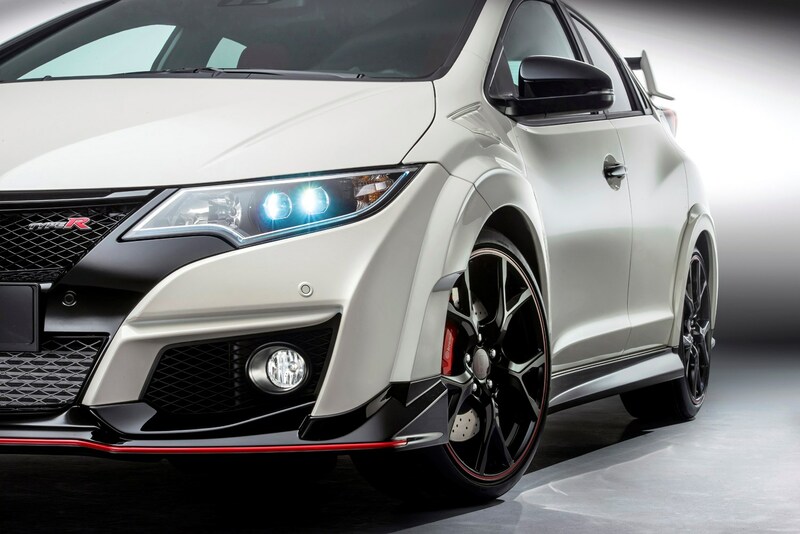 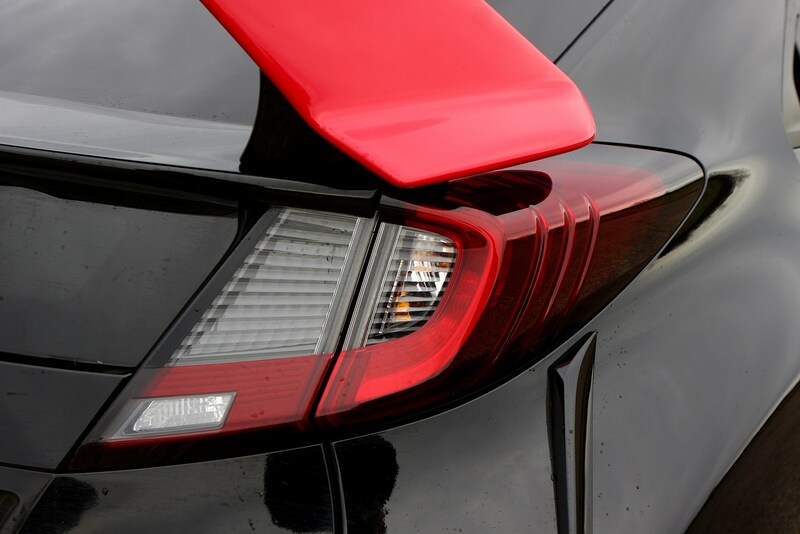 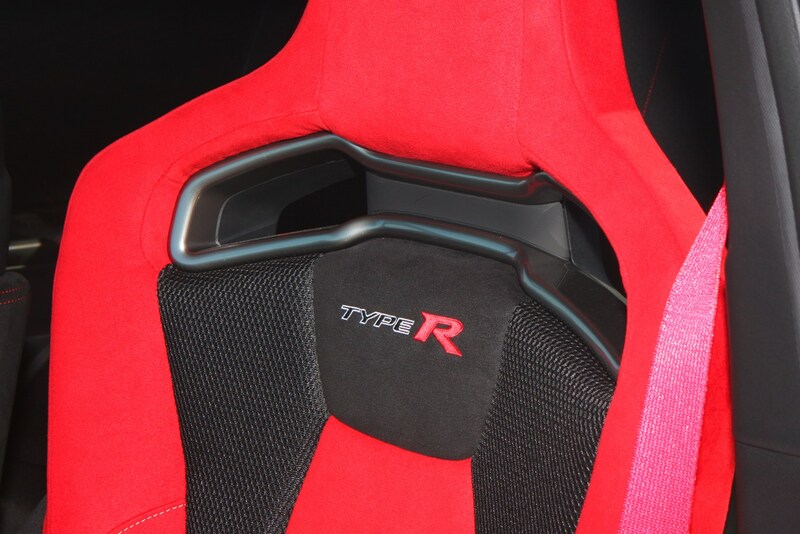 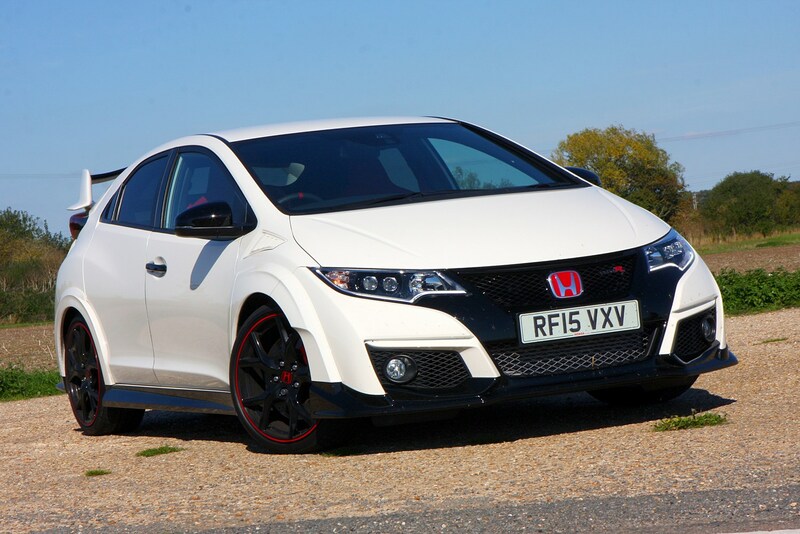 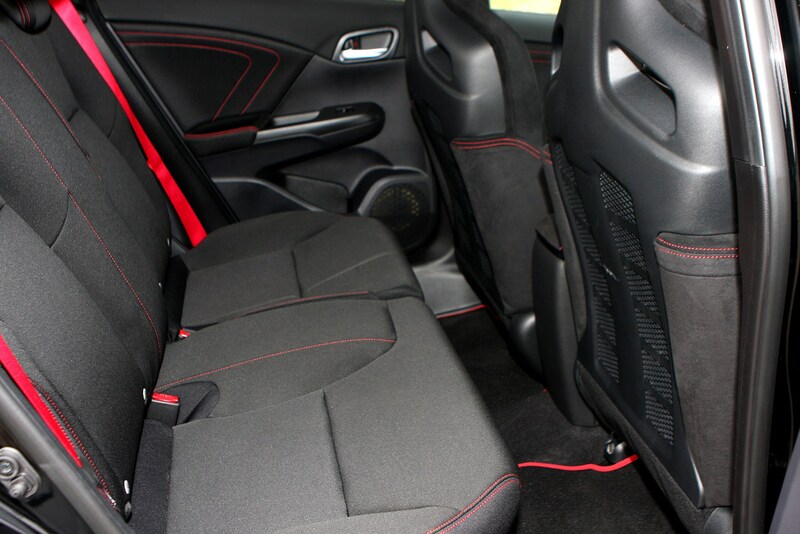 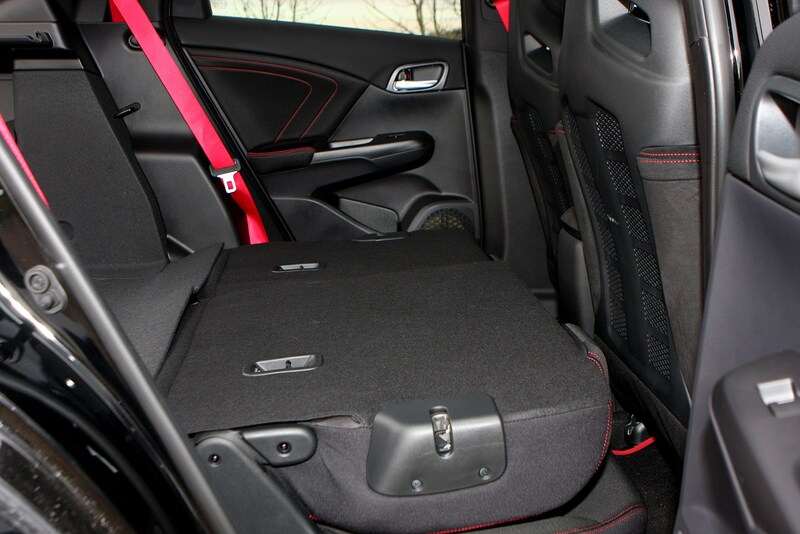 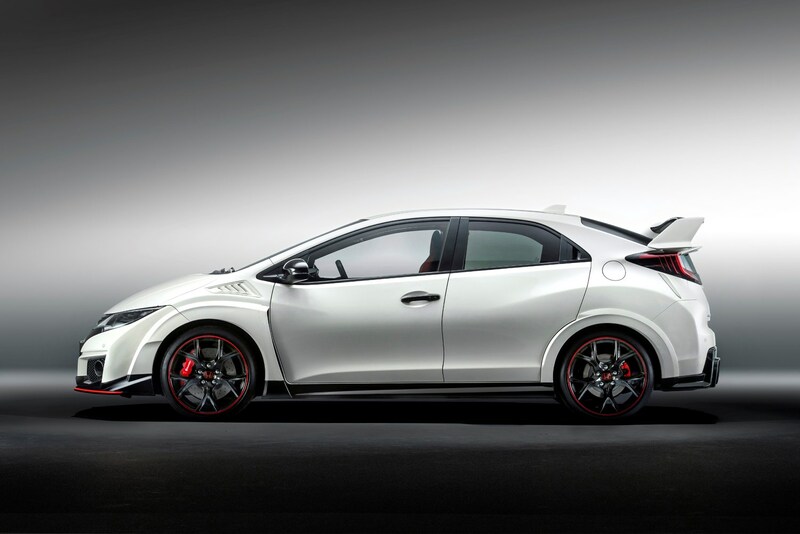 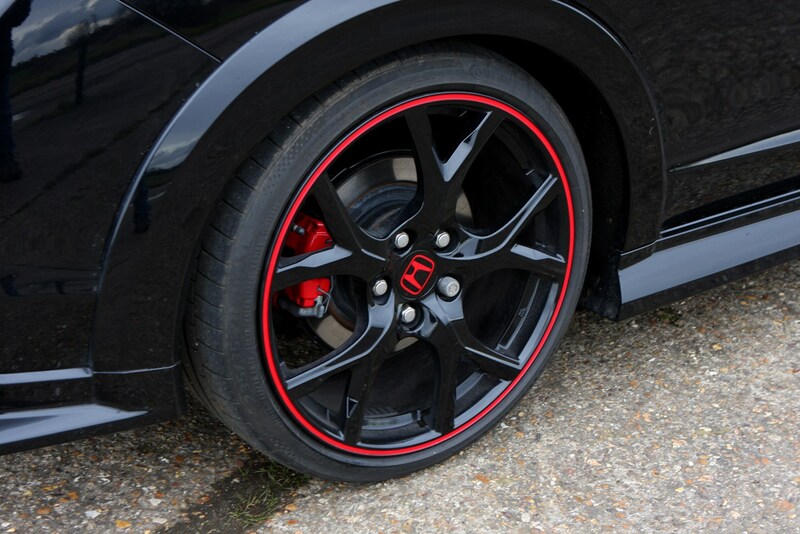 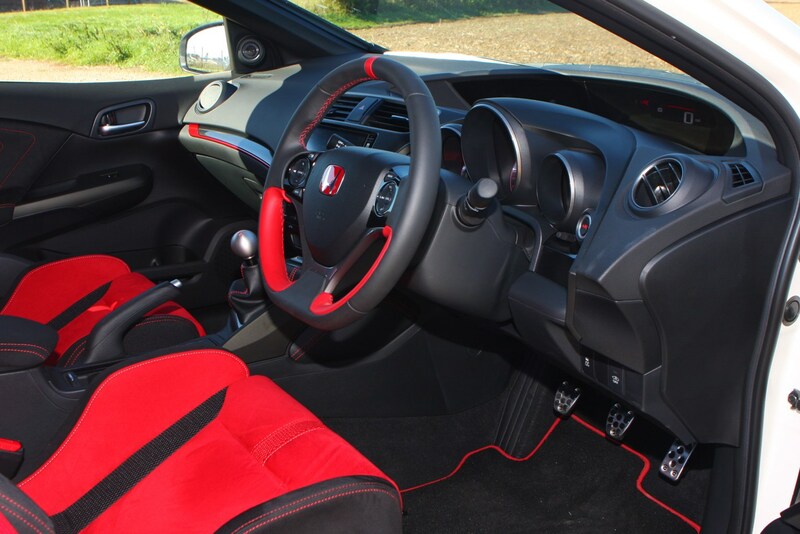 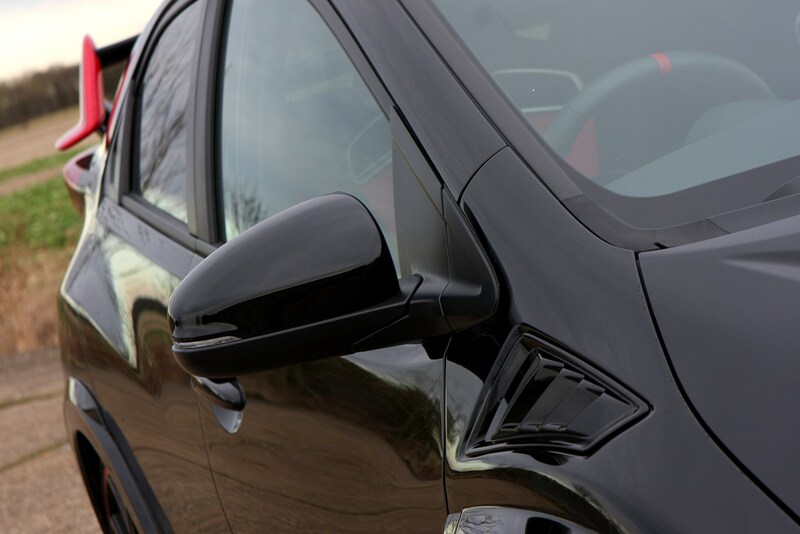 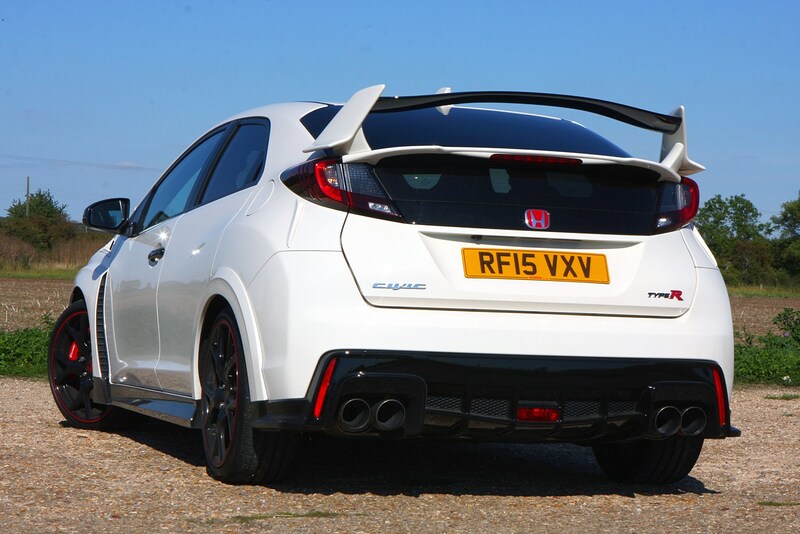 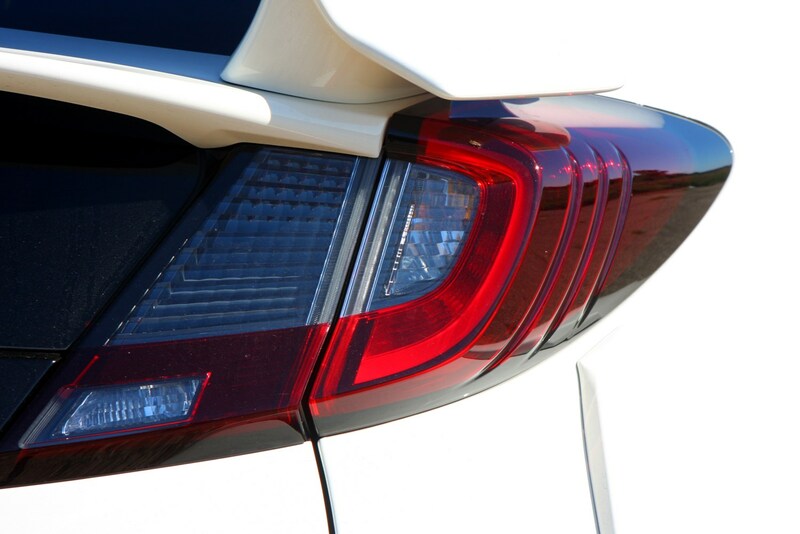 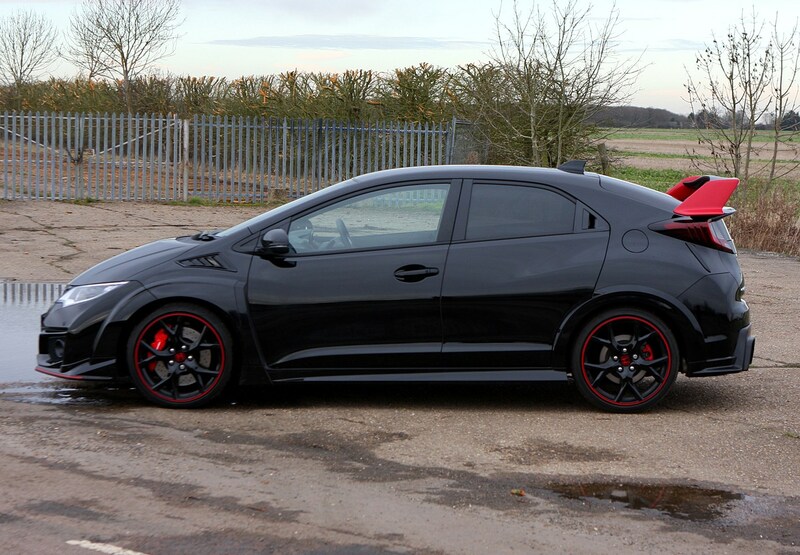 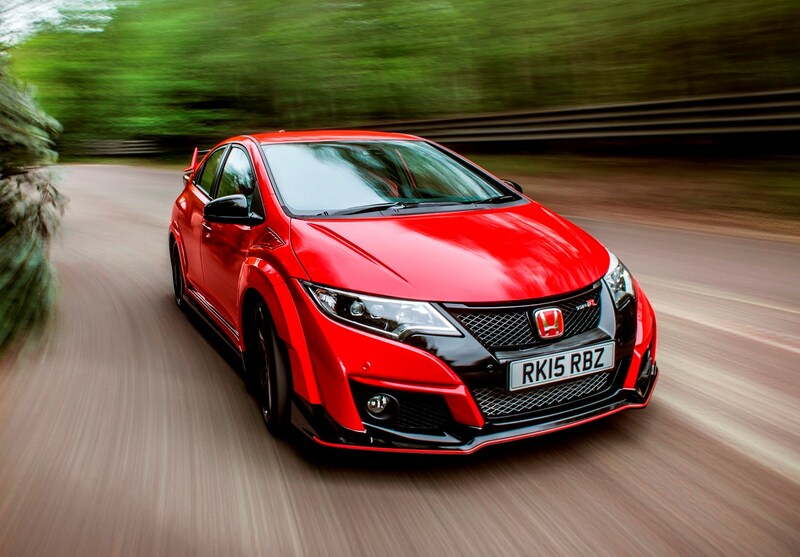 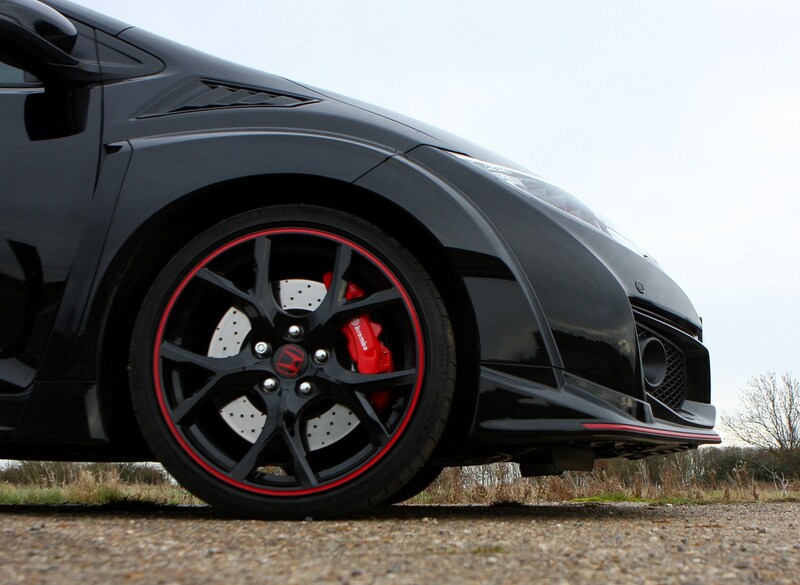 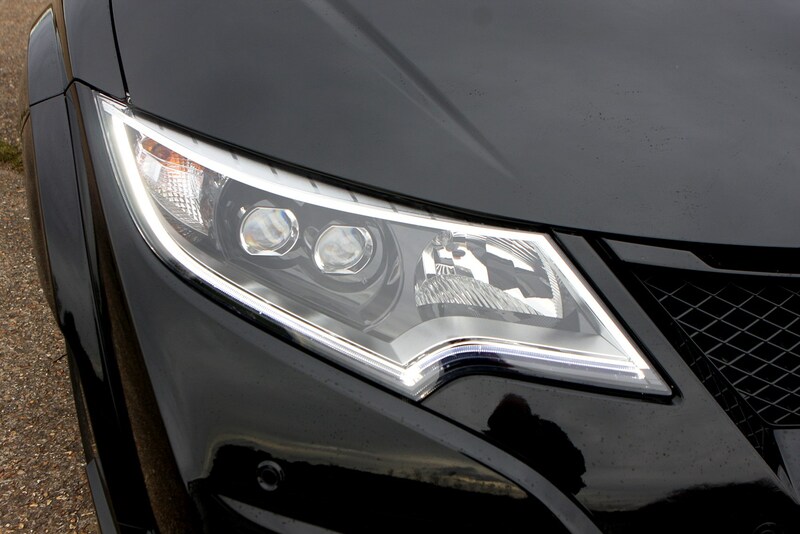 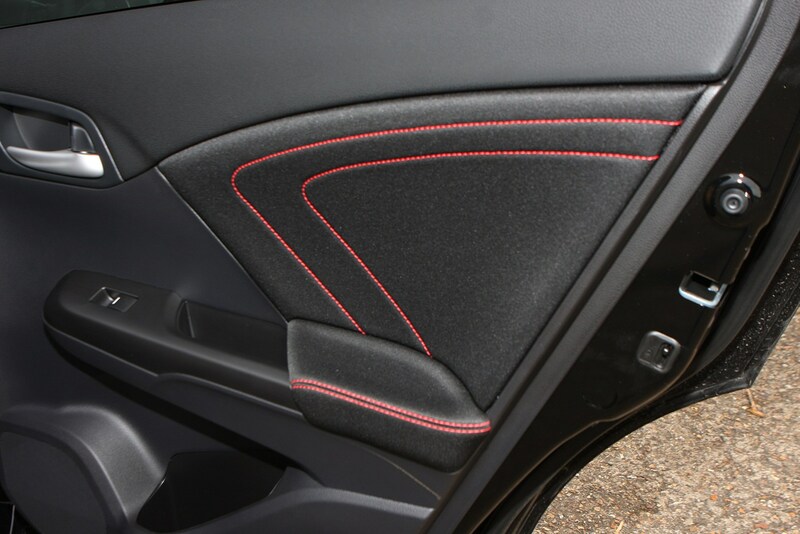 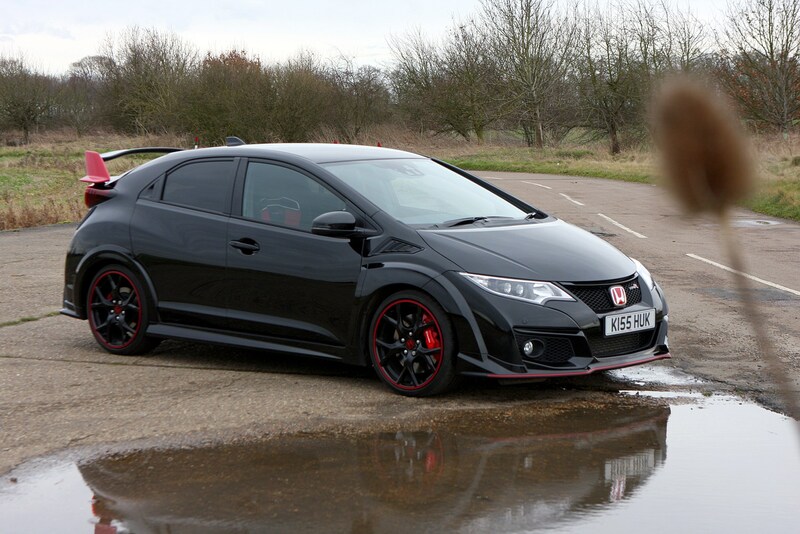 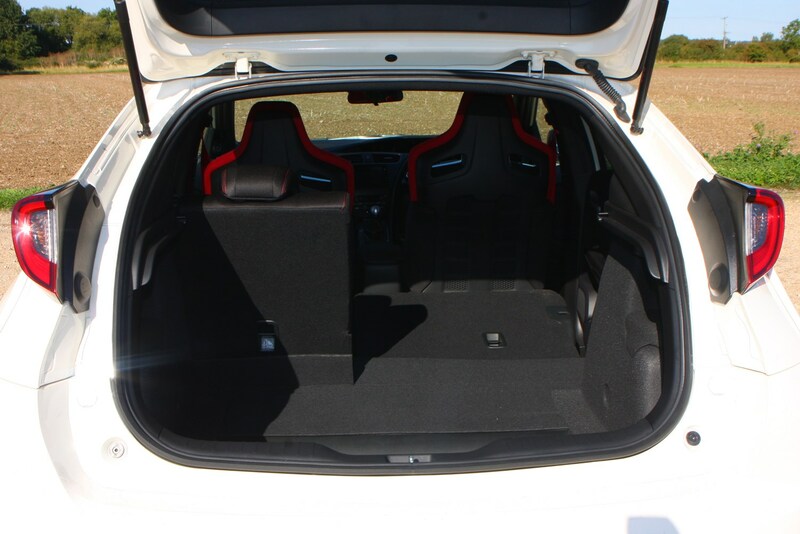 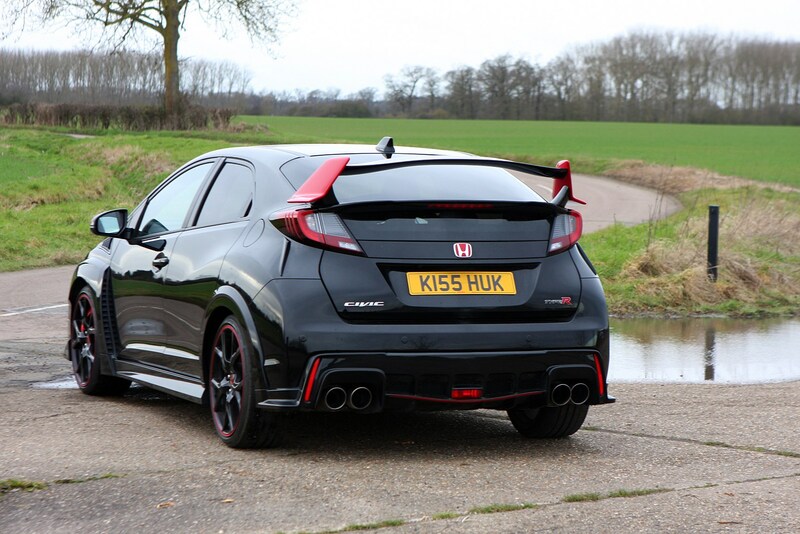 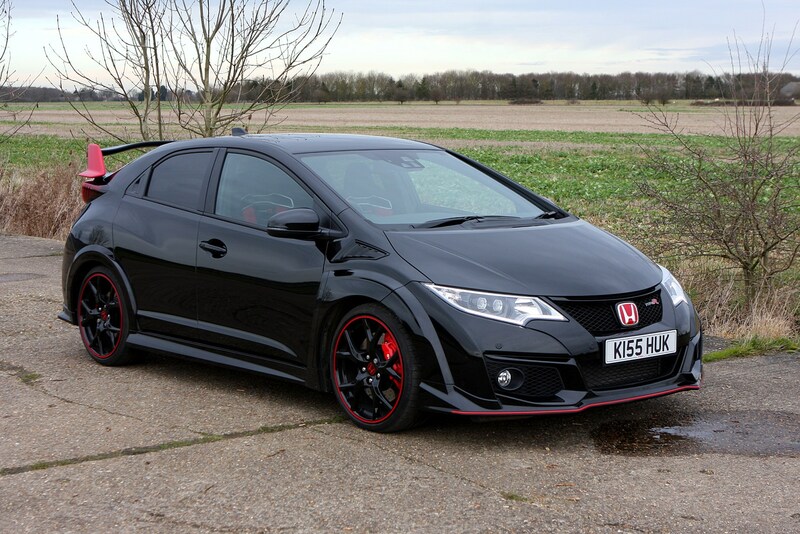 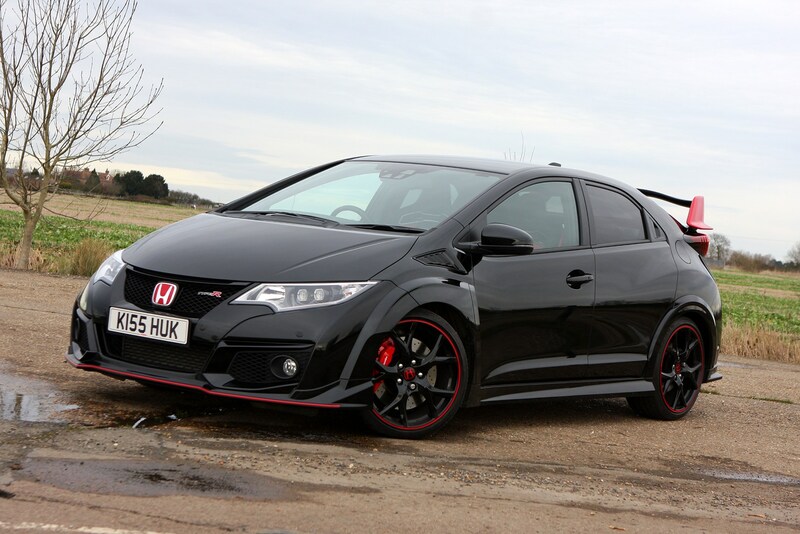 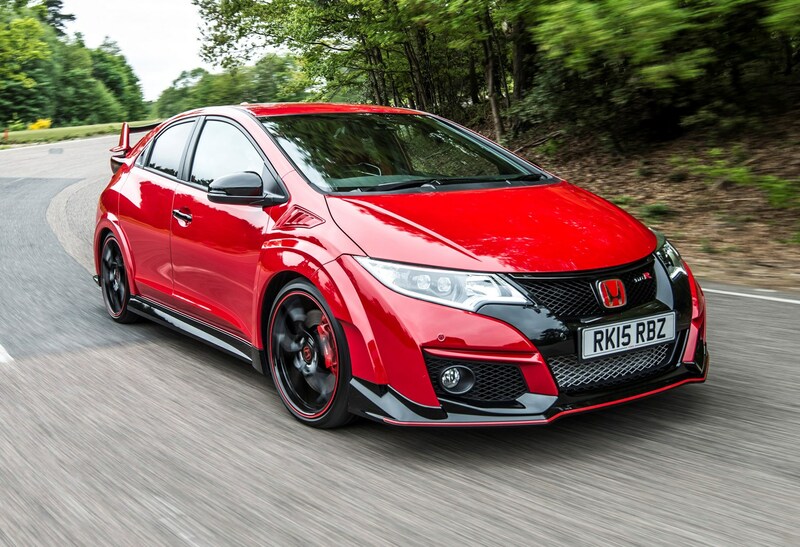 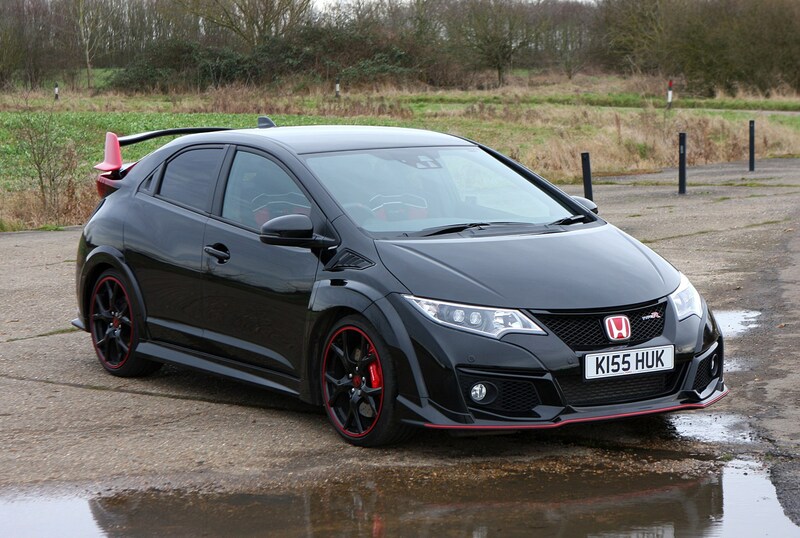 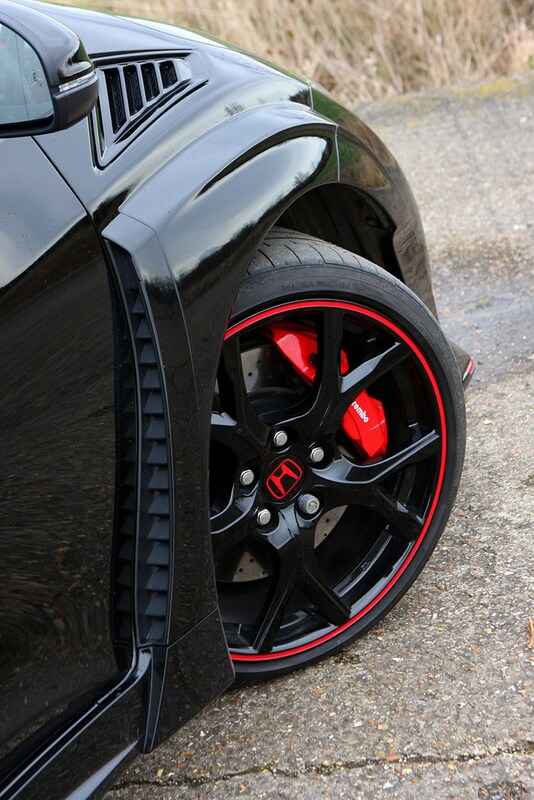 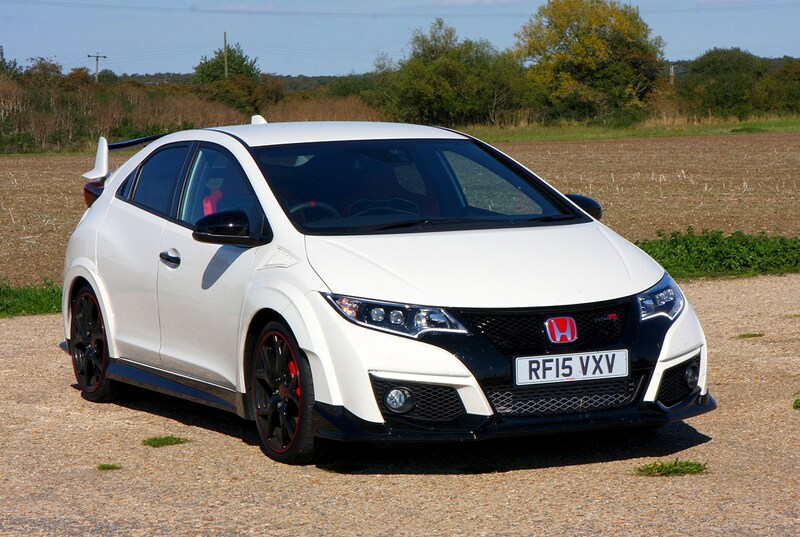 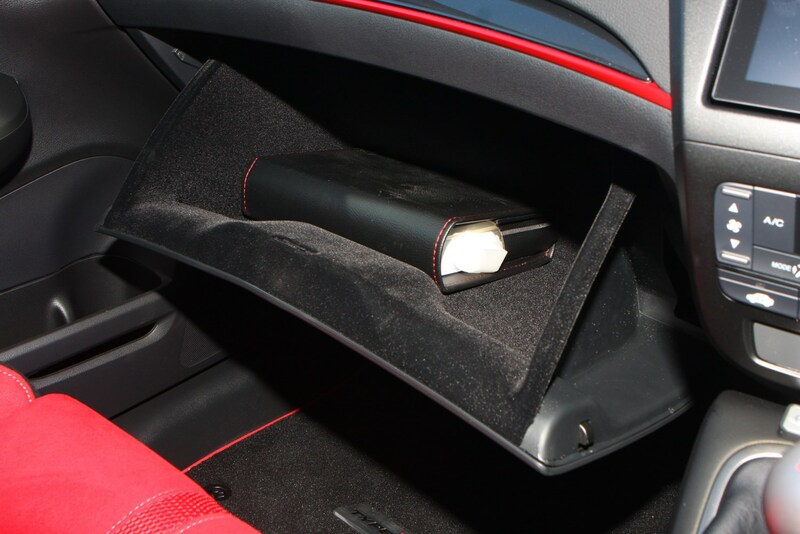 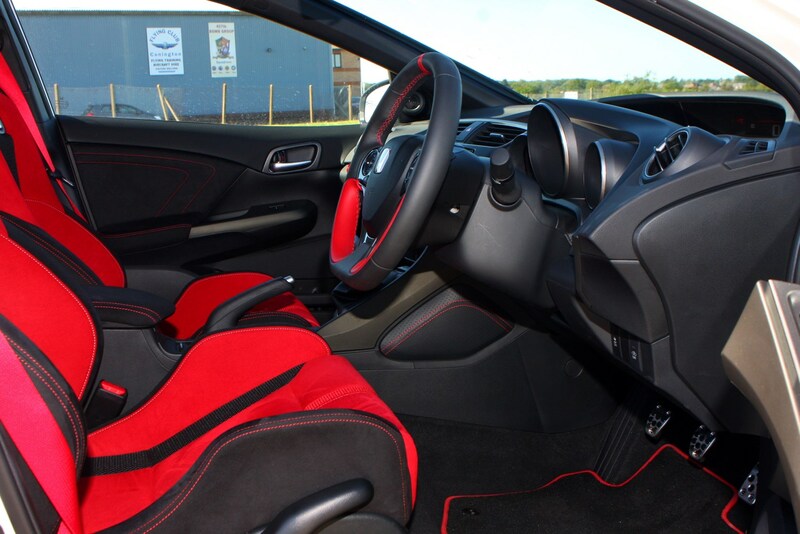 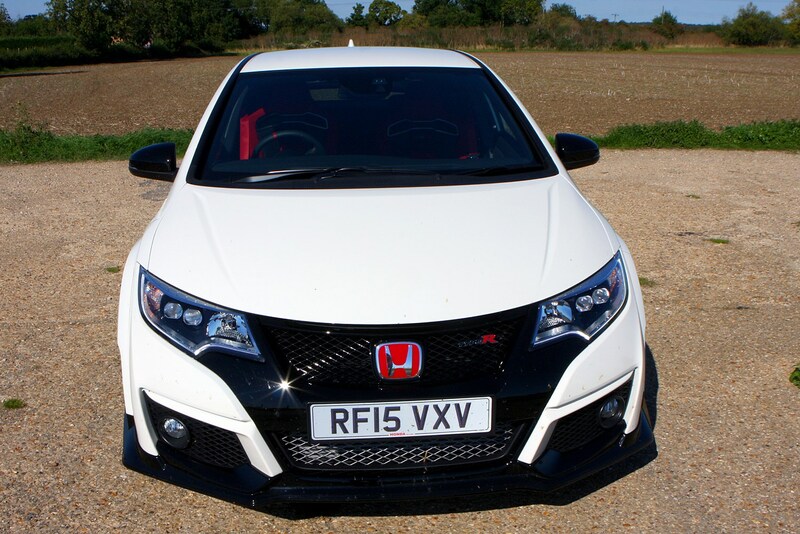 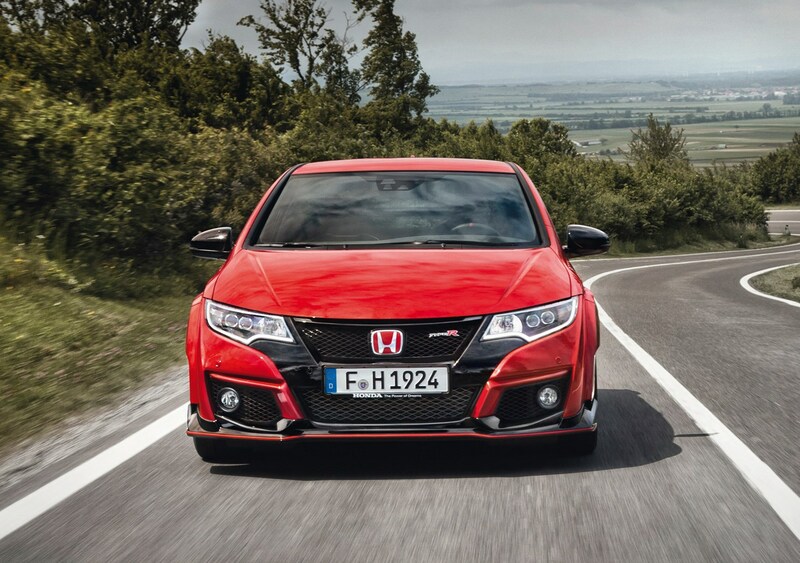 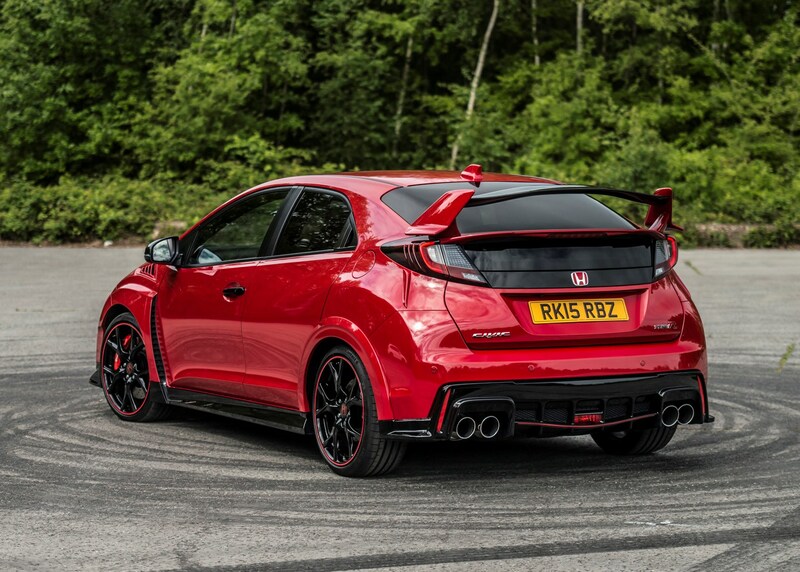 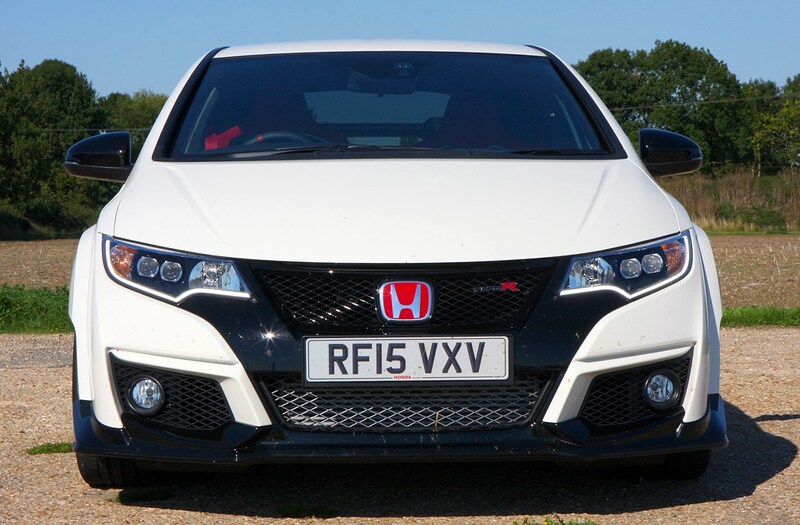 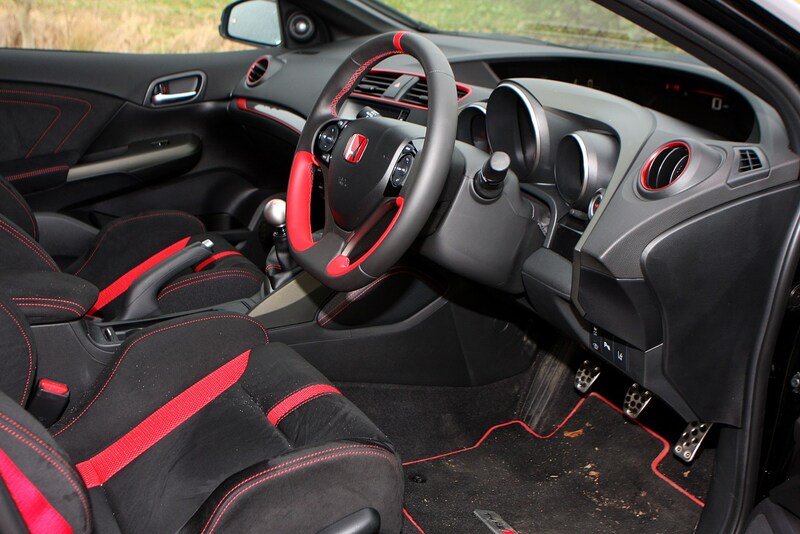 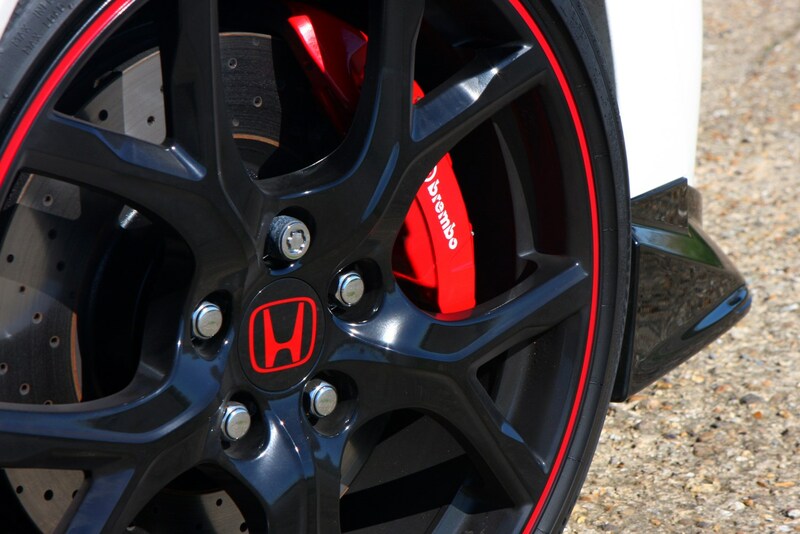 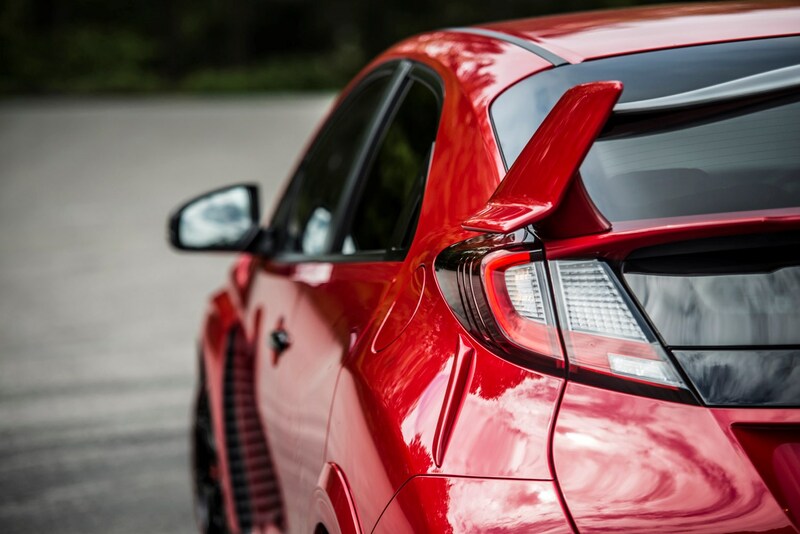 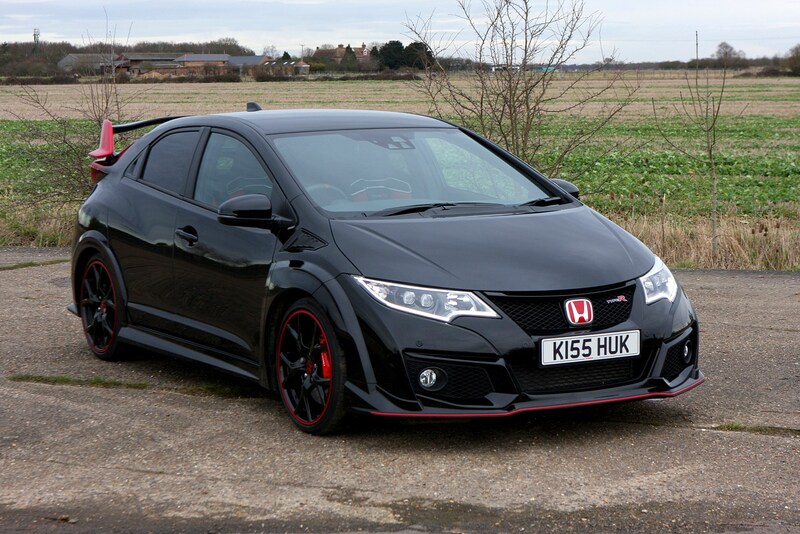 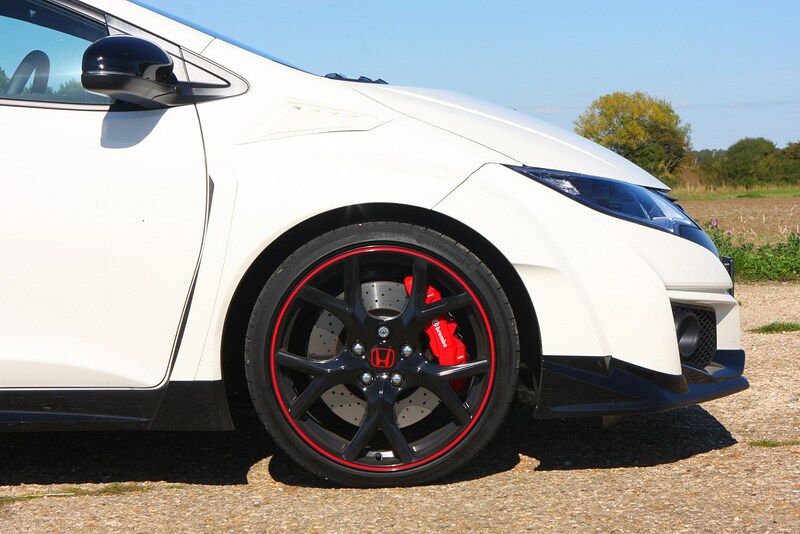 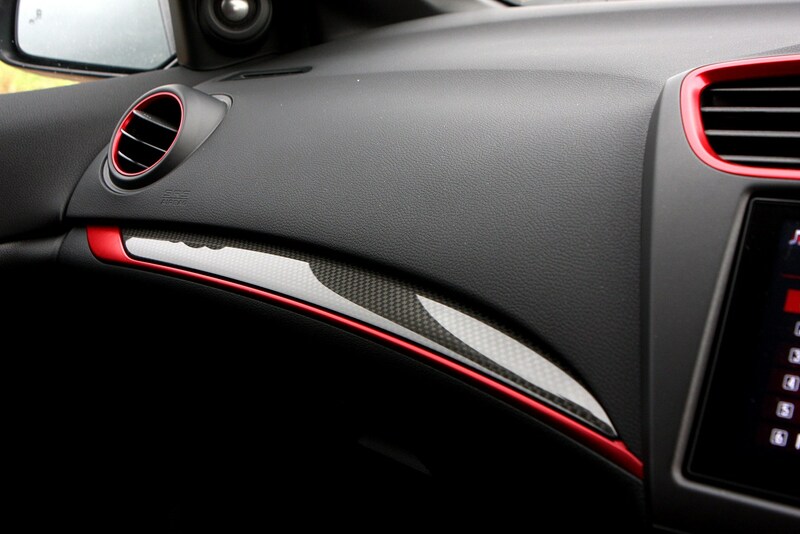 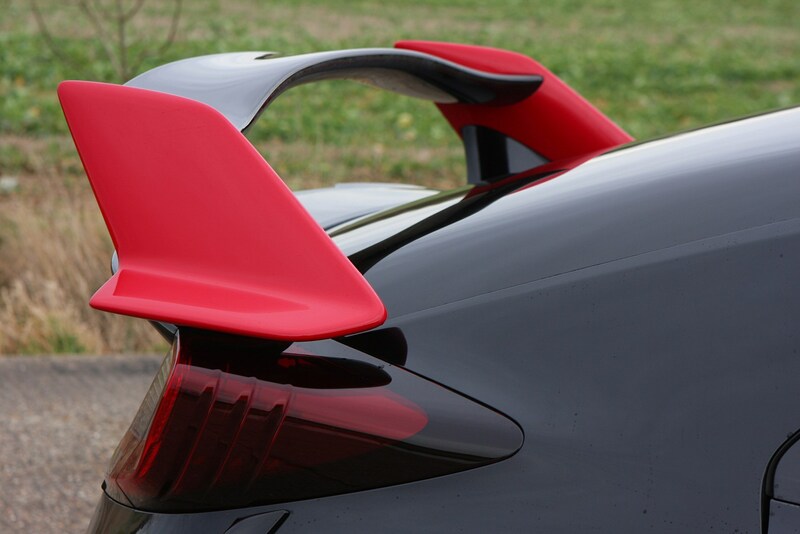 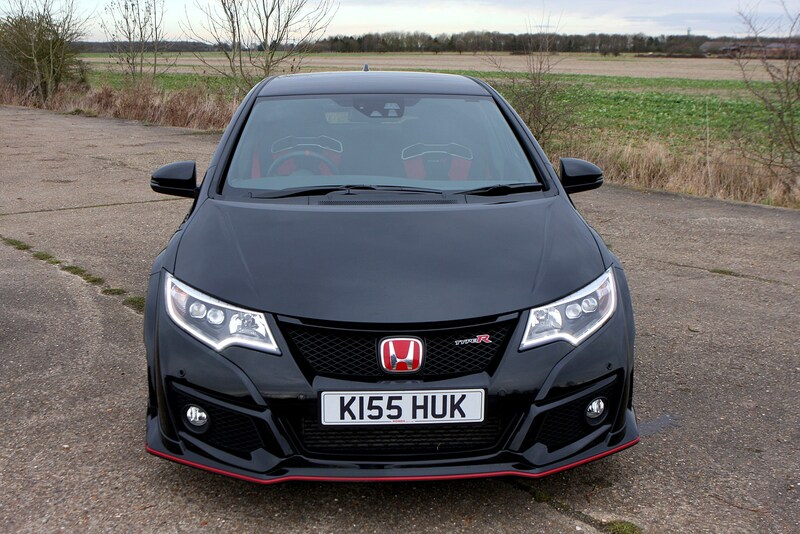 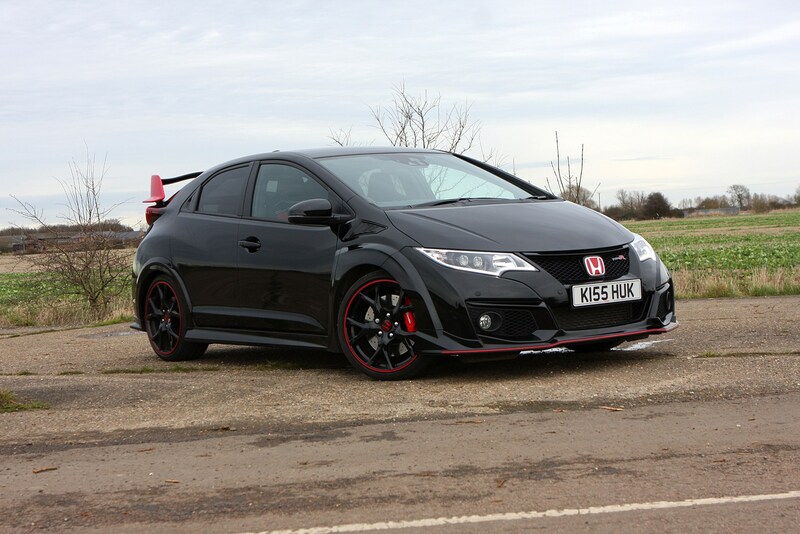 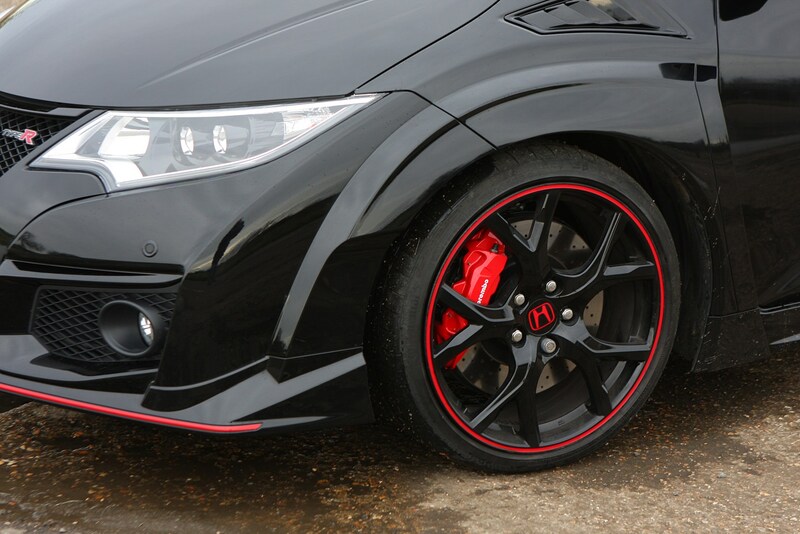 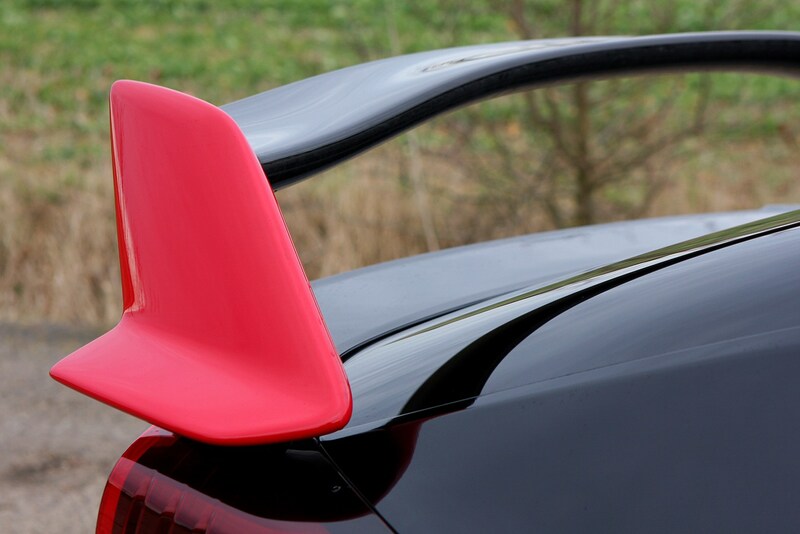 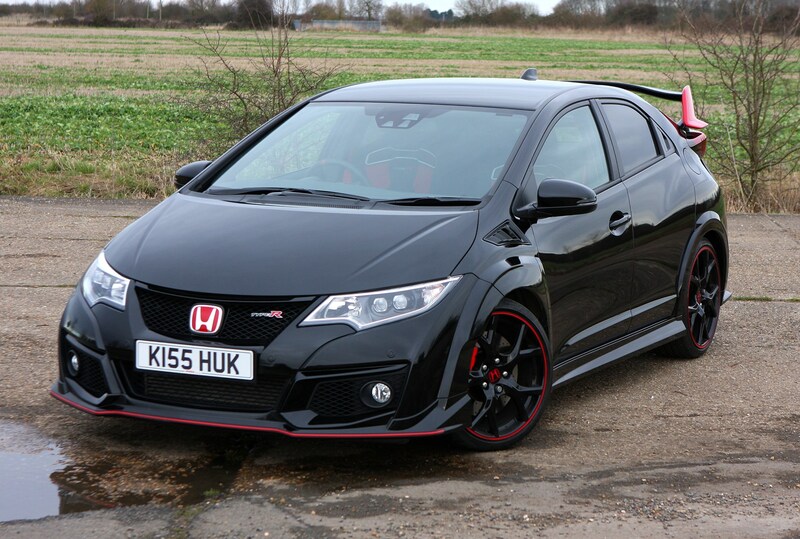 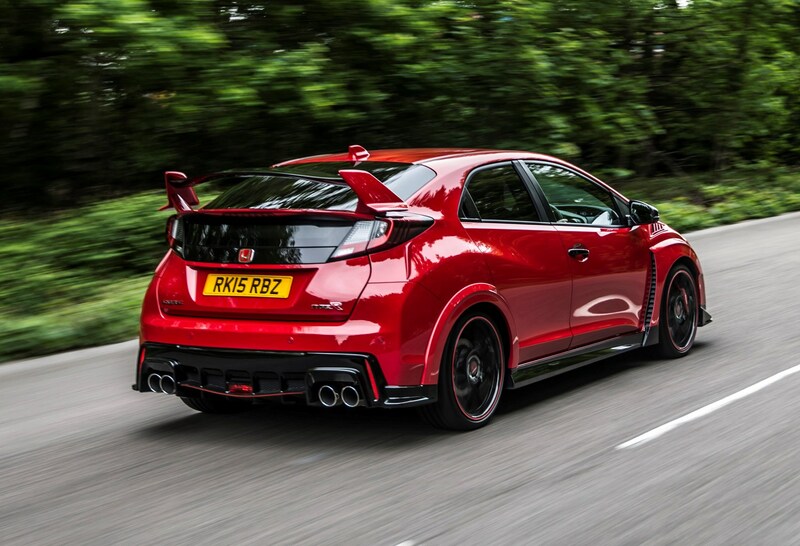 Then the – busy – cabin of this Civic Type R will be instantly recognisable to you. 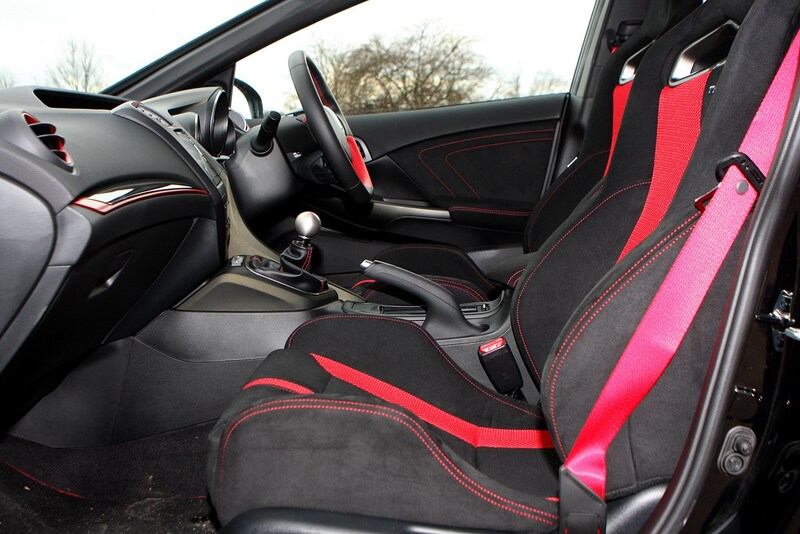 Except now it’s been swathed in a sea of red fabric, red leather, red stitching, black Alcantara and slivers of carbon-effect trim. 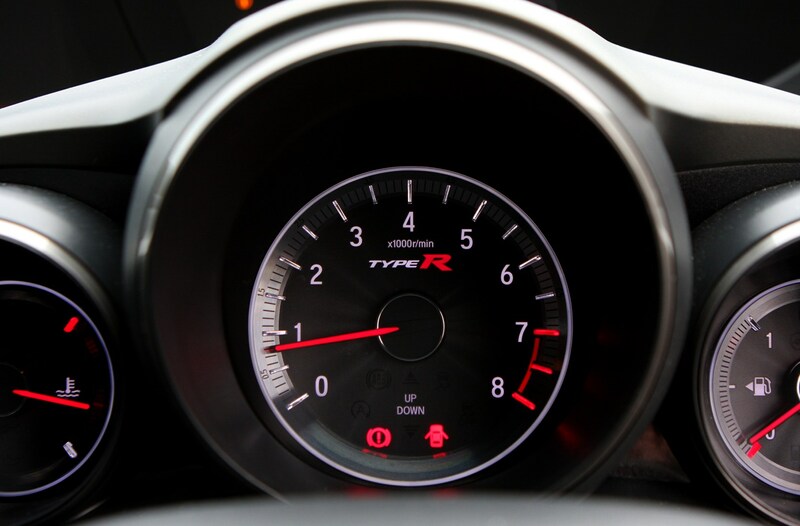 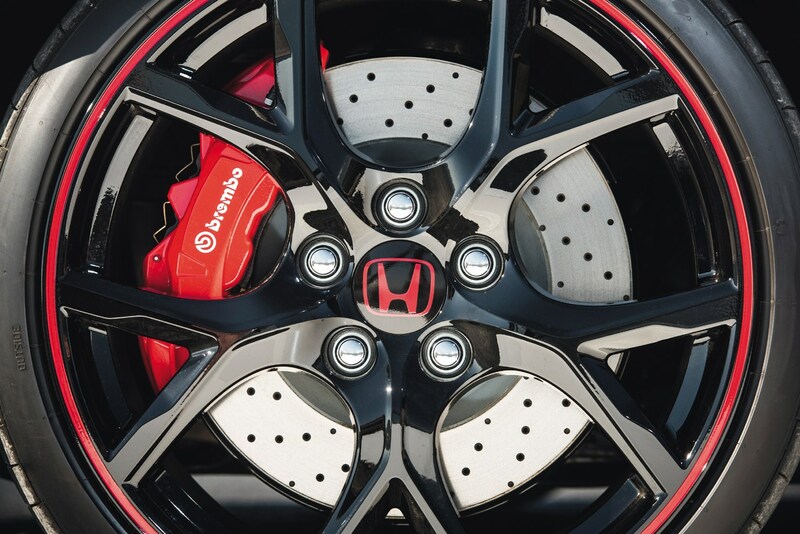 The steering wheel is also new for the Type R with slimmer spokes for a more comfortable grip and the machined aluminium gear knob is a nod to Type Rs of the past. 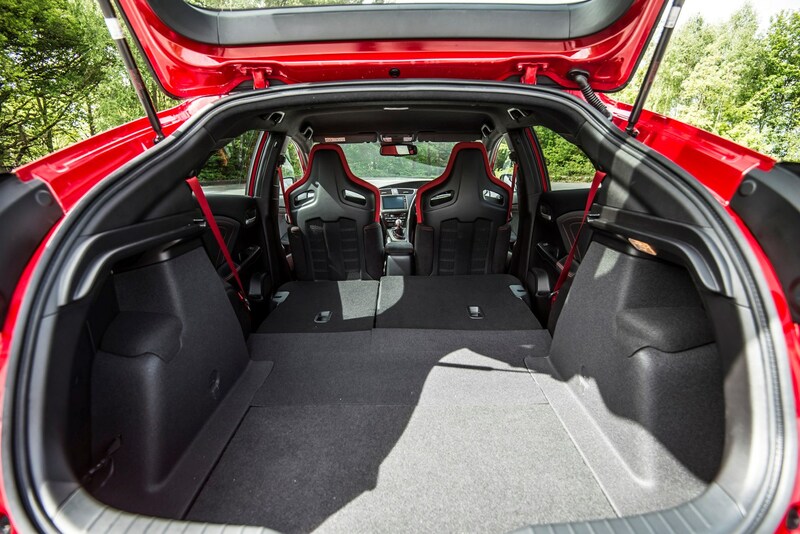 It is, without question, an obviously hot-hatch interior – and for many that’s a good thing. 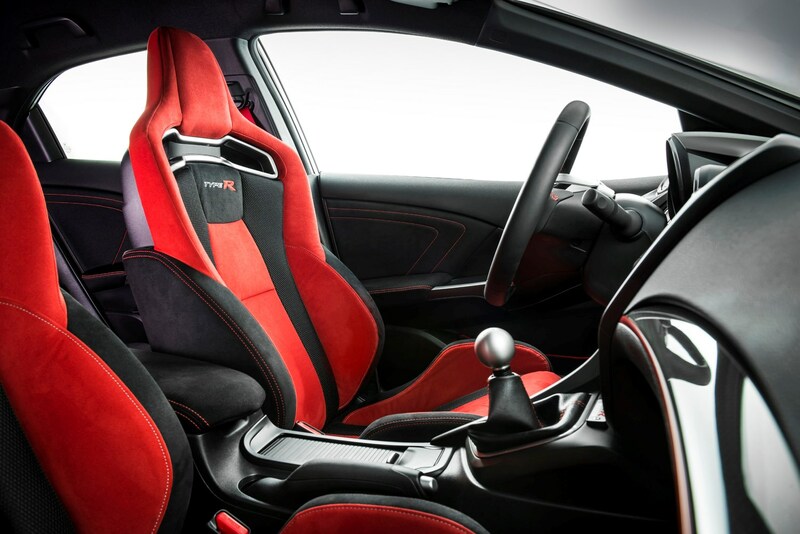 The seats are certainly a highlight, despite the slightly garish red used for most of their covering, thanks to the deep bolsters to the side of your hips and the enveloping shoulders higher up. 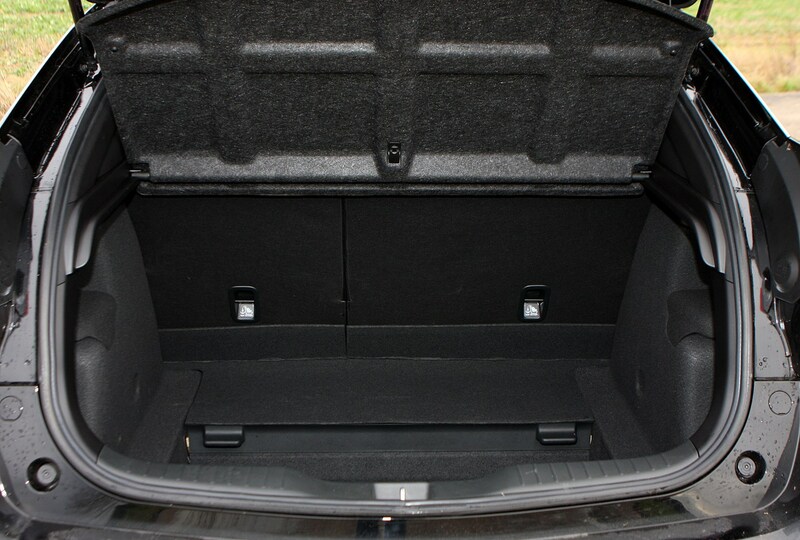 They’re 20mm lower than in a regular Civic, which is an improvement, though another 20mm further still would have made for a more pleasing position. 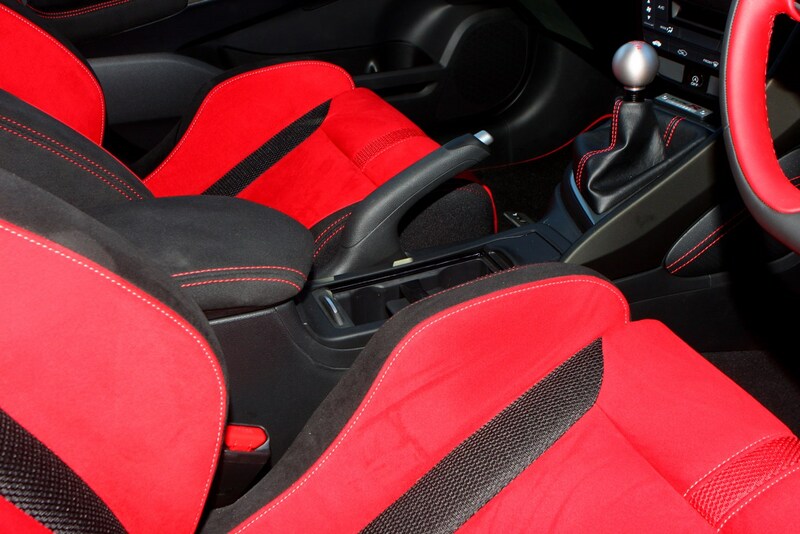 Despite their support and extreme look they feel perfectly comfortable too. 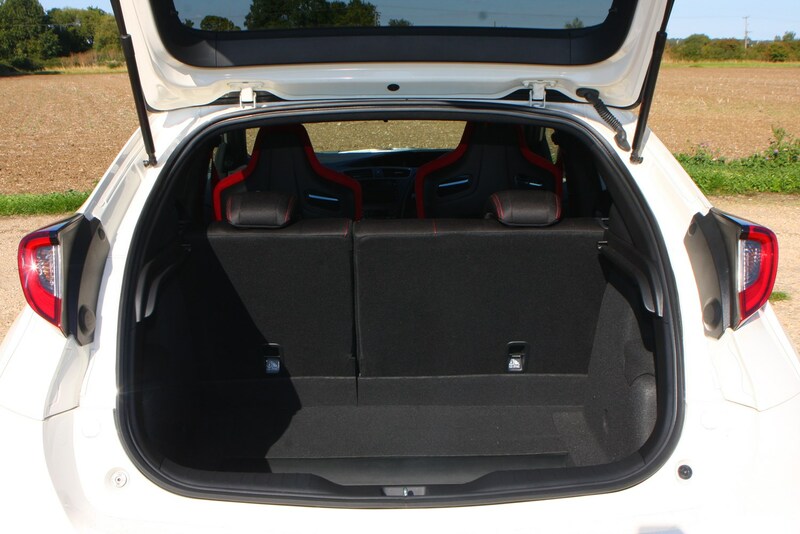 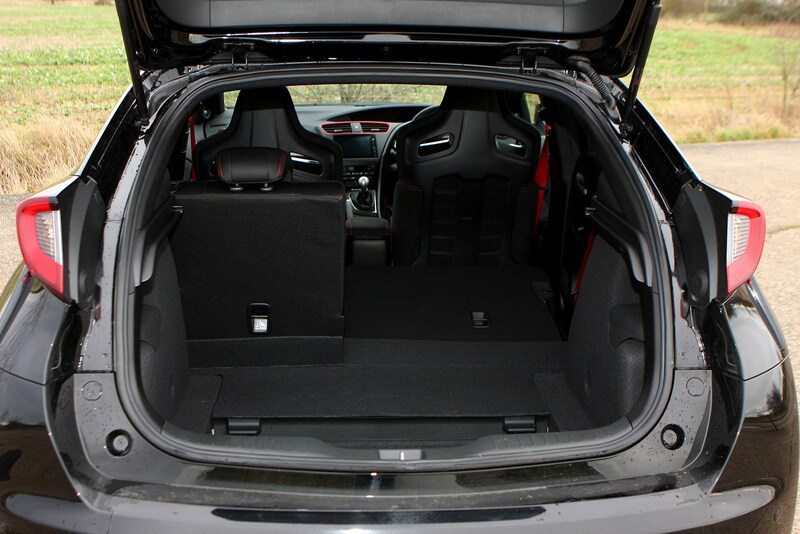 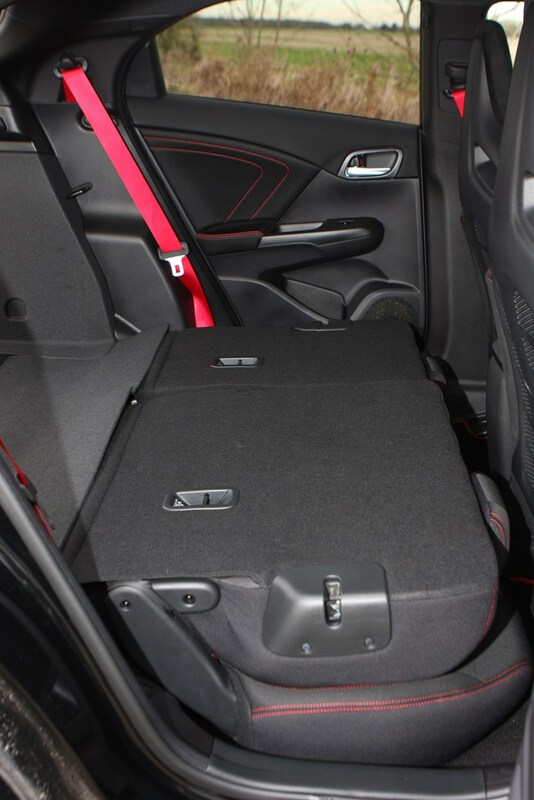 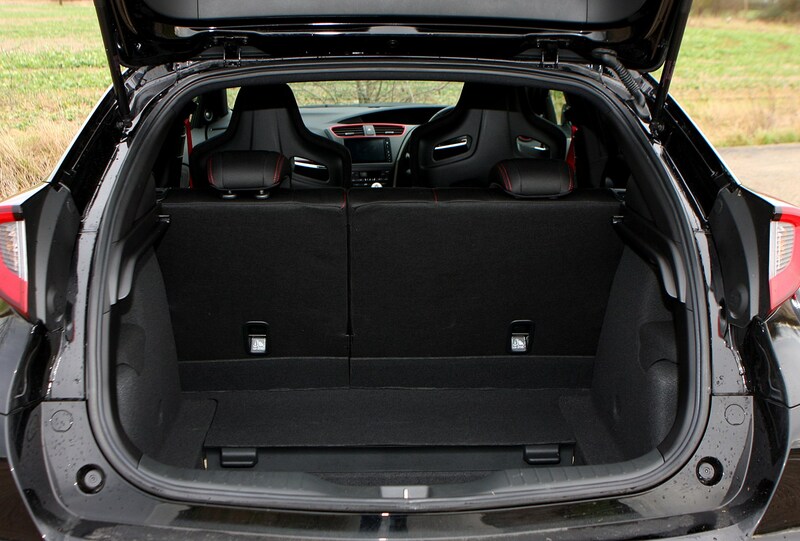 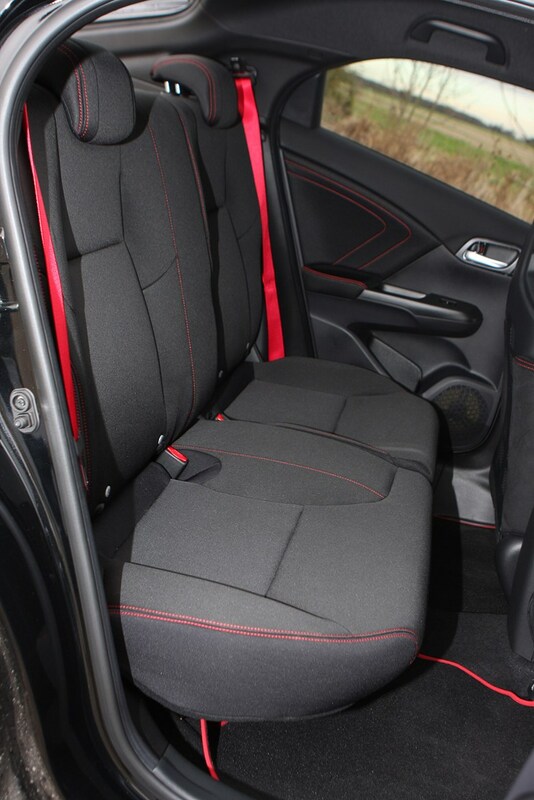 Like its predecessors the rear seats lose the red, the black bench merely trimmed with red stitching and augmented by the red seatbelts. 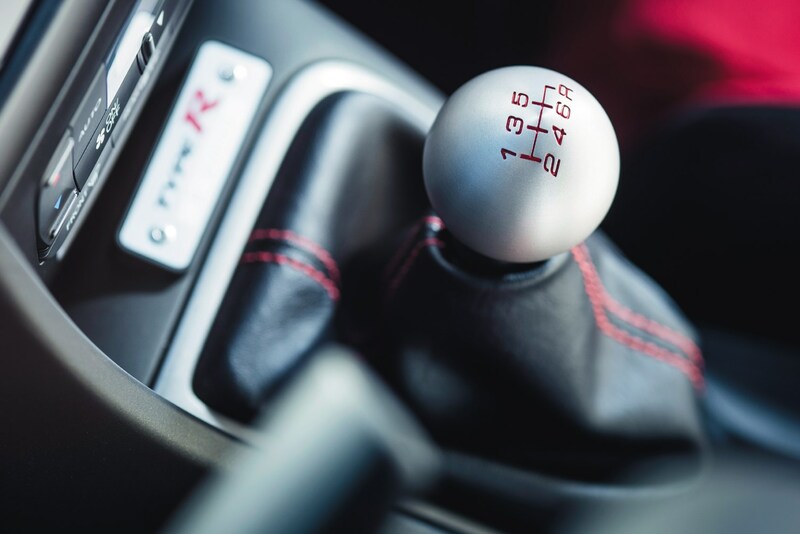 That gear knob is another talking point with the previously lauded short throw and tactile metal spherical grip – but you don’t have to move your hands far from the wheel to swap cogs, ideal for quick changes on the move. 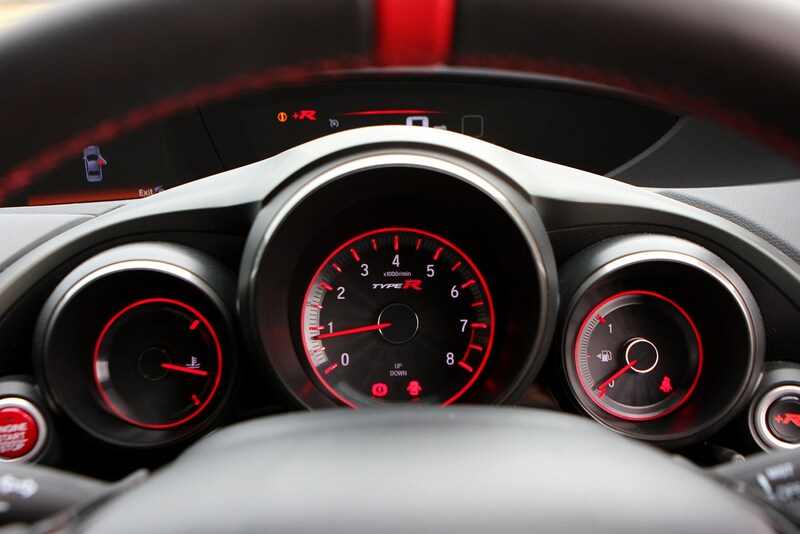 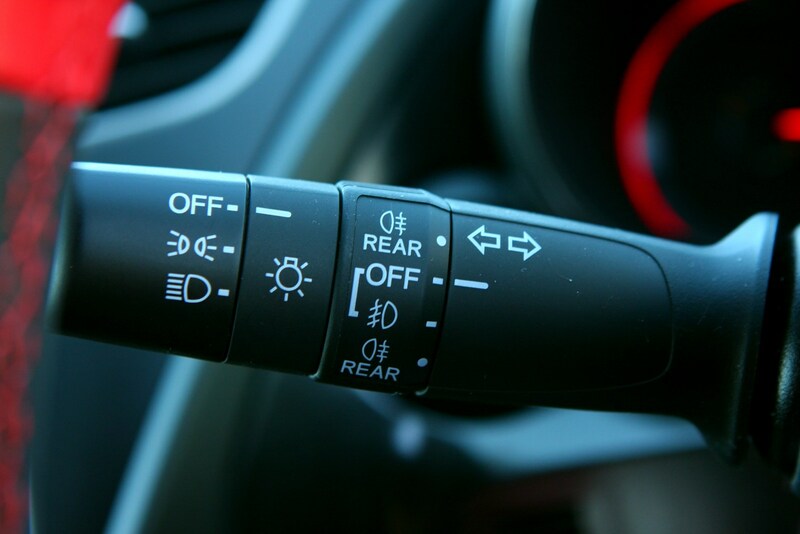 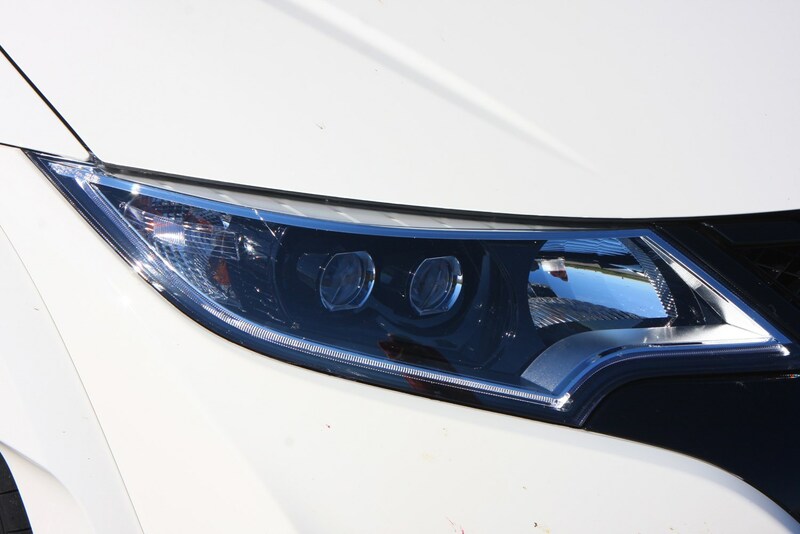 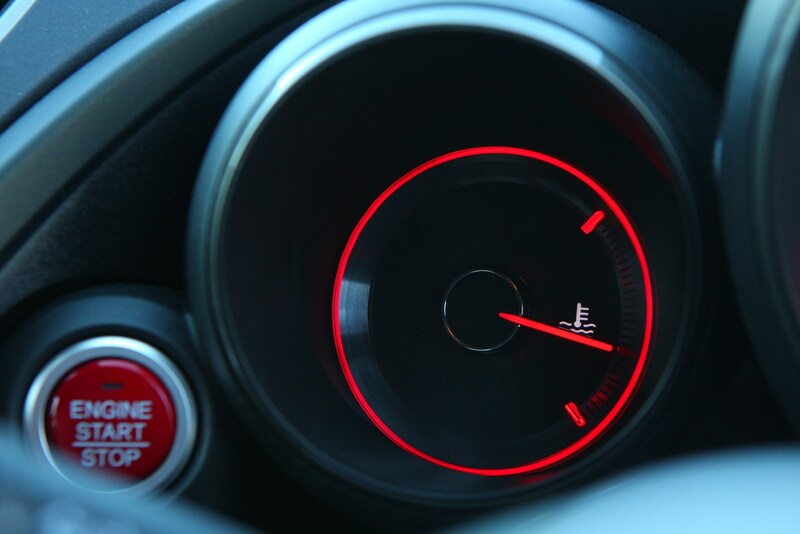 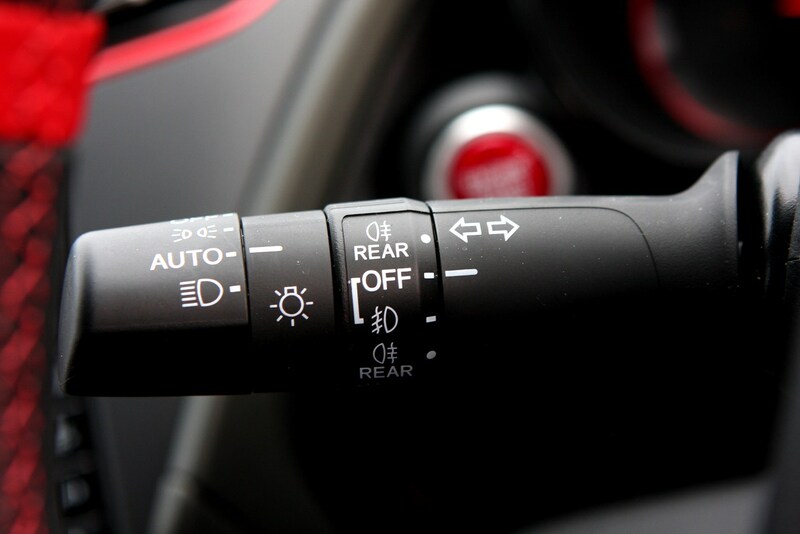 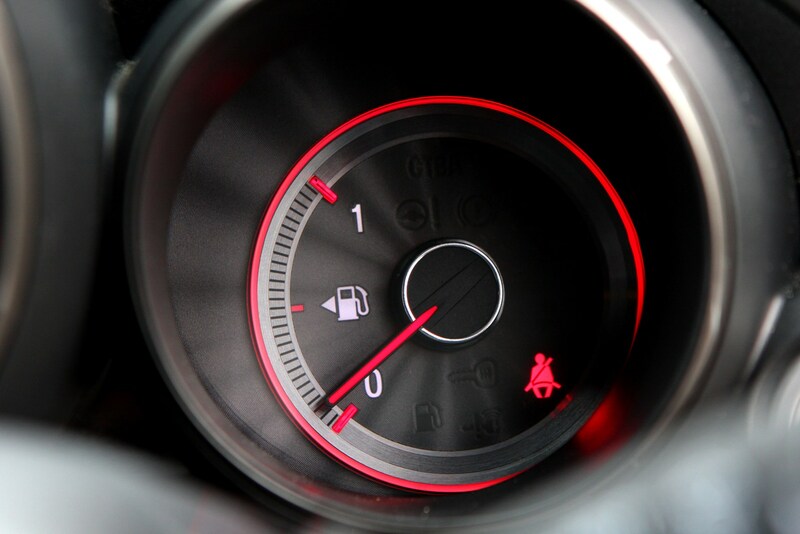 The shift lights, which converge as you get closer to the top of the engine’s rev range, just above the speedometer are an excellent touch, perfect for avoiding any embarrassing nudges of the rev-limiter when driving hard. 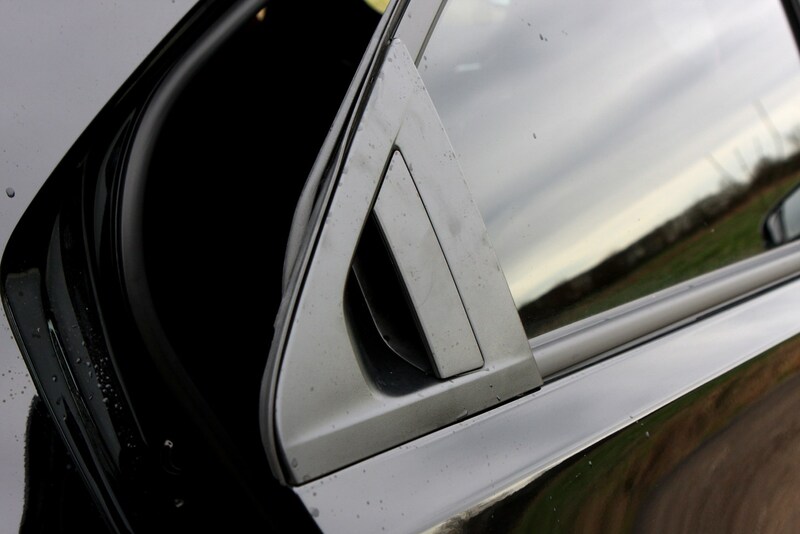 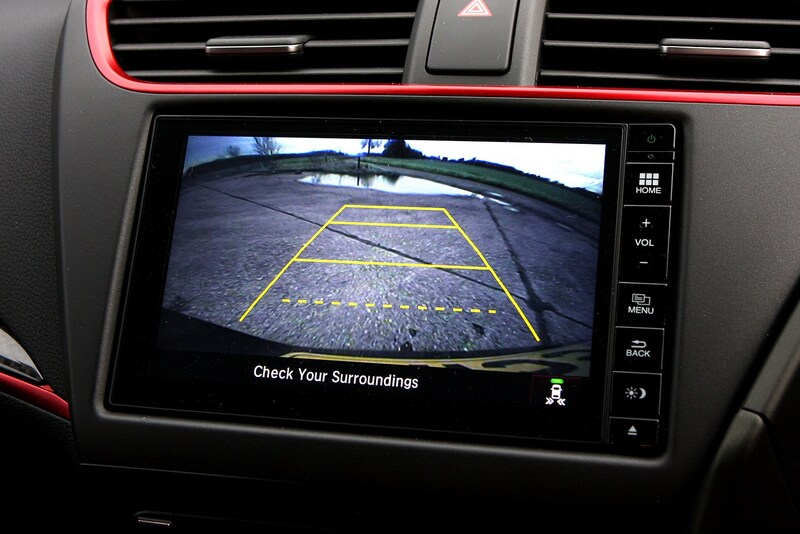 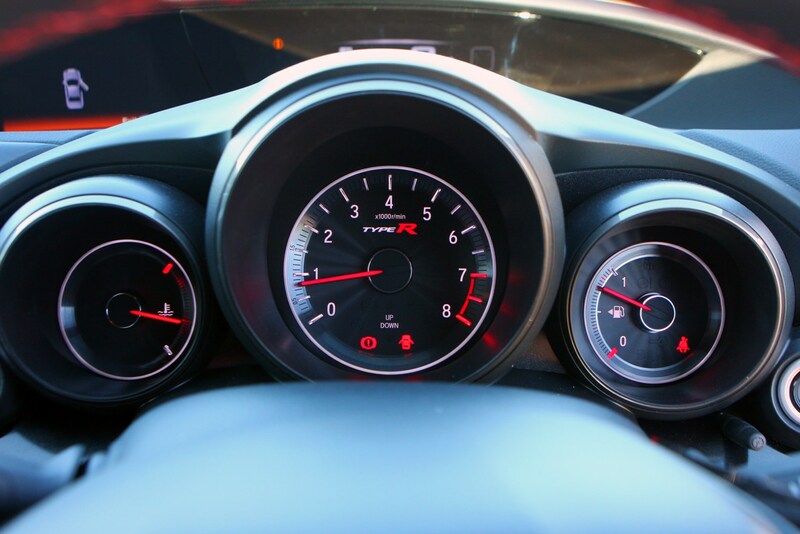 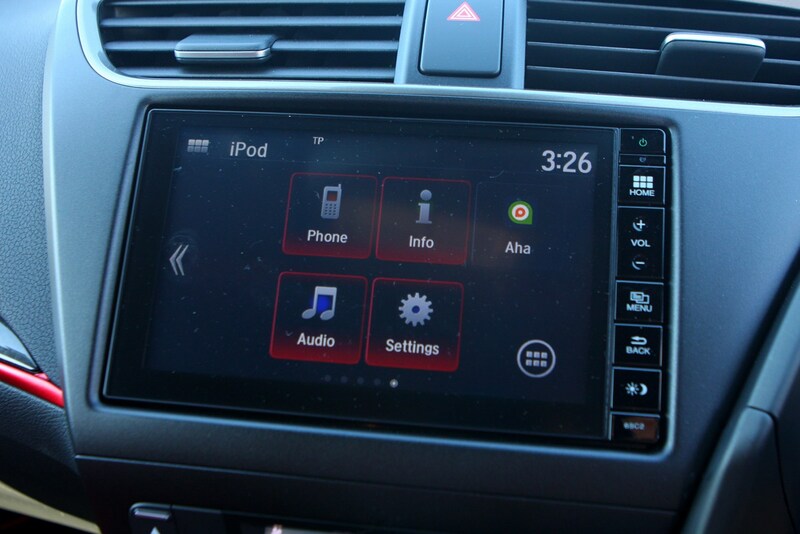 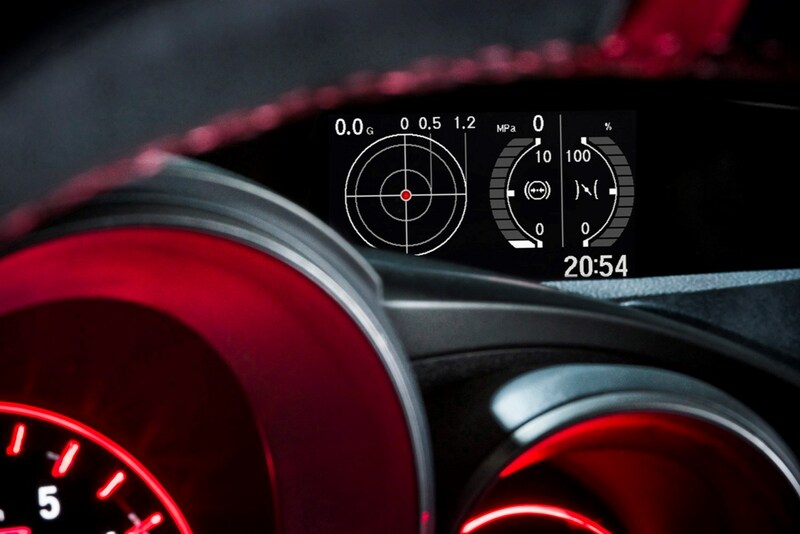 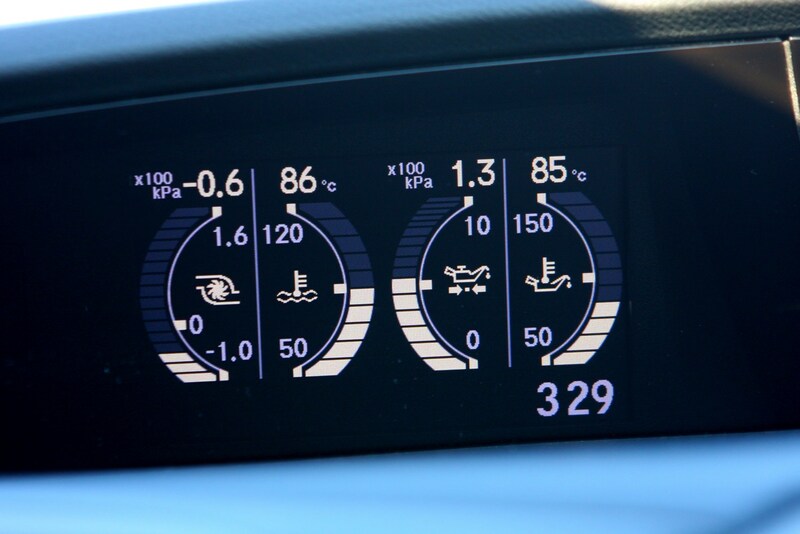 However, the scatter gun approach to the layout of the cabin and the mismatch between the various digital displays and screens – which are admittedly faults shared with the regular Civic – are disappointing and detract from the otherwise quality feel of the materials and engineering depth of this car. 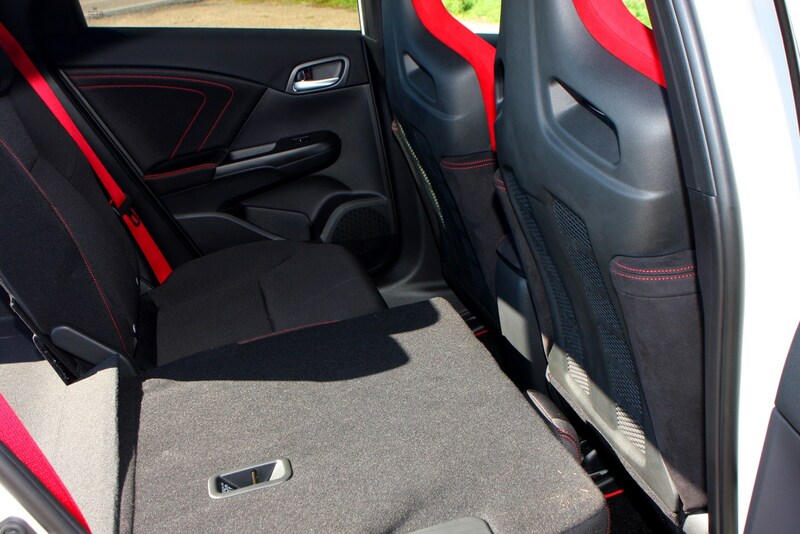 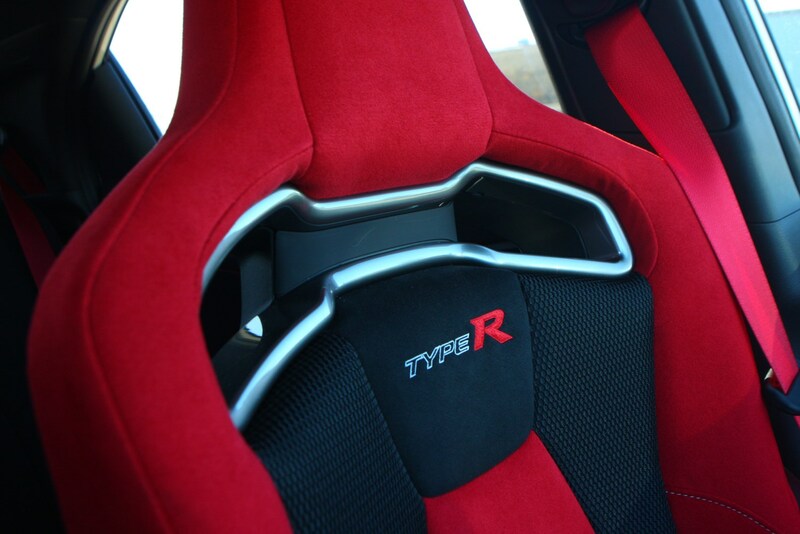 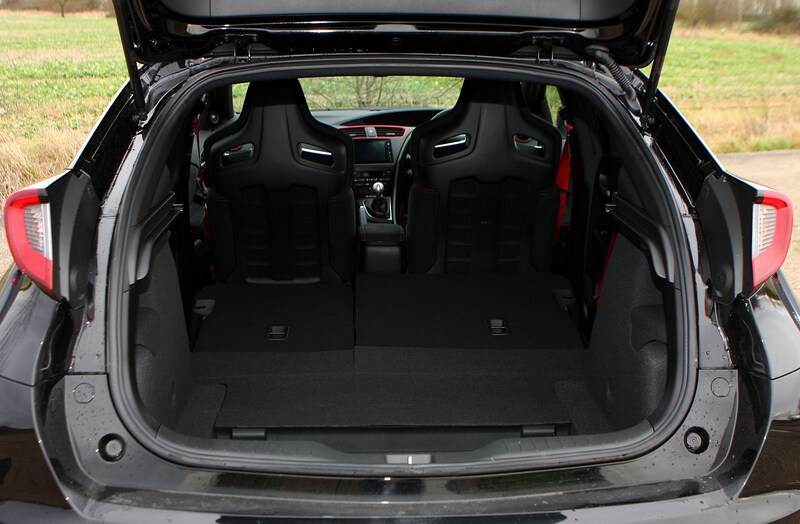 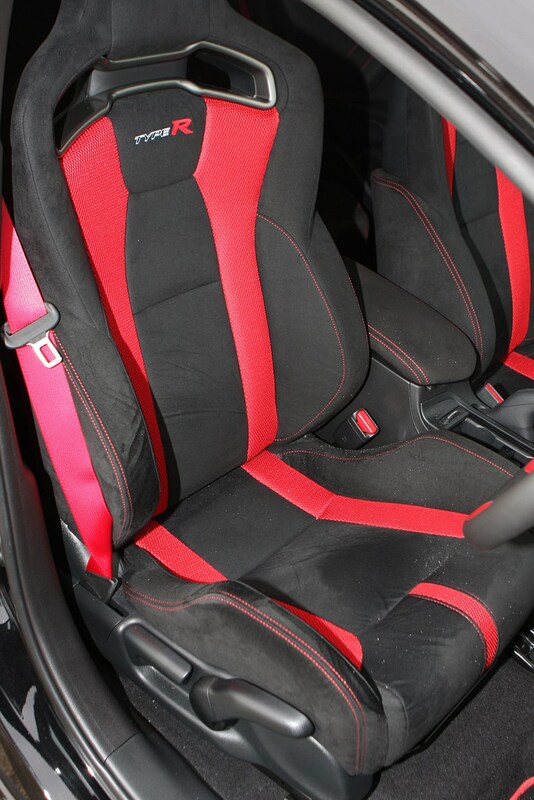 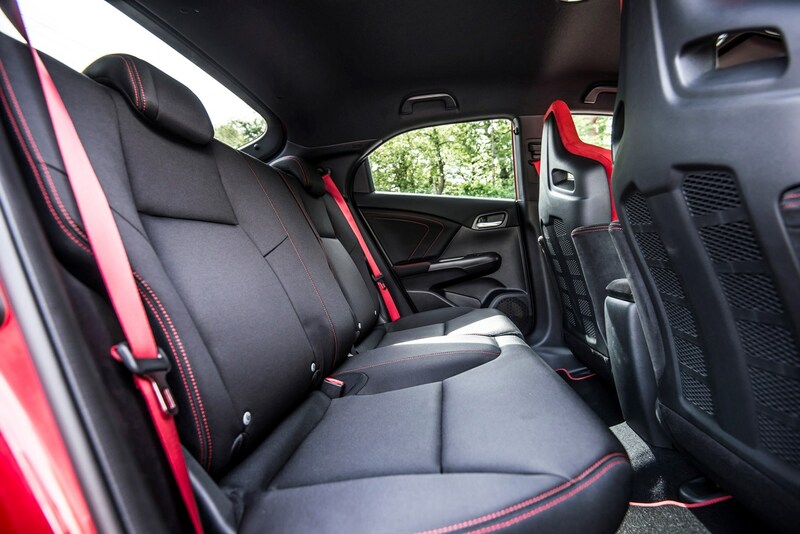 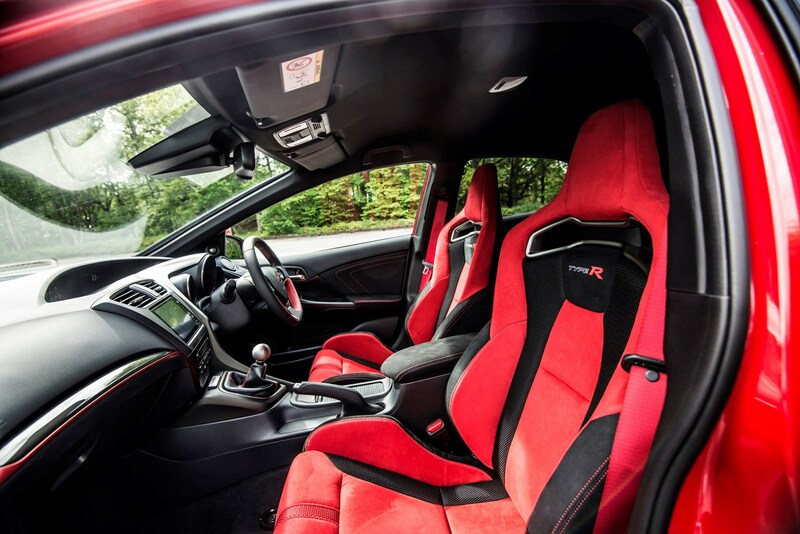 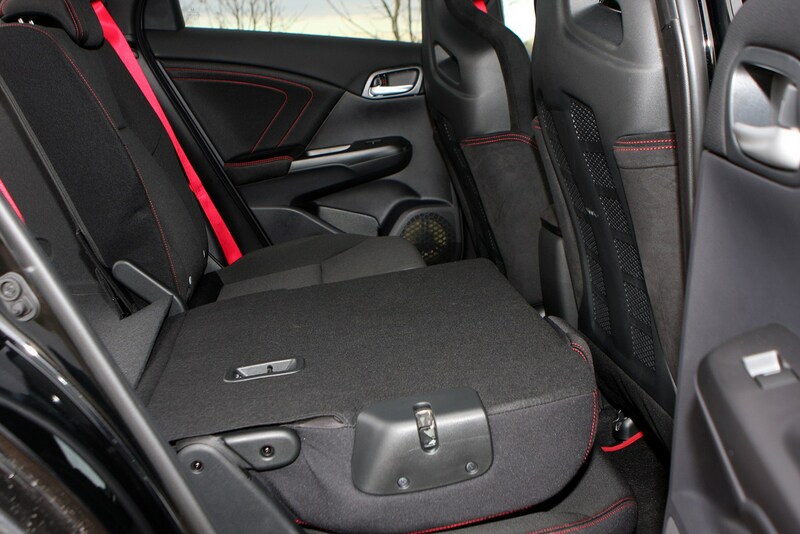 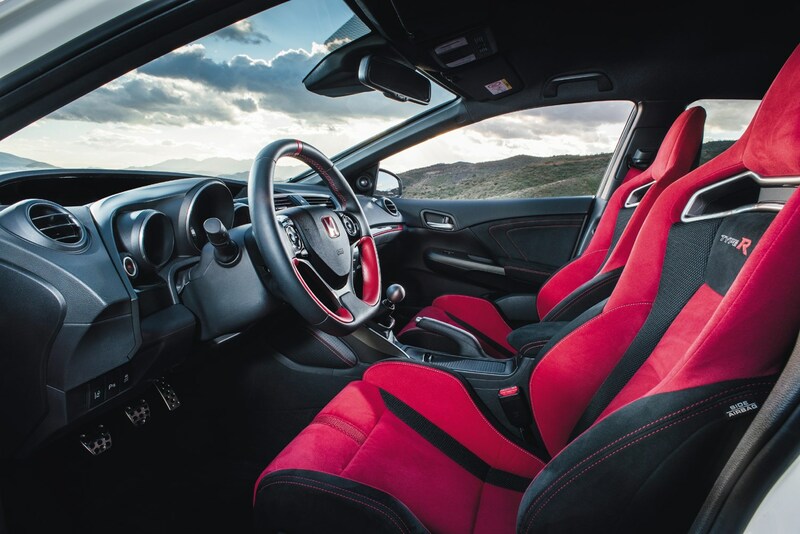 Sit up front and the excellent chairs mean Honda Civic Type R comfort is superb; there’s plenty of support to keep you composed at speed and for longer journeys there’s enough give in the cushions to eliminate any backache or numb bum syndrome. 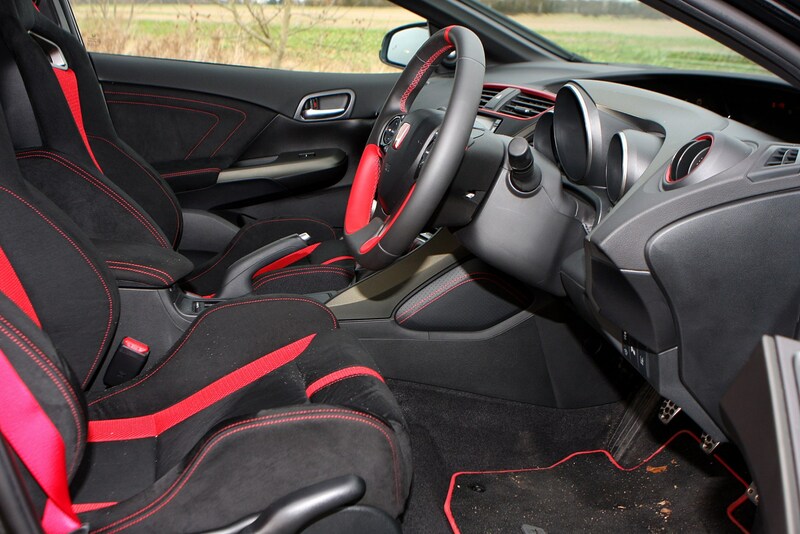 We only wish they were mounted 20mm further lower still (they’re currently 20mm lower than the standard car’s ordinary chairs) to take advantage of what would otherwise be a near perfect driving position. 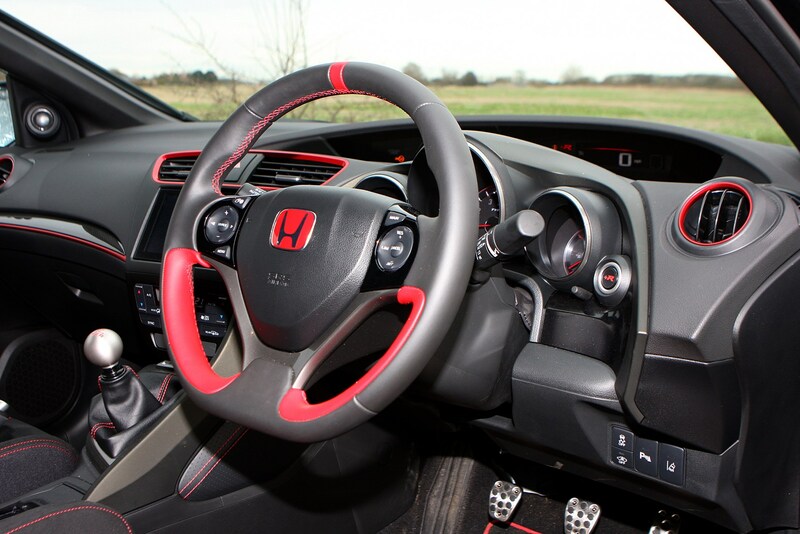 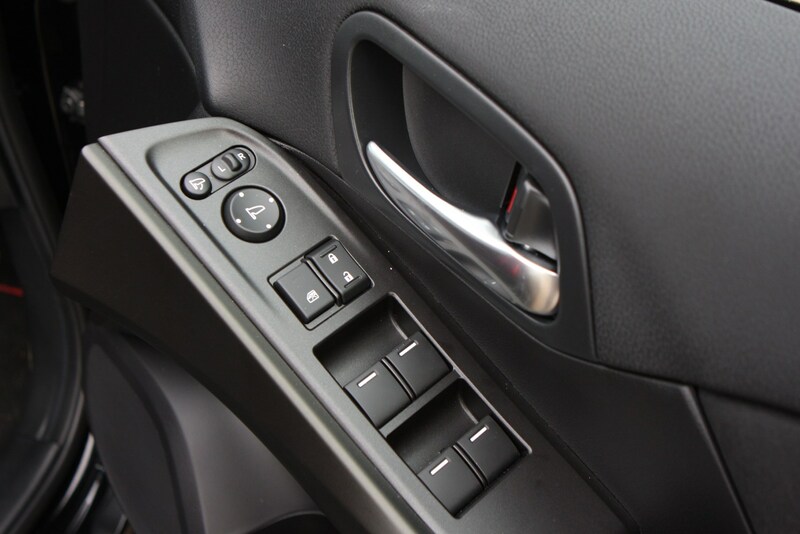 The gear knob is closely placed next to the steering wheel, itself featuring thinner spokes for a more comfortable grip and the pedals are perfectly placed for heel and toe gear changes. 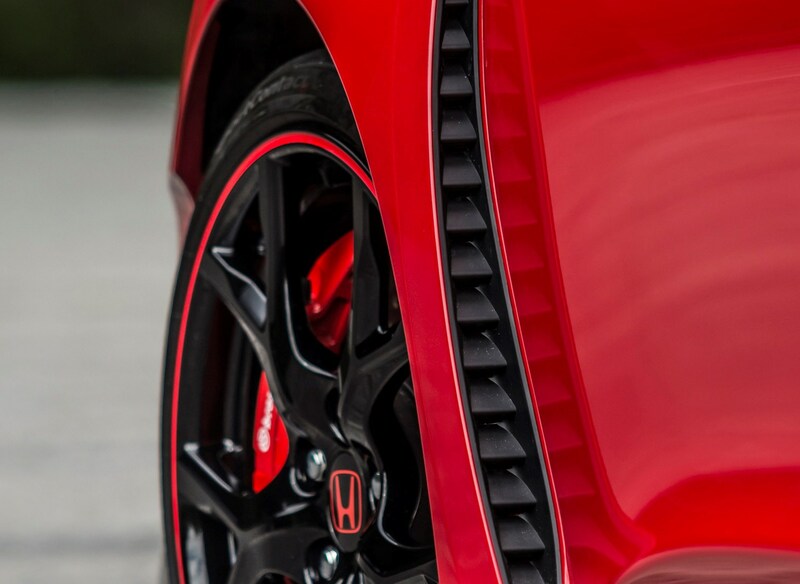 But by God this car is firm. 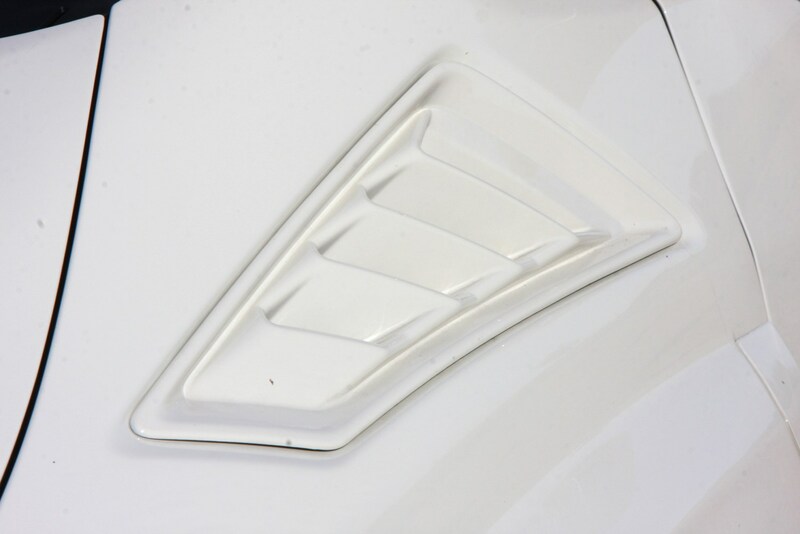 Like really firm. 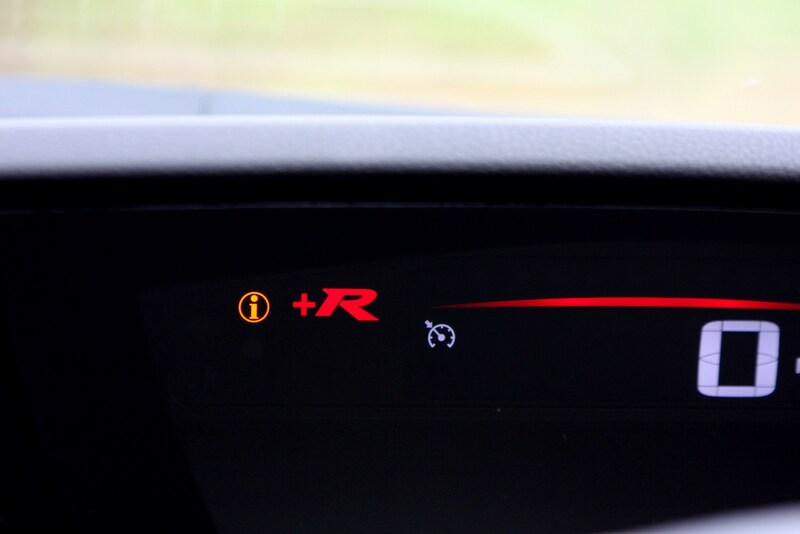 That means it stays almost resolutely flat when cornering at speed, which is clearly commendable, but does deteriorate from your comfort when on longer more mundane trips across arrow straight roads. 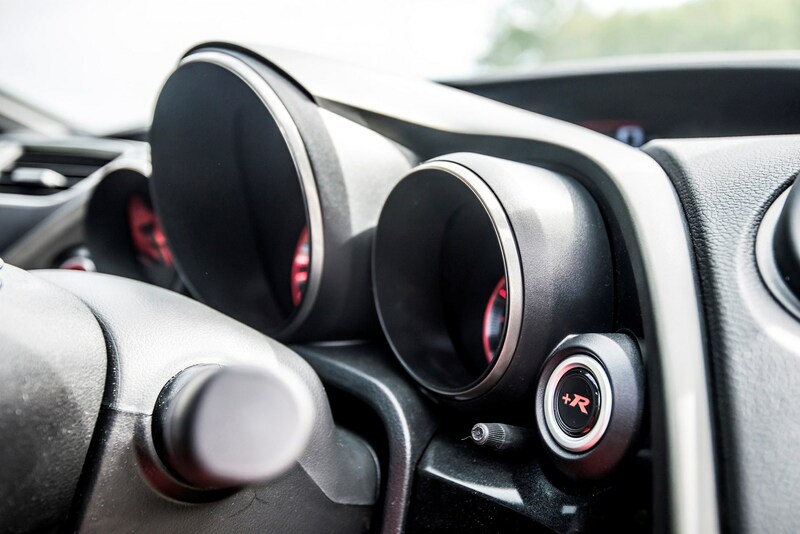 There’re adaptive dampers too, which constantly monitor the car’s movements and adjust the oil channels within to subtly change the damping response. 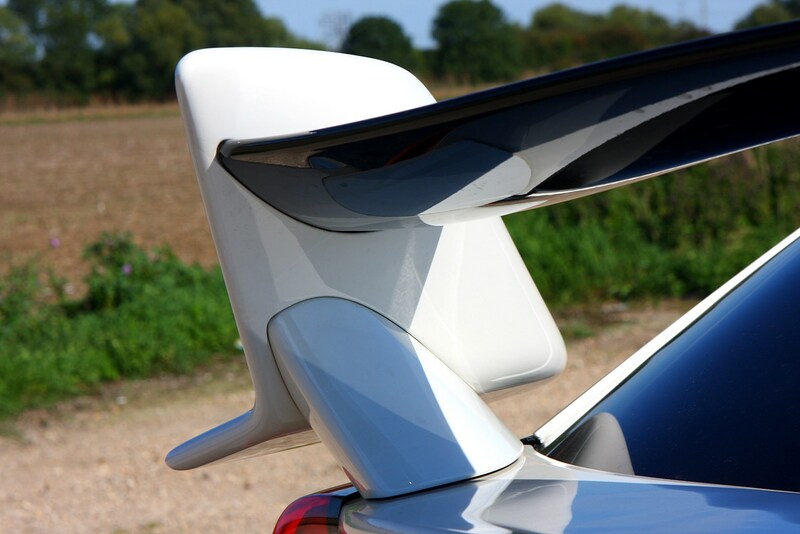 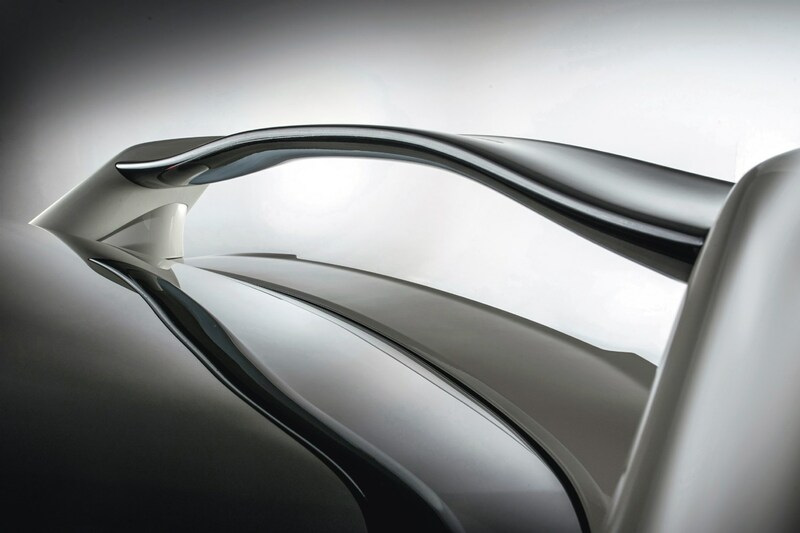 This eliminates dive and pitch under hard braking and accelerating, as well as ensuring a level body during extreme crosswinds for example. 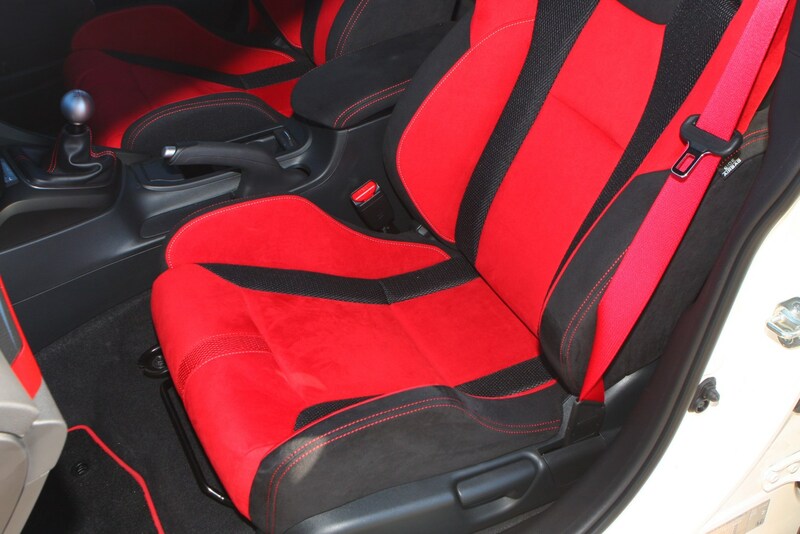 They just don’t soften off to the point of comfort. 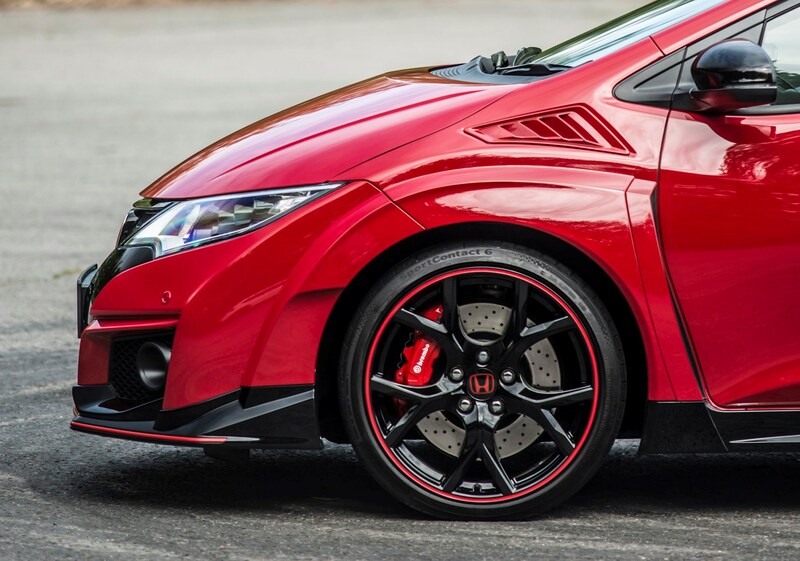 Of course part of the problem could be the 19-inch alloy wheels, which run narrow sidewalled 235/35R19 rubber. 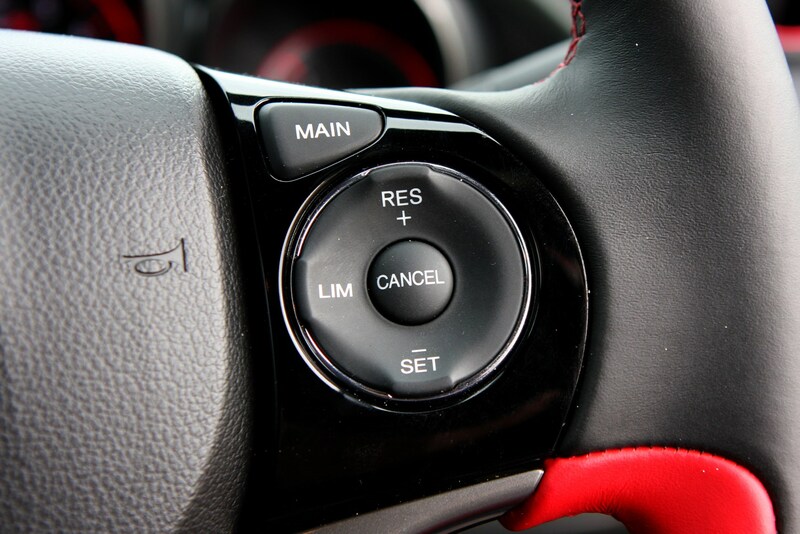 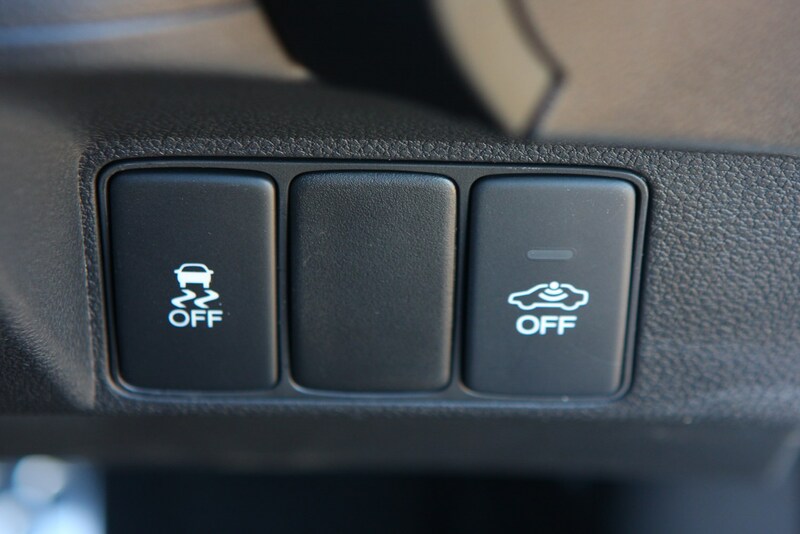 You can make it 30 percent stiffer if the masochist mood takes you, by pressing the +R button to the right of the steering wheel. 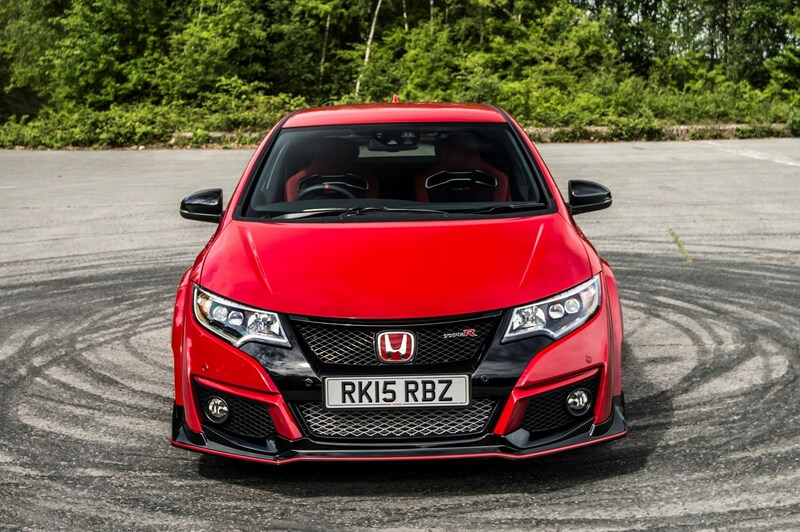 Designed single-mindedly with the Nurburgring in the engineers’ thought processes, the firm does concede while the increase in stiffness helped around the Green Hell, it’s not much benefit anywhere else – even another race circuit. 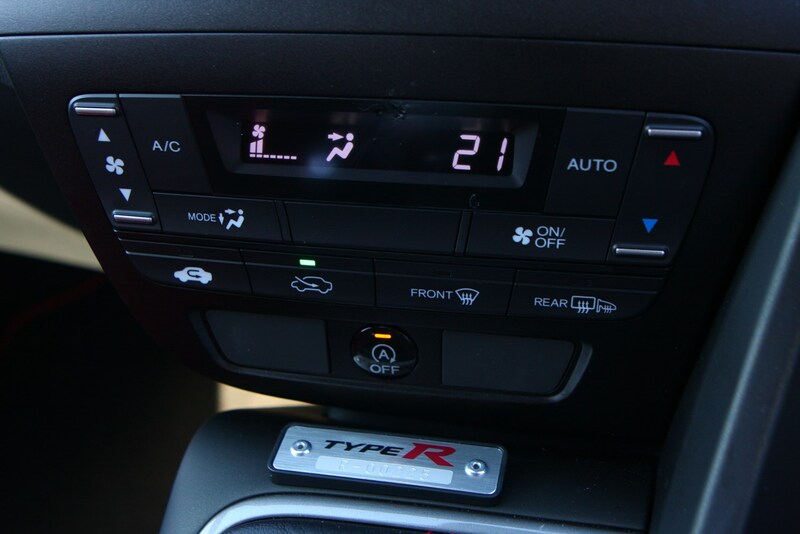 Certainly on our test we managed to have it engaged on the road for mere seconds, not minutes, before reverting back to ‘normal’ mode and even on track it felt decidedly firm. 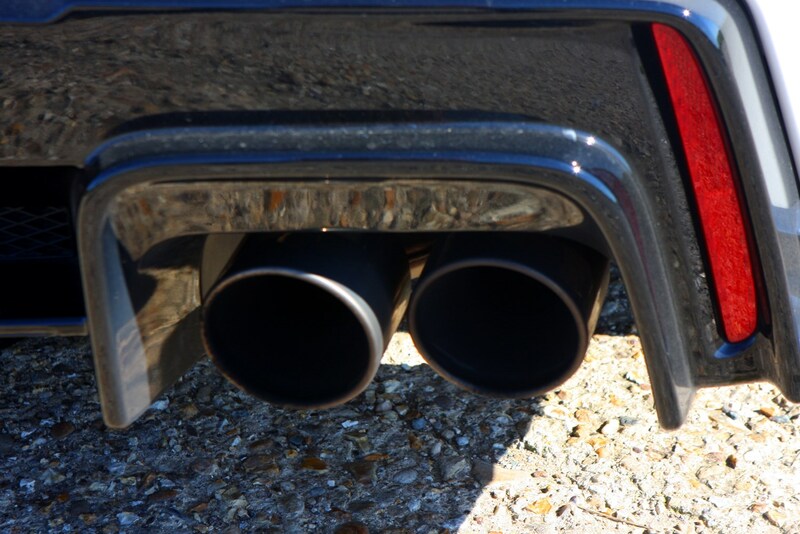 One thing we do wish was switchable is the exhaust, which feels loud under hard acceleration and constantly droning at a considered cruise. 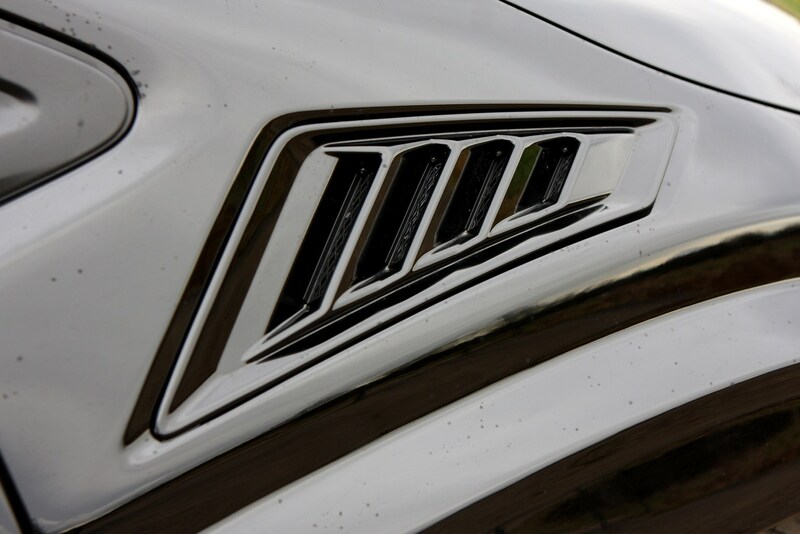 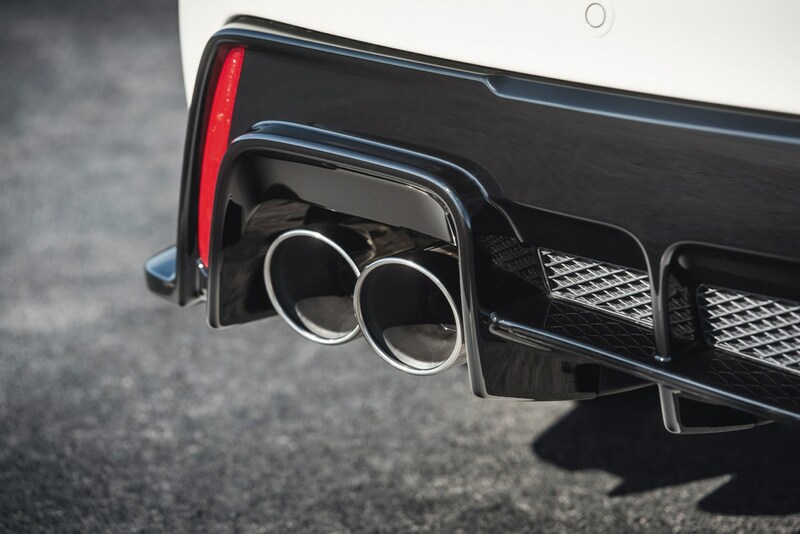 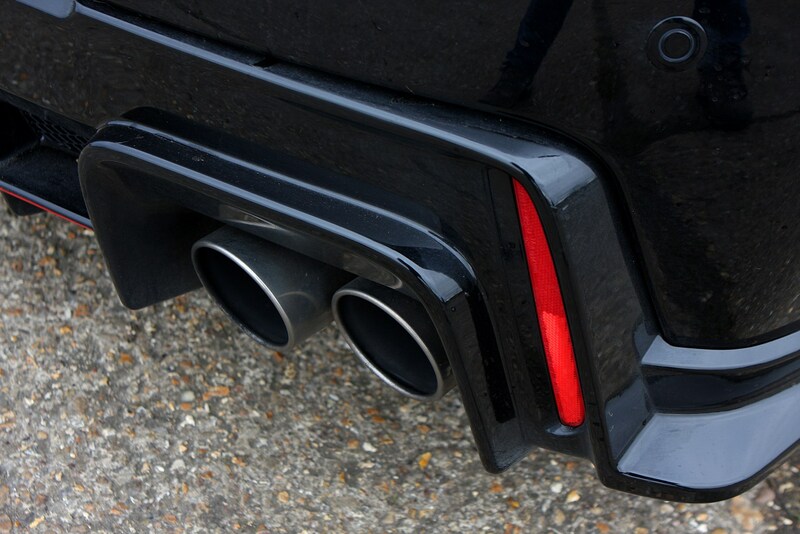 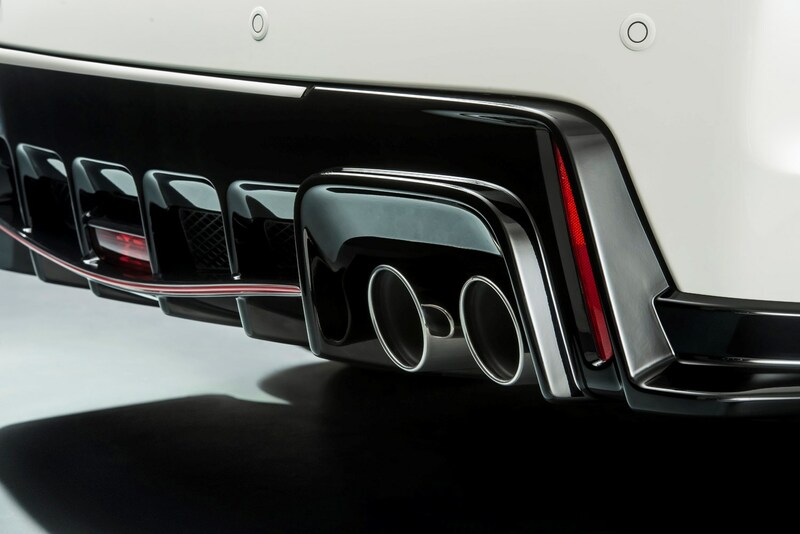 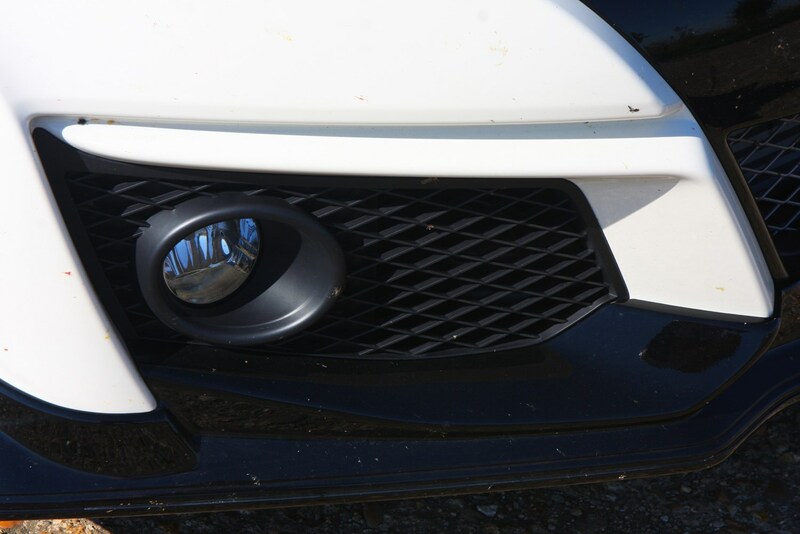 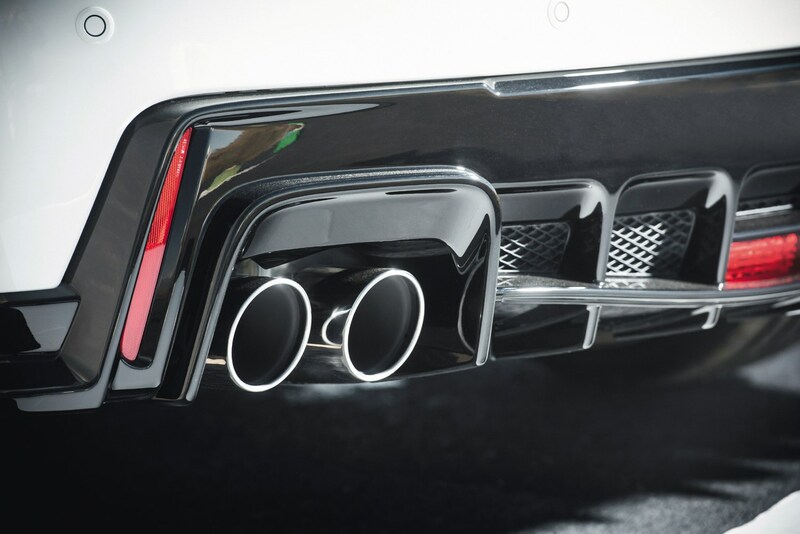 A long journey with the dual tailpipes blaring away will be enough to see occupants reaching for the upper echelons of the stereo’s volume control.